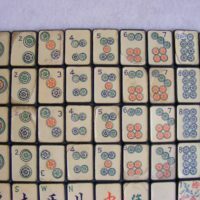 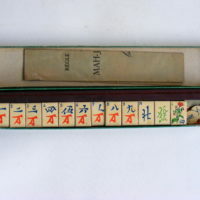 Production of Mahjong sets in France started at the same time as the craze hit the USA, it was very likely already known about, as it had been introduced in Germany. 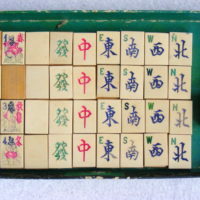 I think that the Babcock spelling was adopted by many firms, more as a ‘thumbing the nose’ at Babcock’s failed attempt to copyright the game than any conviction that this was the correct spelling. 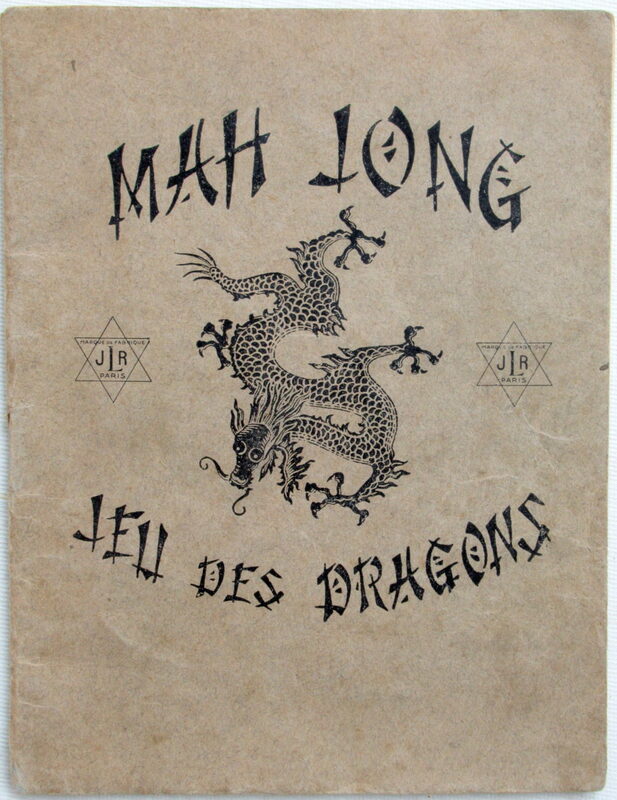 As with Britain, France was cash-strapped just post WWI, with very little spare money for expensive Chinese imports, so copies were made in French factories and sets only imported from China for the high-end range. 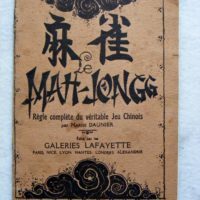 Sets were made from materials the French were very familiar with:- Casein, Ebonite, Celluloid/French Ivory, and of course Wood and Carton. 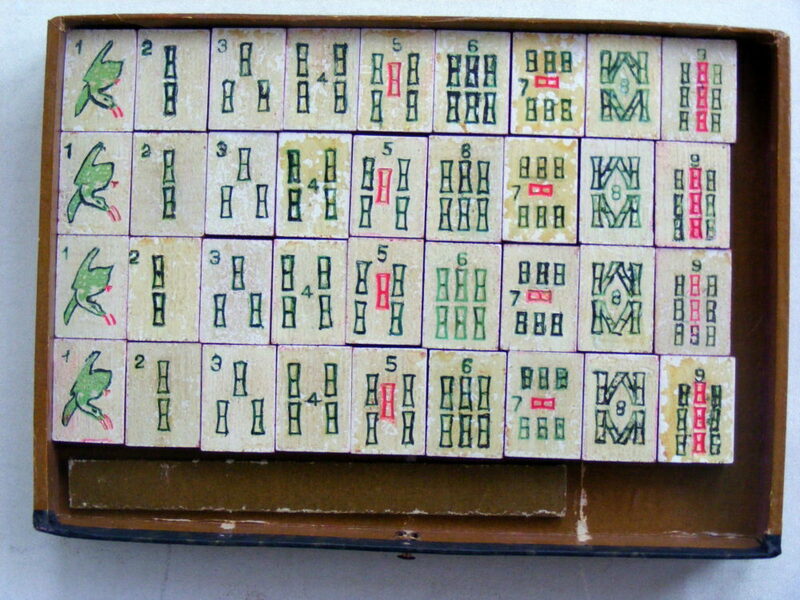 But French sets are, to my mind, a cut above the British sets, both in style of boxes and tile design. 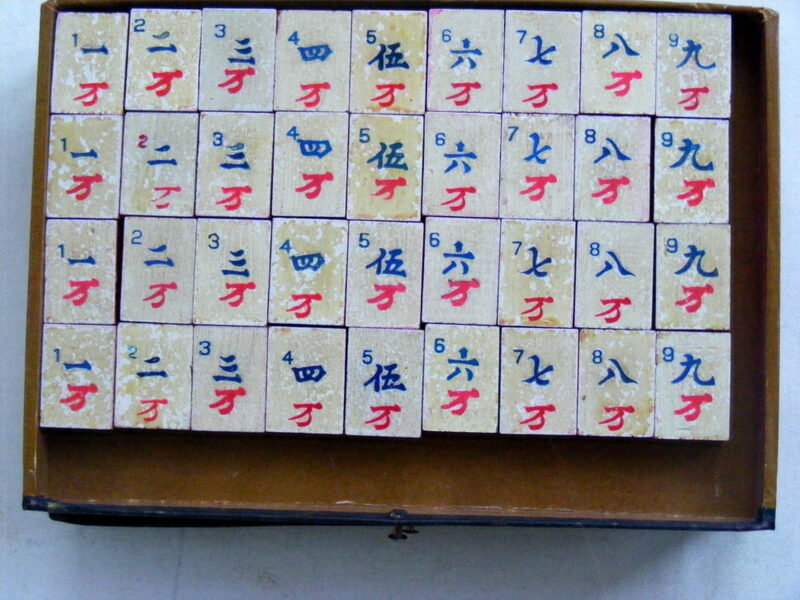 The list is not comprehensive – only the companies’ sets that I have heard of or possess. 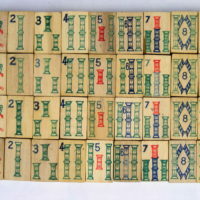 Arkmel:- They made cheaper sets almost exclusively from local materials like Wood and Carton, with very interesting and novel designs. 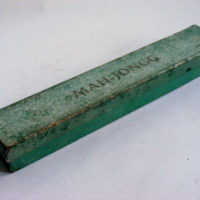 Being cheap, they were often used as advertising give-aways. 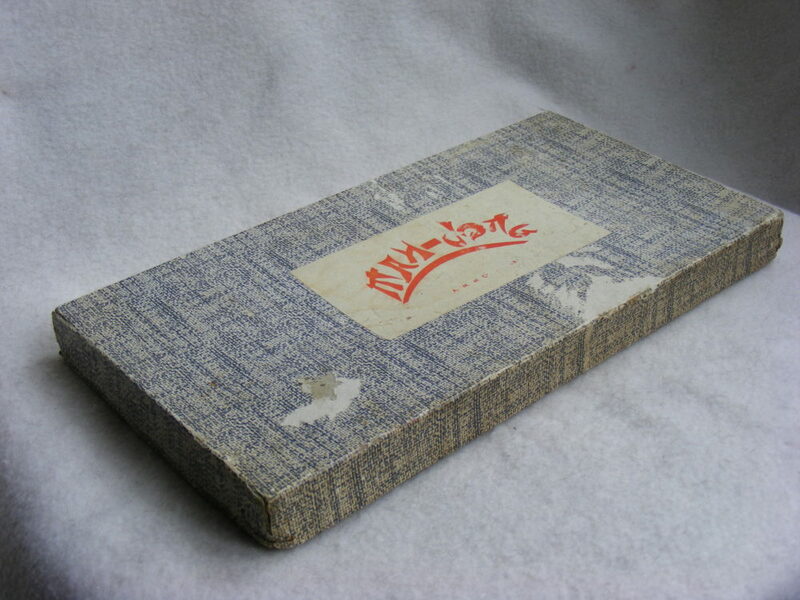 AM & Cie:- A later post-WWII maker producing cheap sets of 2-tone polystyrene. 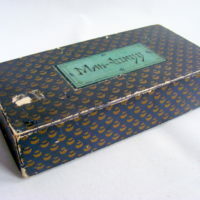 Bornemann:- They were more towards the high-end, with Casein sets in nicely-made boxes, but also making Wooden sets based on Chad Valley designs. 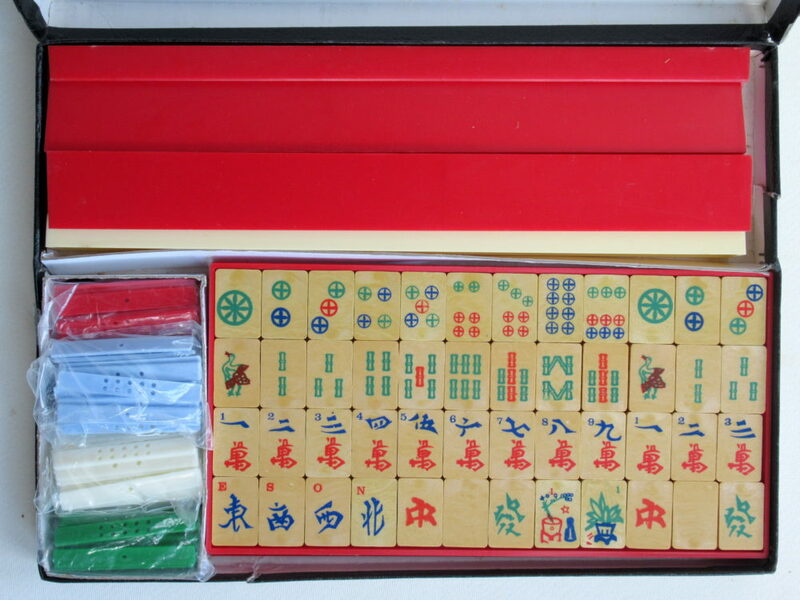 I can’t be sure, but I think they also imported Chinese Bone & Bamboo sets. 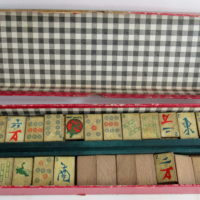 Galeries Lafayette:- Normally only marketed good quality Wooden or Wood/Celluloid Mahjong sets in a very distinctive colour palette, but I have a Casein set in a Burr Walnut box which is above the norm. 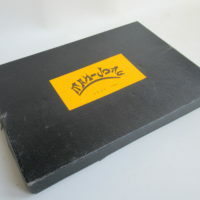 Imperial:- This company made high quality sets from Ebonite in only 2 styles that I know of. 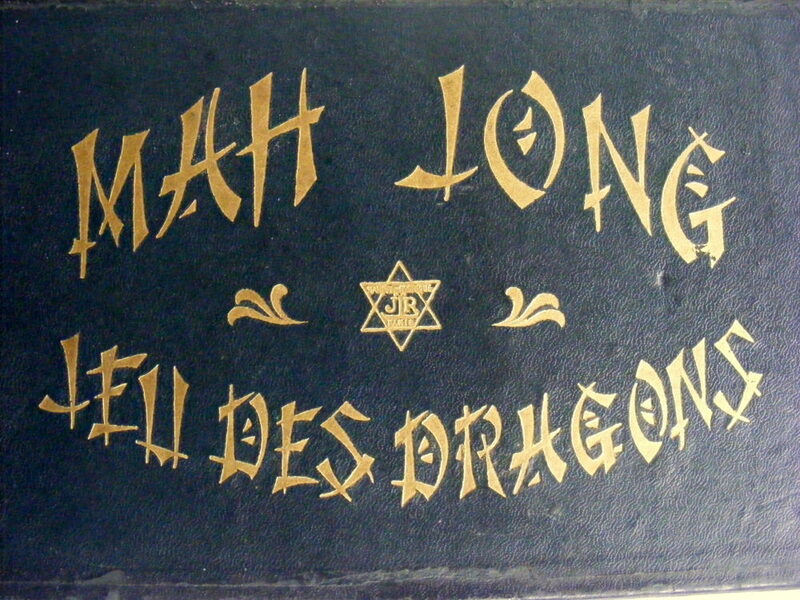 Jeu des Dragons:- The name adopted by Les Jeux Reunis (United Games) whose logo is a star of David – Jewish? 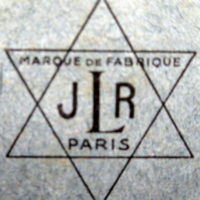 – with Marque Fabrique (Trade Mark) JLR Paris inside. 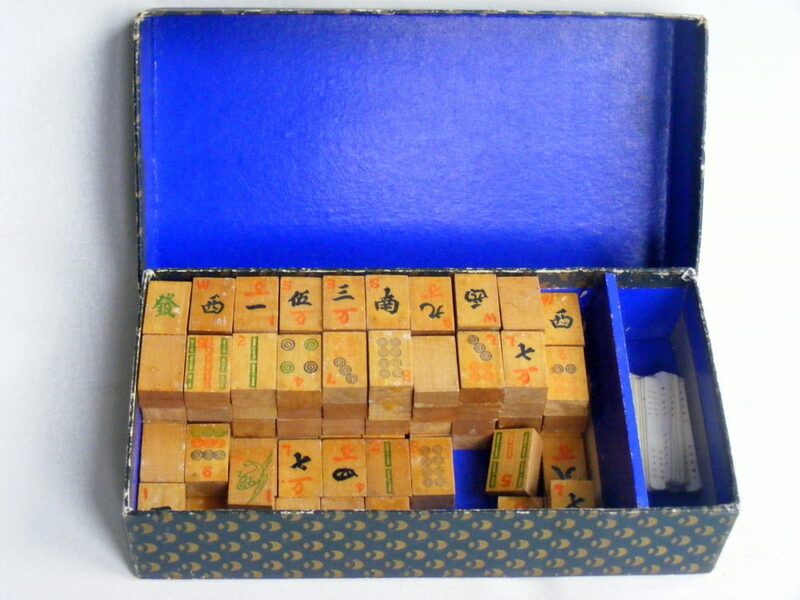 They made very desirable, excellent quality low-end sets in Wood, Wood/Celluloid and Carton. 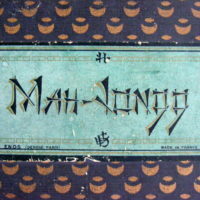 Lung-Chan:- They made (or imported) high-end sets in good quality boxes. 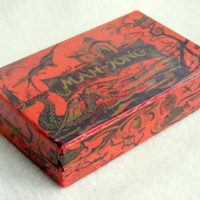 Maison de la Jeunesse(Youth House):- This company made a very quirky Carton set, in only one style. 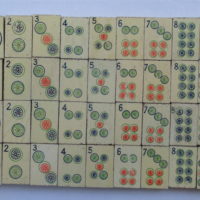 Miro:– Made a modern modified version of the game in carton. 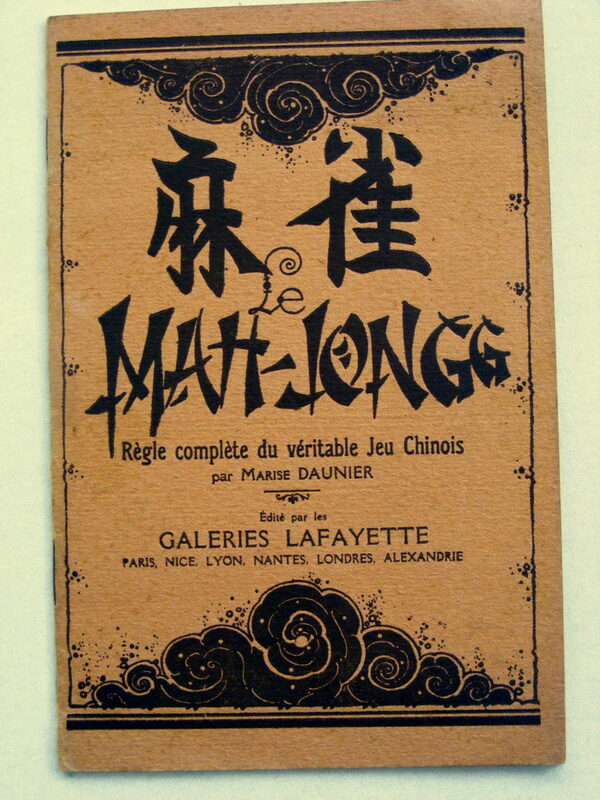 MLJ(Manufacture Lyonnaise de Jouets (Games)):- Made only one style in wood, as far as I know. 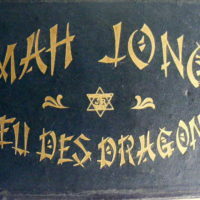 Unknown:– There are a few other makers who didn’t sign their boxes, but are almost certainly French. 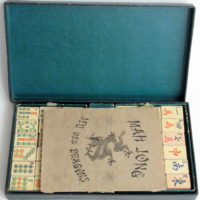 French Arkmel Green Box Carton Mah Jong Set. 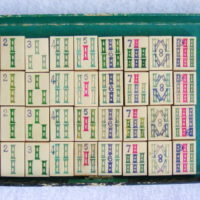 A cheap compact starter set from French maker Arkmel, often used as promotional give-aways, this is a faded green cardboard lift-top box measuring 290x54x37mm. 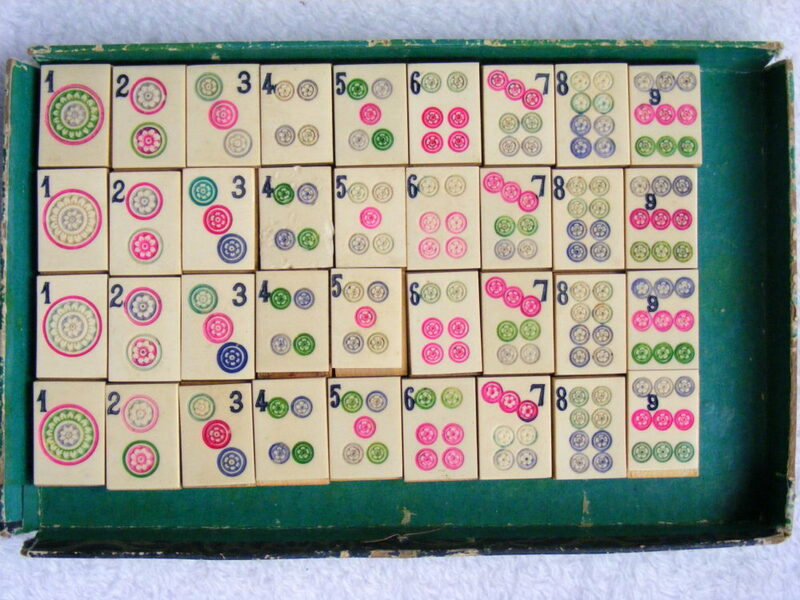 It houses 144 tiles (no spares - 1 missing), Wind discs, paper counters, rule booklet and 4 racks (3 green, 1 purple). 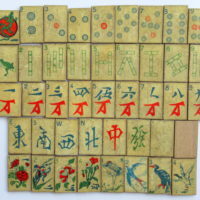 The tiles are in good condition with very little staining, made from punched carton, printed faces and cream backs, featuring the well-known Arkmel designs of Frog #1 Bamboo, Lizard #1 Circle, Bird Seasons and Flowers, measuring 30x20x2mm. 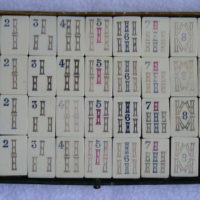 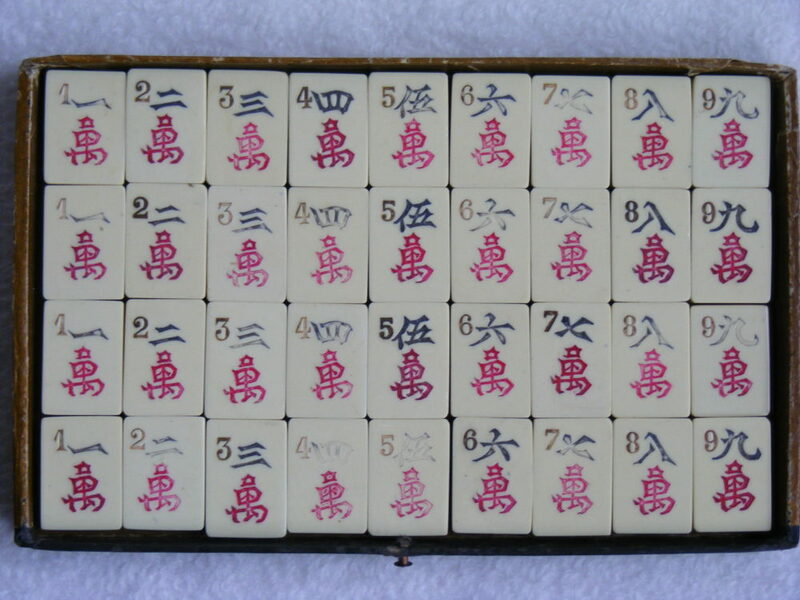 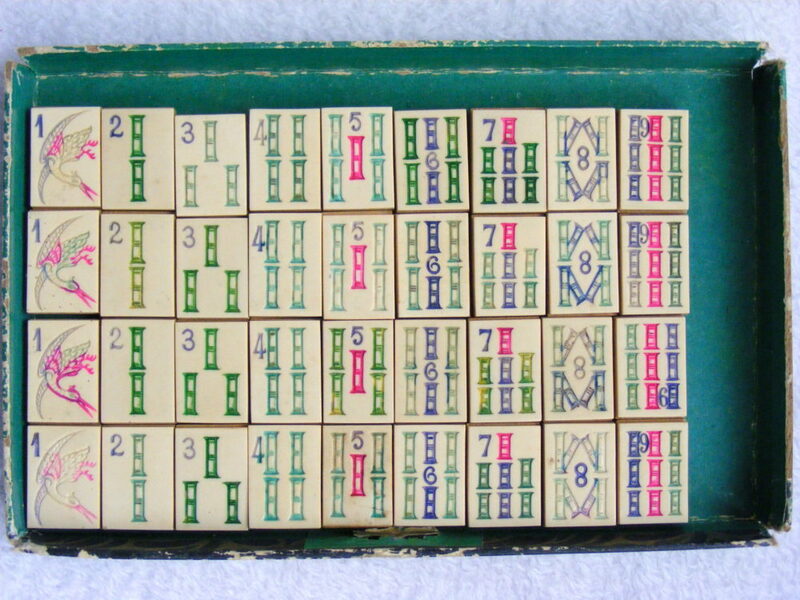 French Arkmel Chatelaine Carton Mah Jong Set. 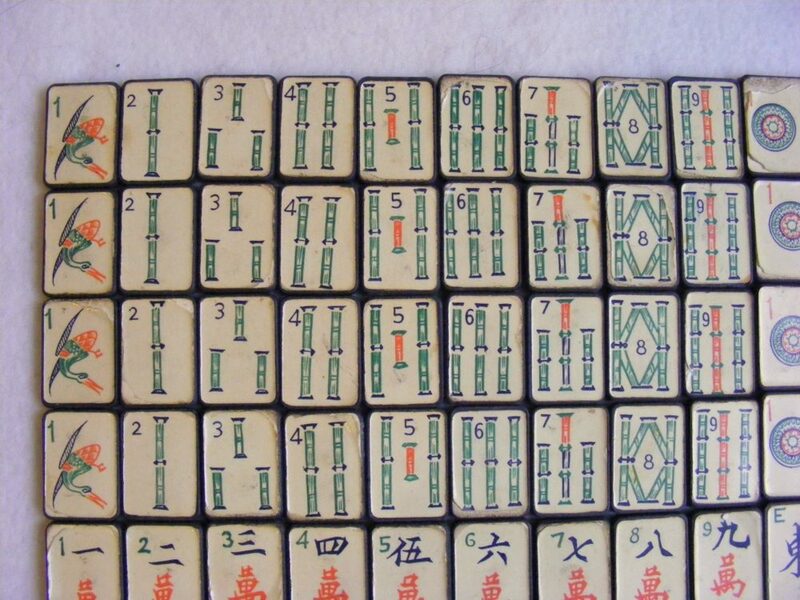 Essentially the same set as Ark1 hence it follows on from that set. 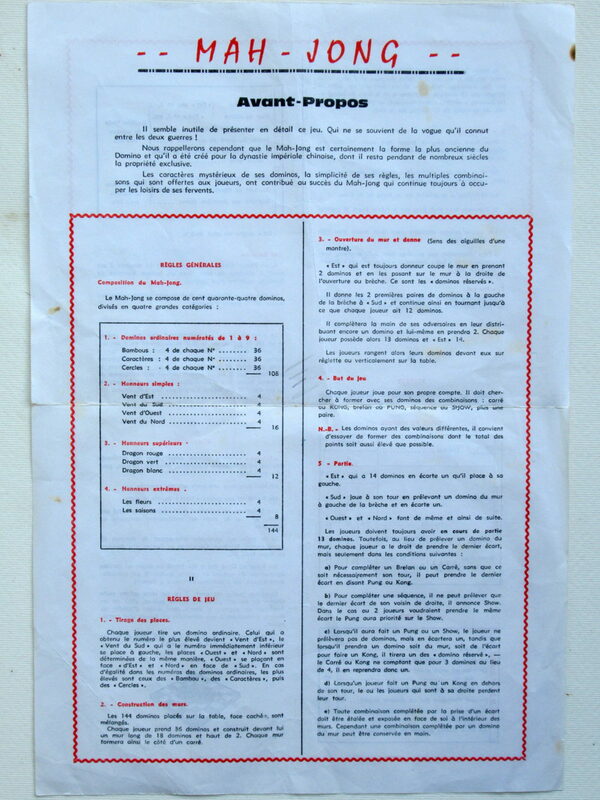 A promotional set for La Chatelaine by French firm Arkmel. 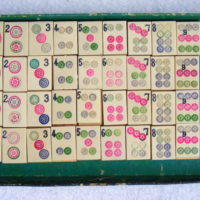 The box holds 3 purple & 1 green slotted racks, the 144 tiles, 4 dice, wind indicators, and thin rulebook. 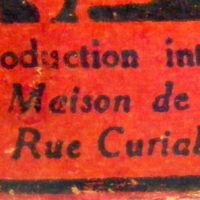 The tiles are slightly convex, the rear concave surface is printed "Visitez La Chatelaine". 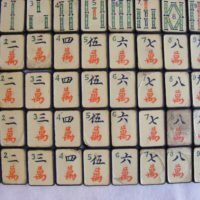 They feature the iconic Arkmel signature frog & lizard on the #1 Circle & Bamboo, quirky bamboo arrangement and unusual birds for Seasons. 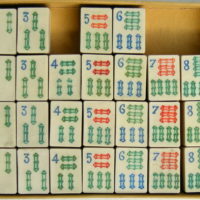 La Châtelaine is a commune in the Jura department in Franche-Comté in eastern France, which I assume is the source of this set. 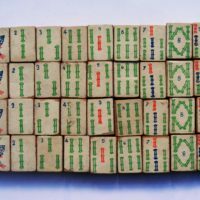 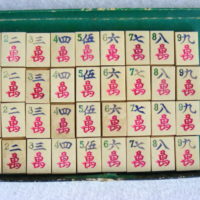 Arkmel Lancosme Red Box Wood Mah Jong Set. 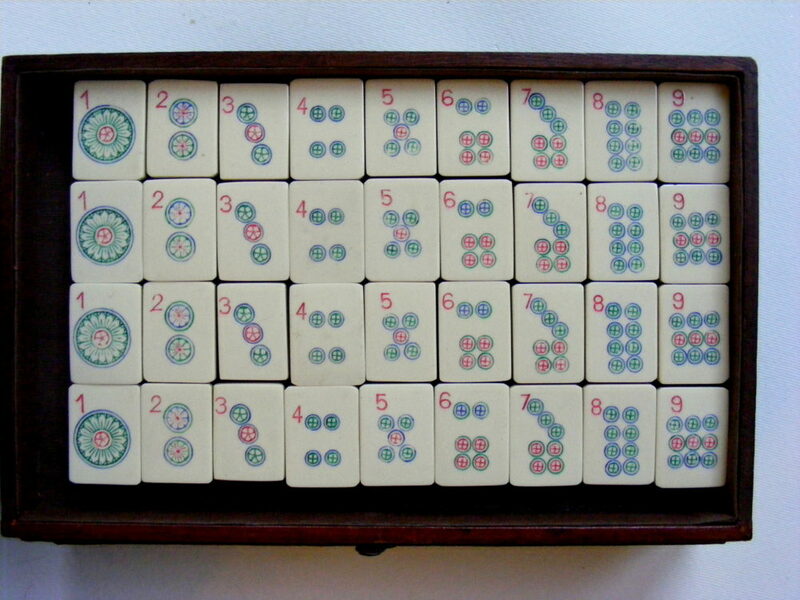 This is a very desirable and rare set made by Arkmel for Lancôme, France, commonly called the Frog or Lizard set. 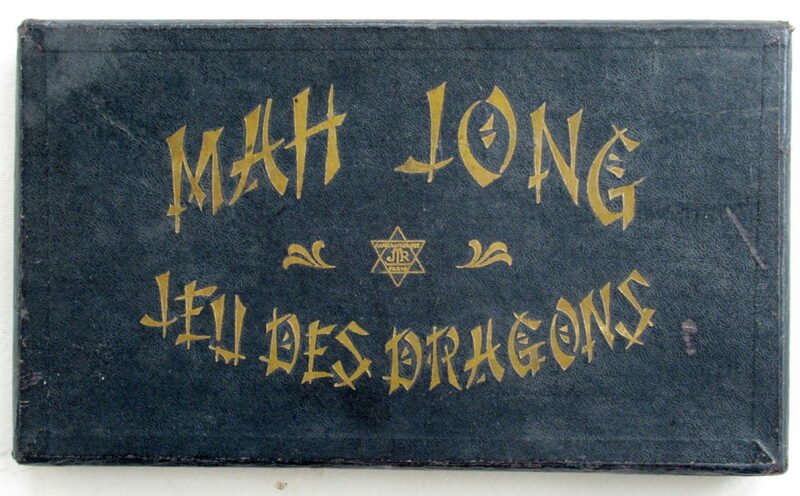 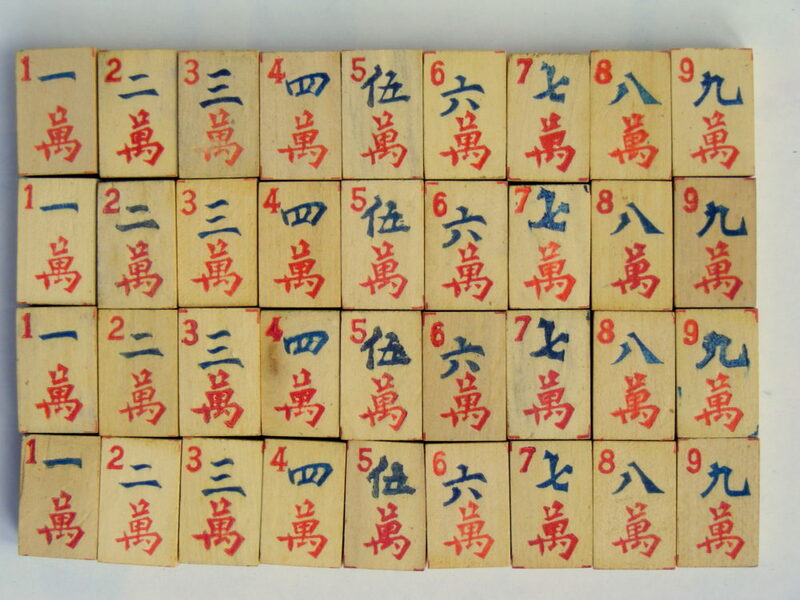 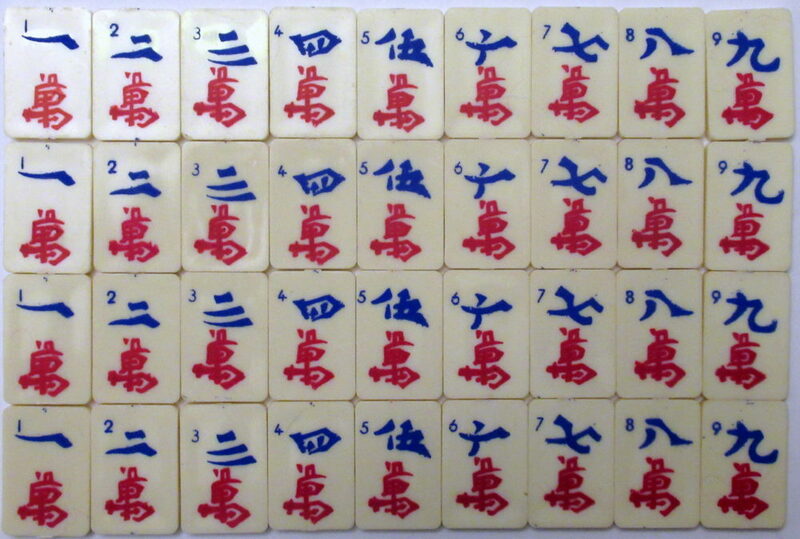 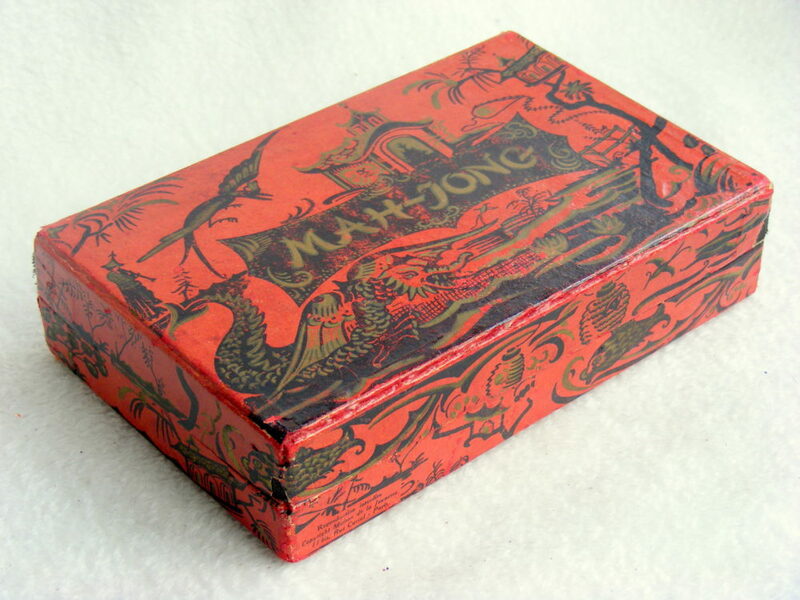 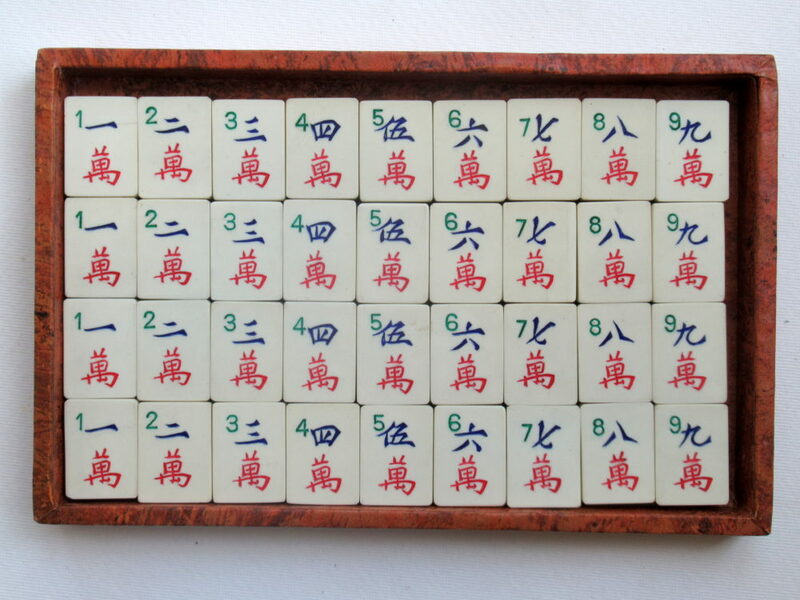 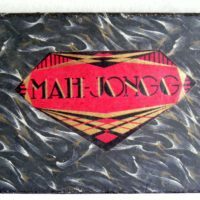 The plain red box measures 310x160x35mm with MAH-JONGG logo in faded gold and a decal in the corner. 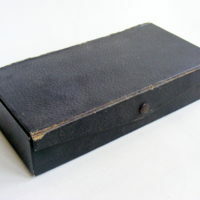 The box is flat, lift-top with black gingham paper interior. 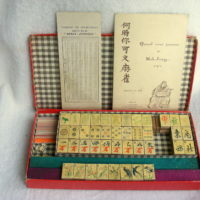 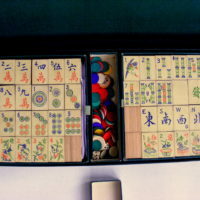 However that did not prevent it using promotional items, like this Mah Jong set, to raise its profile in the beauty industry. 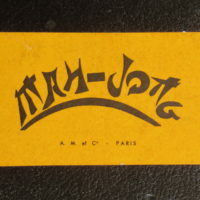 The style of the set goes against the Art Deco style, which the founder Armand Petitjean disliked, hence the naturalistic images. 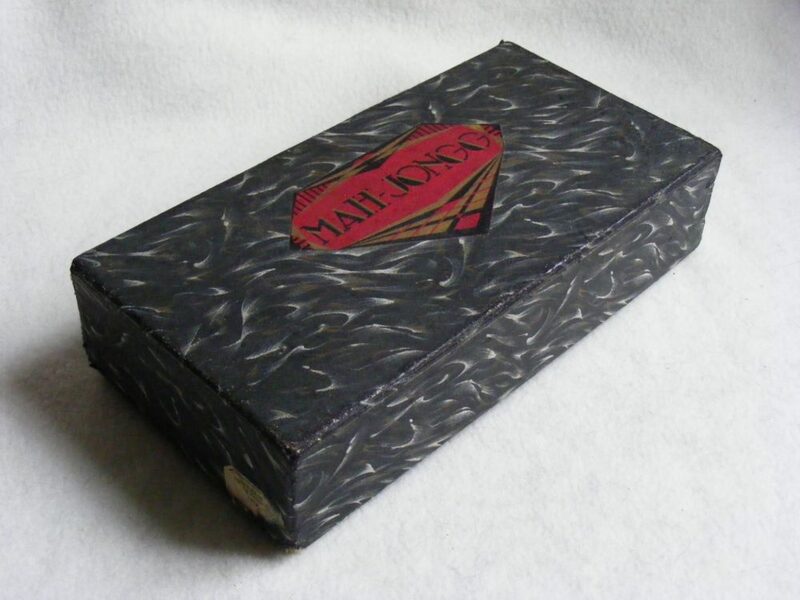 The firm was acquired by L'Oreal in 1964, which dates this set between those dates, but the house changed its name to Lancôme almost immediately in, so I’m dating this set to 1935-6. 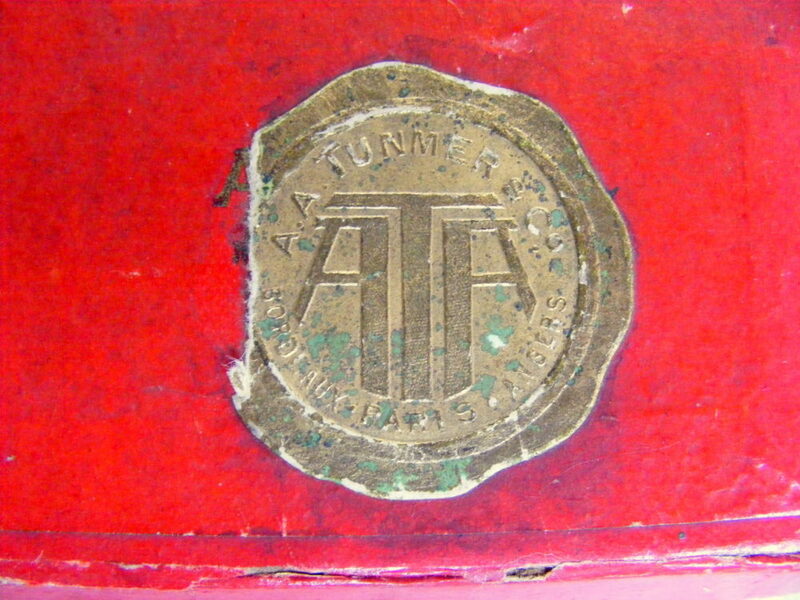 Decal for A.A.Tunmer & Co, Bordeaux, Paris, Angers, who I presume is the retailer? 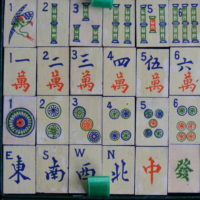 Unusual are the frog #1 Bamboo, the arrangement of the Bamboos, the shape of the tiles, and birds for the seasons. 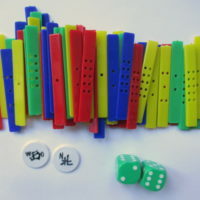 The box houses a tray for the tiles, the card counting sticks, 3 dice and 2 (of 4) wind indicators, plus there are 1 purple and 3 green racks. 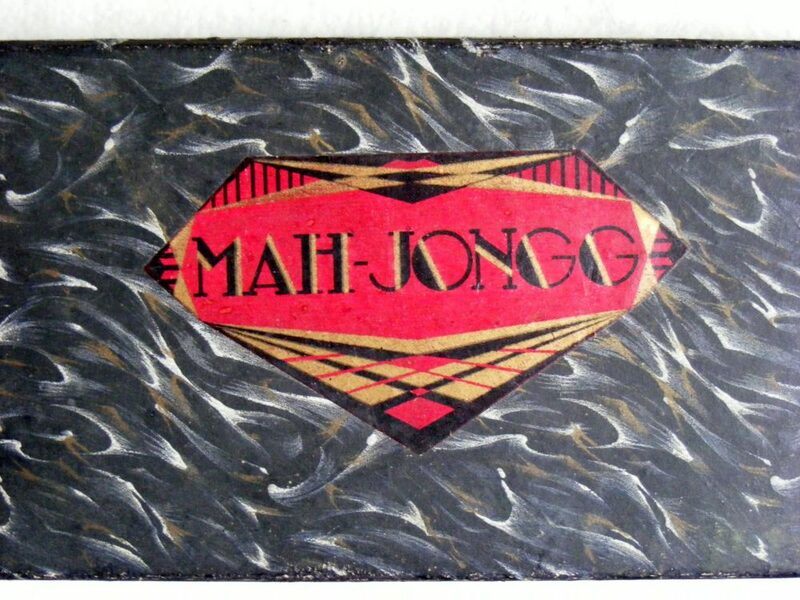 Made from thin hardwood with a printed paper wafer. 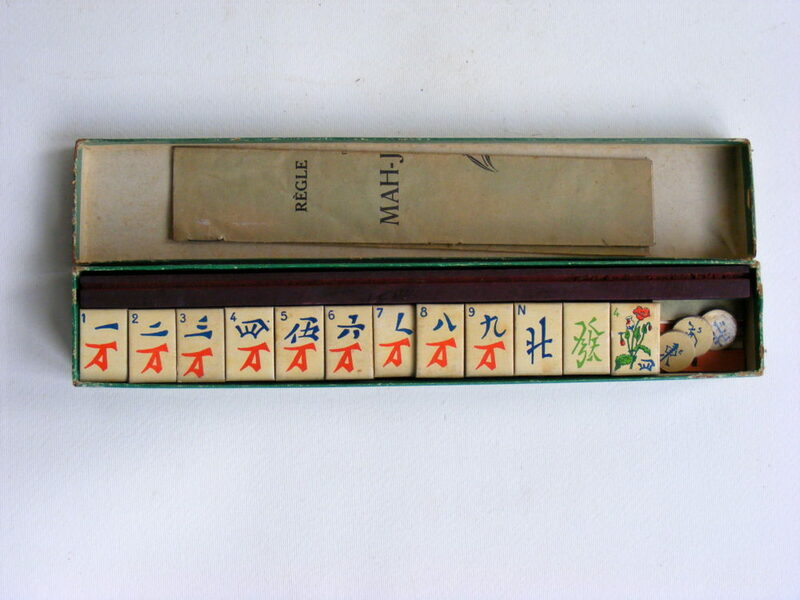 French Arkmel Red Box Wood & Paper Mah Jong Set. 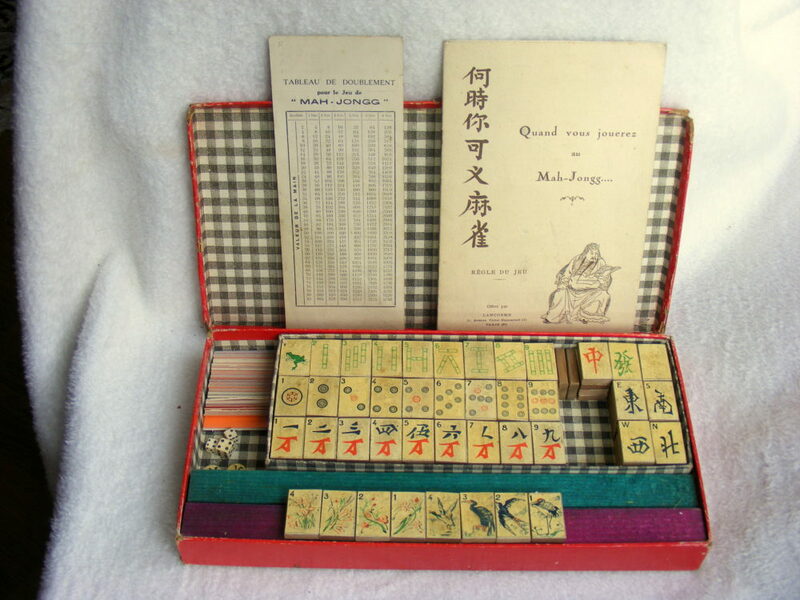 I already have one of these quirky little French sets, but this went quite cheaply and it is a full set. 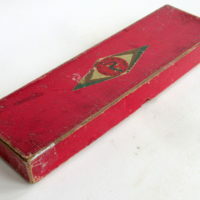 The box measures 310x160x35mm and is cardboard covered in red paper with the Arkmel lizard logo on top, measuring mm and holding the tiles, racks, dice and Wind discs. 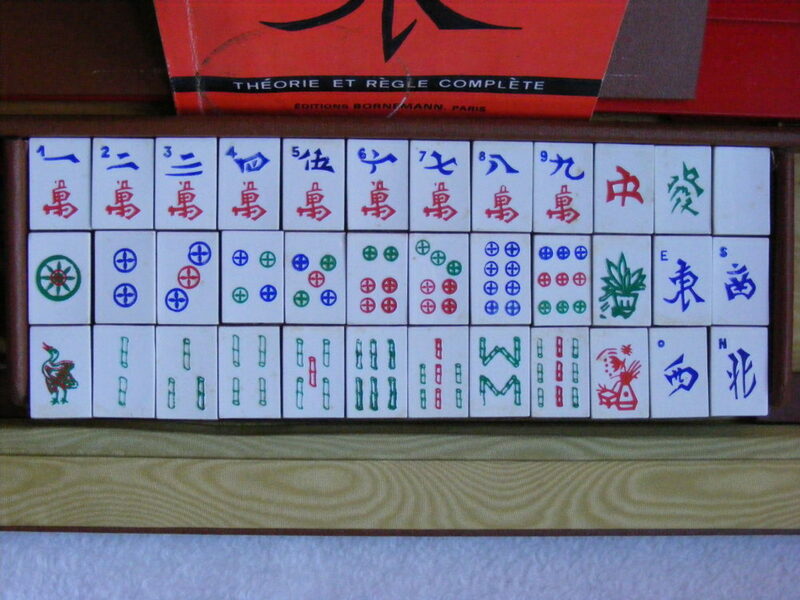 This set was intended for export as there is no O for Oest (West), evidently how it ended up in the UK, although the rulebook is French. 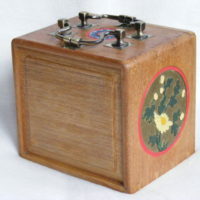 Internal view of the box. 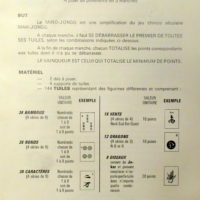 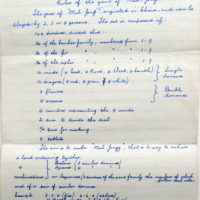 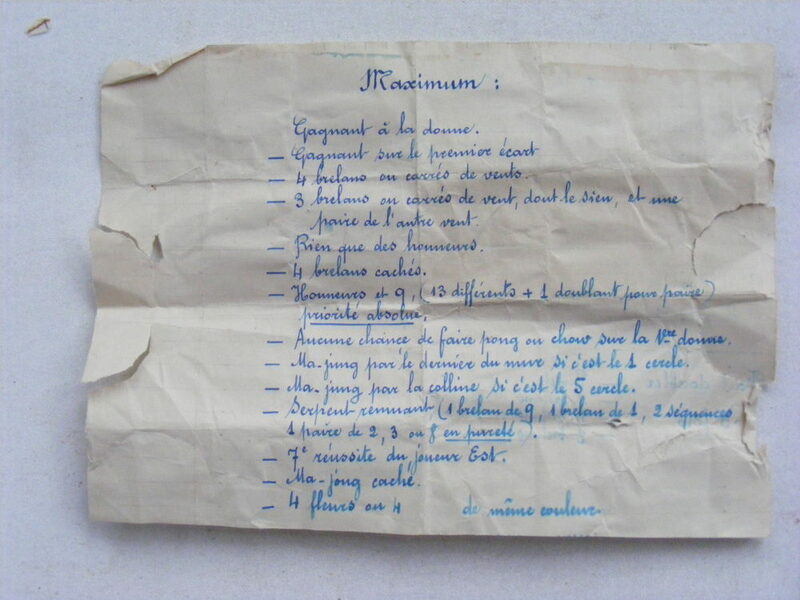 Those interested in Scoring might like the hand-written scores in French. 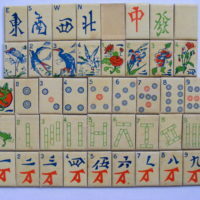 The tiles measure 29x19x6mm and feature the standard Arkmel designs with their unique layout of the Bamboos and Circles with Frog & Lizard as #1s, birds for the Seasons and plants for the Flowers. 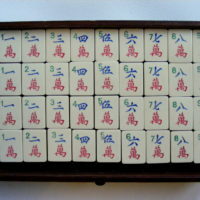 French Arkmel Red Box Wood&Paper Mah Jong Set. 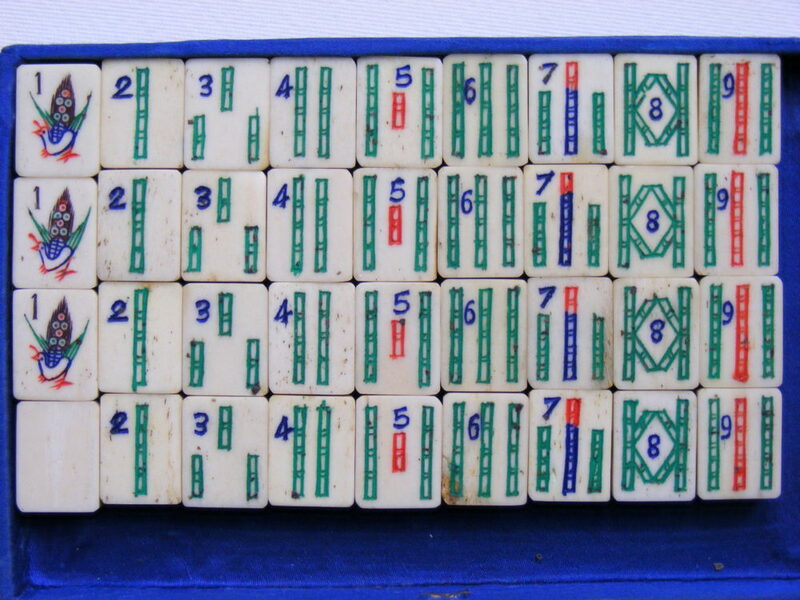 I already have a few of these quirky little French sets, but this set is a slightly slimmer format. 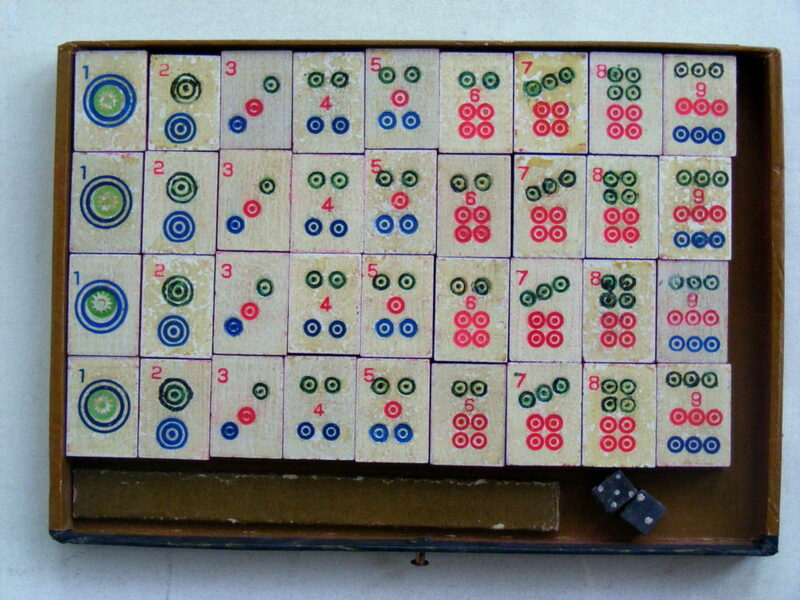 The box is cardboard covered in red paper with the Arkmel lizard logo on top, measuring 290x90x40mm and holding the tiles, rudimentary racks, dice and Wind discs. 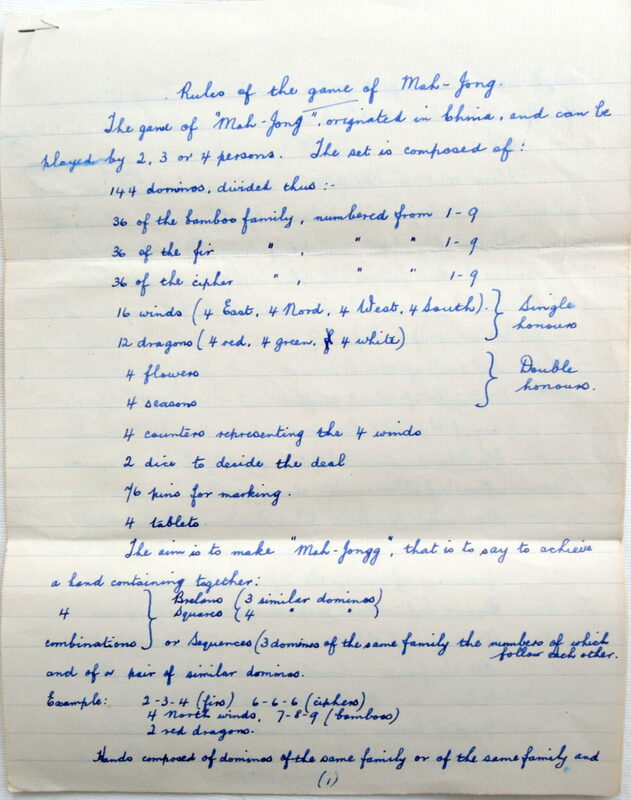 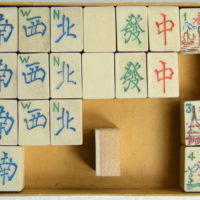 This set was intended for export as there is no O for Oest (West), evidently how it ended up in the UK, although the comprehensite slim rulebook is French, there are hand-written rules in English. 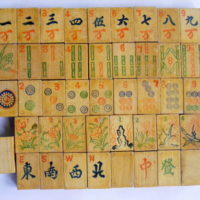 The tiles are made from nice beech, but badly cut, measuring 28-31x18-20x3mm and feature the standard Arkmel designs with their unique layout of the Bamboos and Circles with Frog & Lizard as #1s, birds for the Seasons and plants for the Flowers. 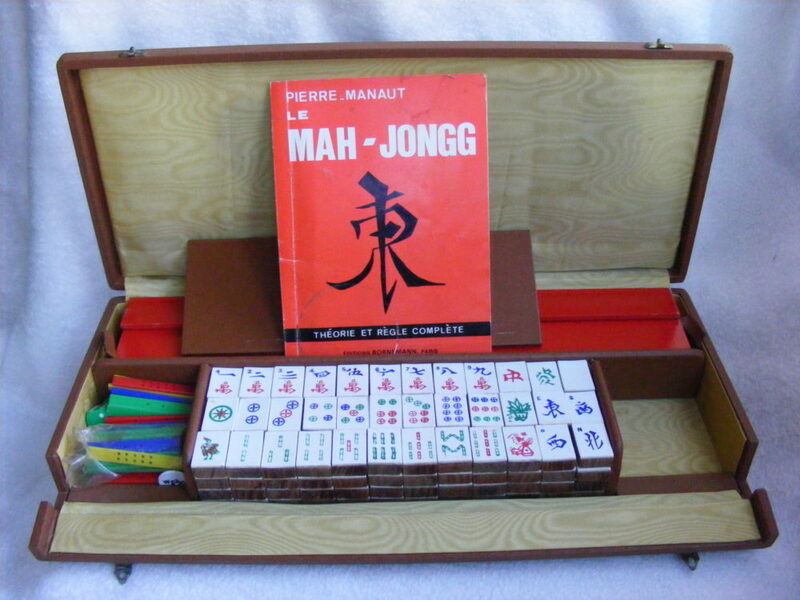 French AM & Cie Brown Case Acetate & Wood Mah Jong Set. 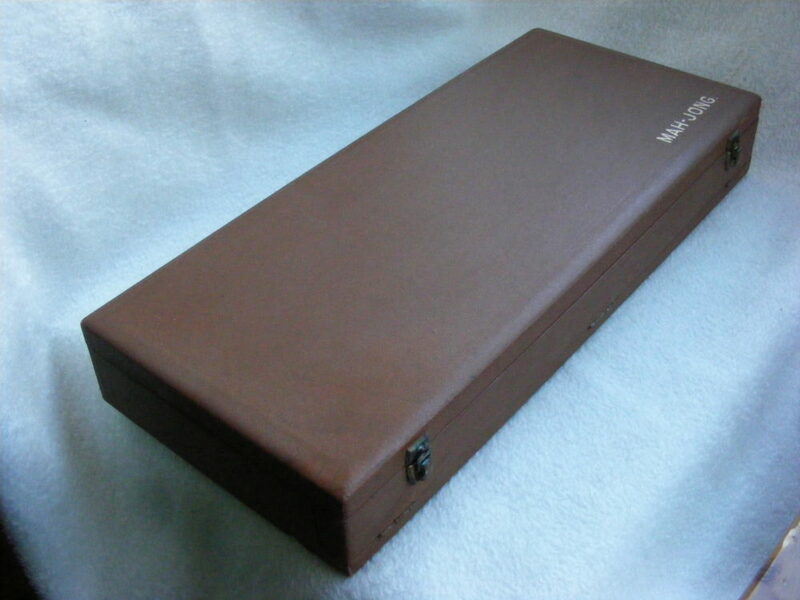 The box, measuring 420x190x60mm, is covered in brown rexine, slightly scuffed, which restored with acetone. 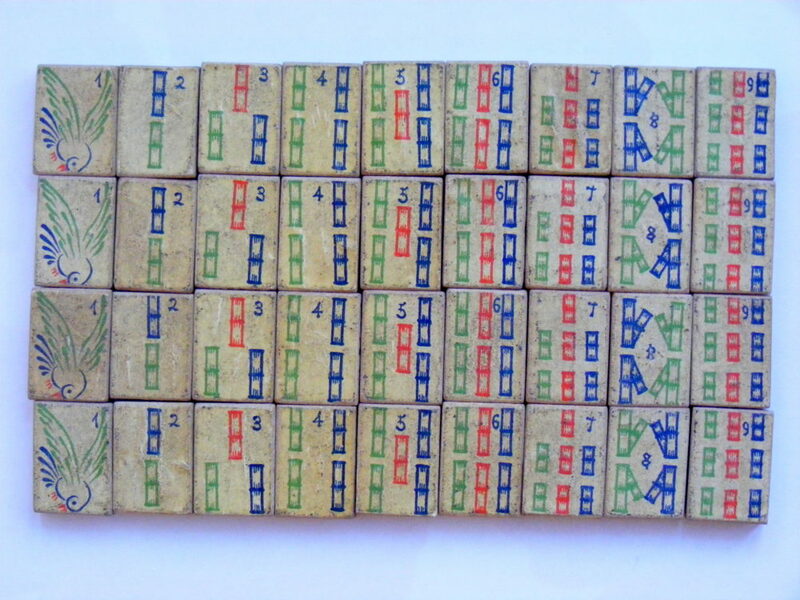 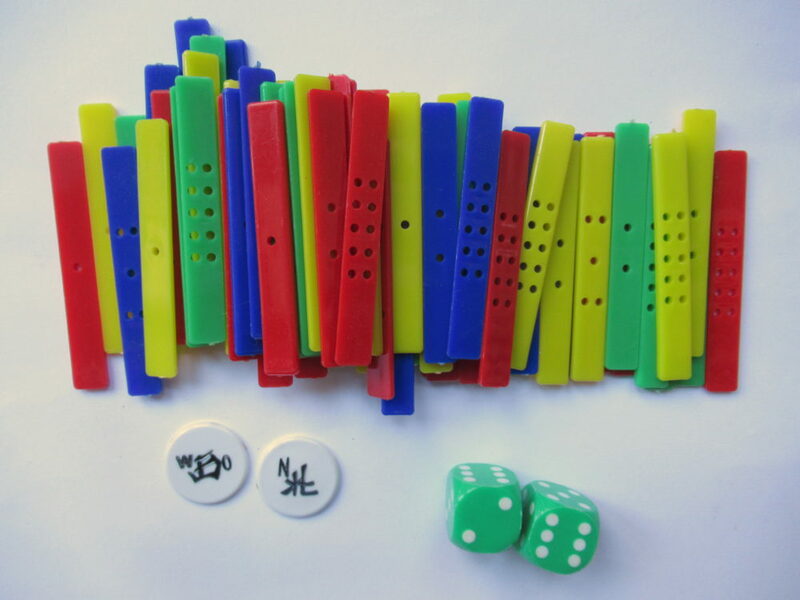 Comes with 4 tile racks, polystyrene counting sticks, dice, wind indicators and French instructions by Pierre Manaut dated 1967. 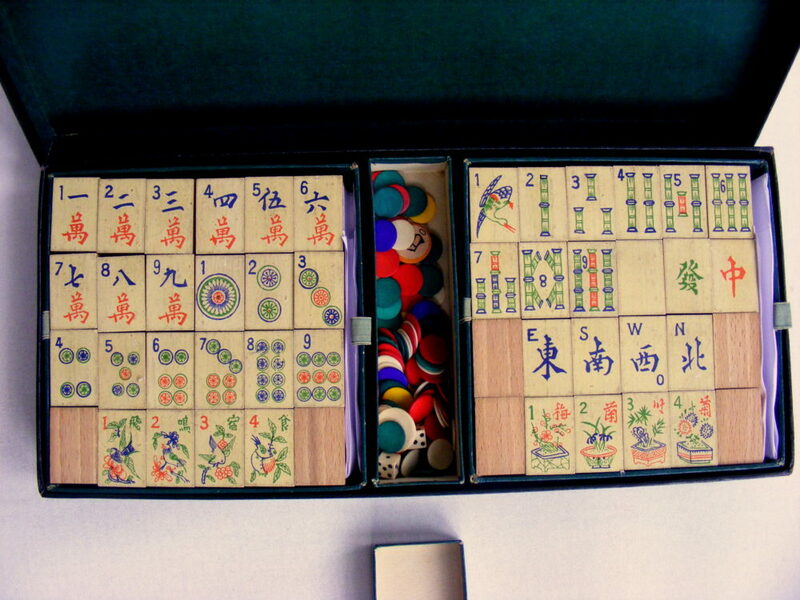 A nice set, although the glue holding the faces to the wooden bases is deteriorating, so will need re-doing at some stage. 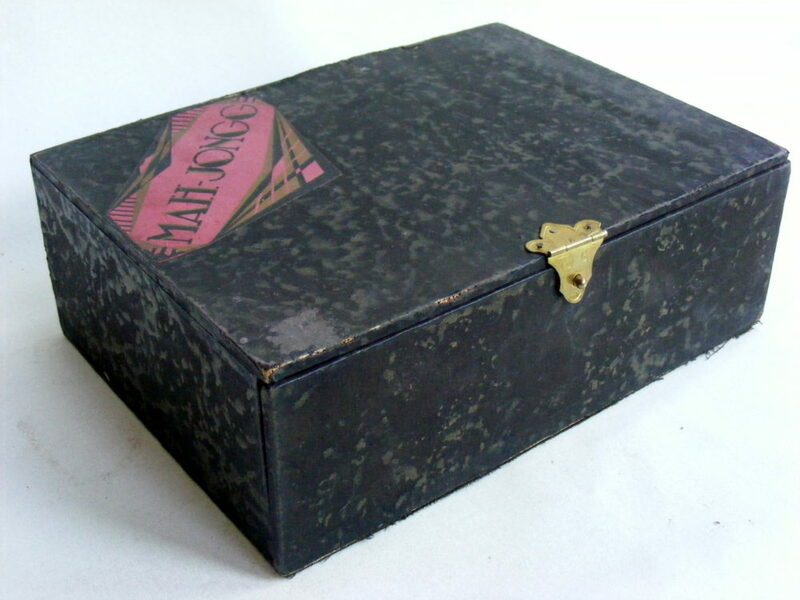 The inside is covered in cream sateen. 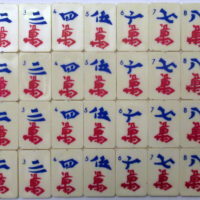 The tiles are 30x20x10mm. 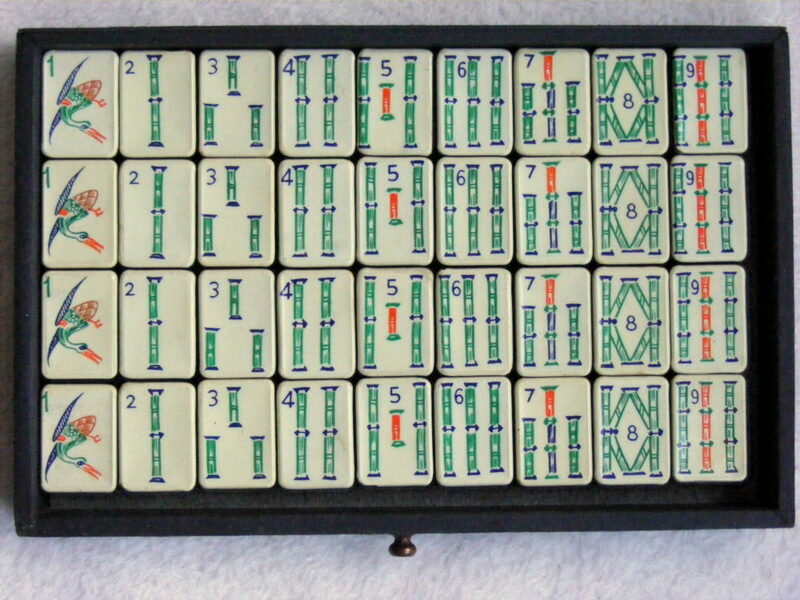 The designs are impressed into the Celluloid, but quite fuzzily, featuring the standard AM tile set. 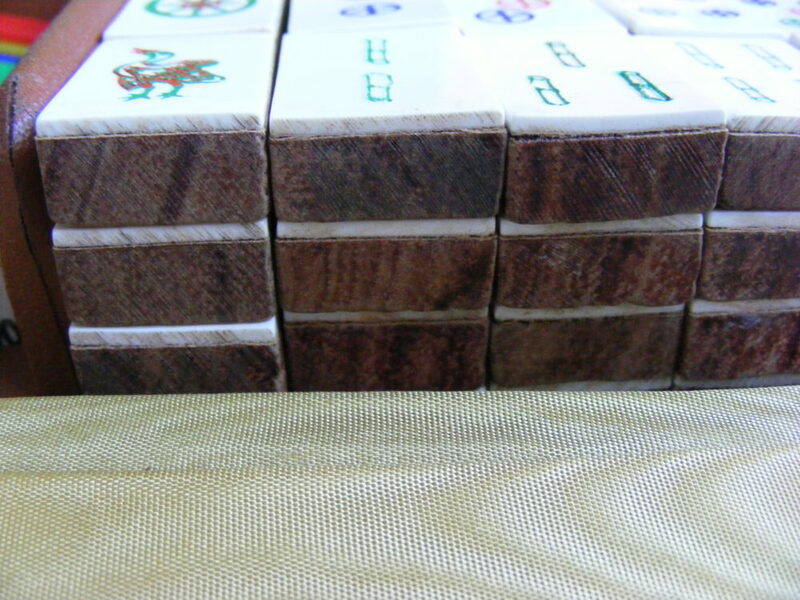 The tiles appear to be 1.5mm Celluloid/Acetate on 8.5mm Mahogany (or similar unstained, nicely finished dark hardwood - Walnut? 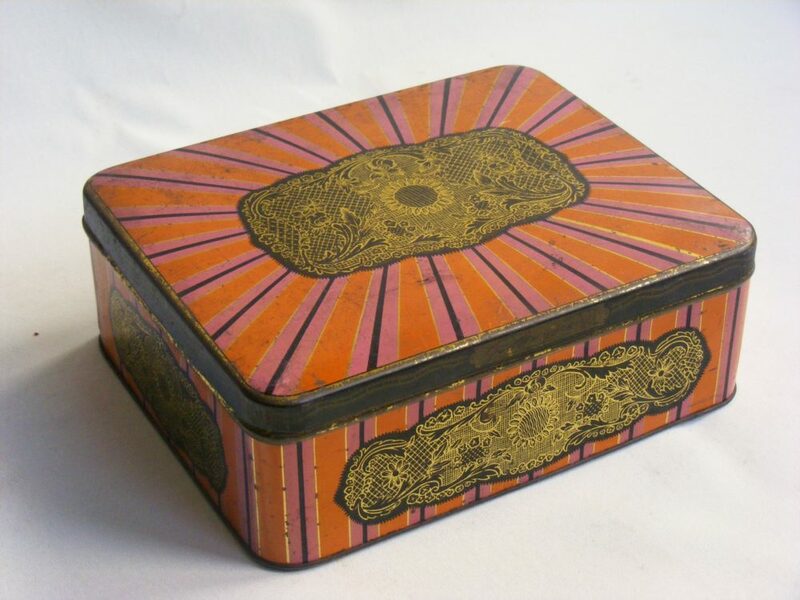 ), probably made by A.M.& Cie, Paris; I have a polystyrene set from this manufacturer with the same designs, so safe to assume it's by them. 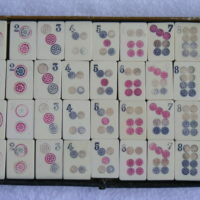 Strange that the counters are polystyrene, but the tiles have Celluloid faces - the polystyrene dates this set to 1950+. 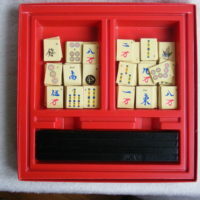 French AM & Cie Plastic Mah Jong Set. 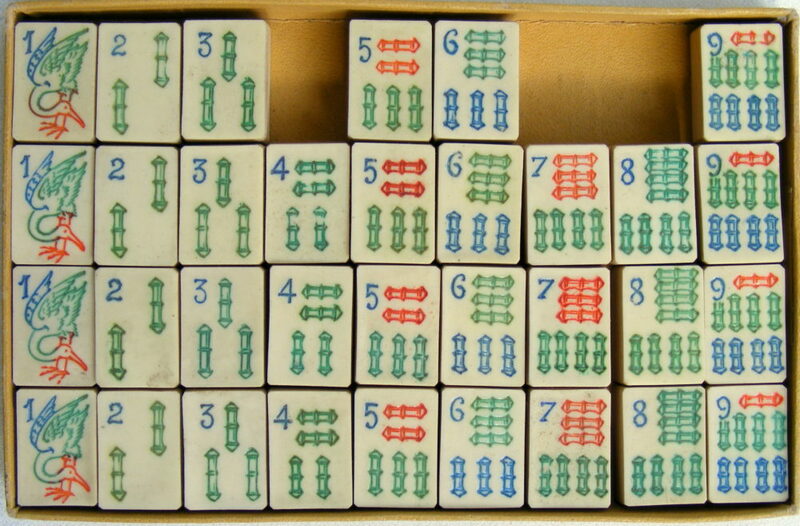 A cheap French plastic set made for the home market (with O for West) complete with hardwood racks, but no counters, dice or instructions. 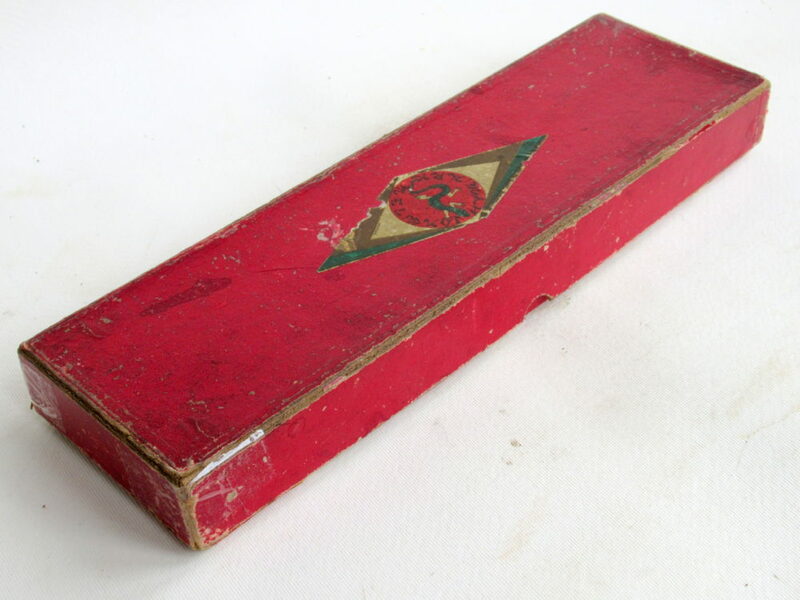 Box is card with lift-off top, measuring 310x160x27mm, manufactured by A.M. et Cie, Paris. 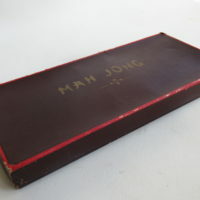 No idea of age, but polystyrene indicates mid-1950s at the earliest, style of box looks 1960s. 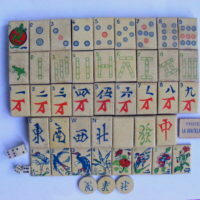 Tiles are injection-molded polystyrene plastic with impressed star on the reverse, measuring 30x20x4mm and have the design colour-etched into the surface, rather than printed; feature unusual flapping bird #1 Bamboo, uneven Bamboo rods, 'wheel' Circles and stunted Red Dragon. 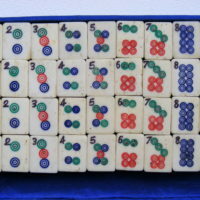 French AM & Cie Morize Plastic Mah Jong Set. 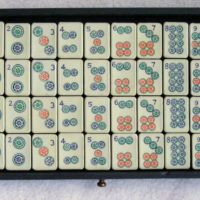 I have a similar AM & Cie set, but not this plastic with the swirled effect. 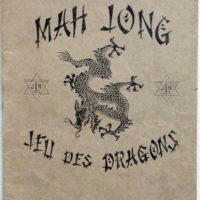 It features printed designs with Cartwheel Circles, unusual strutting bird Bambird, complex wan Craks, stylised Winds, Dragons & Flowers, with O (Oest) for West wind so made for the FRench domestic market. 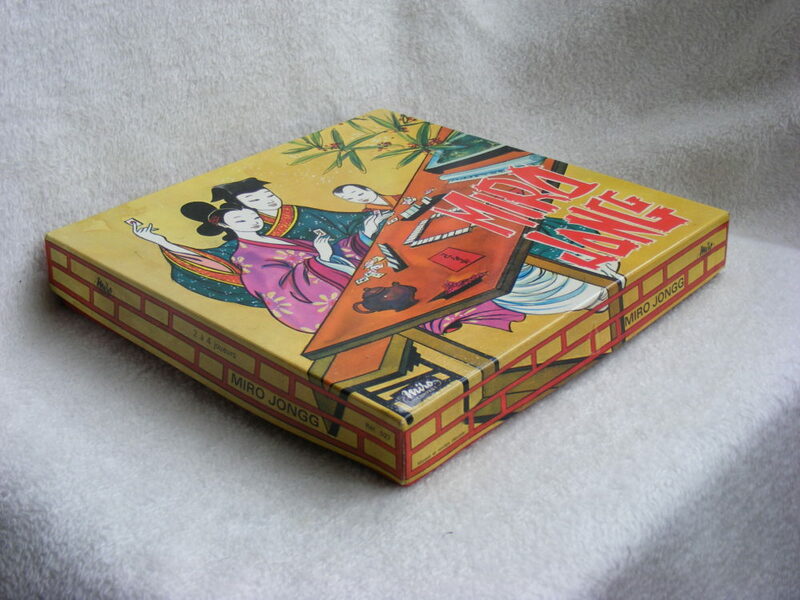 It is Polystyrene, the usual material of this maker, it's in very good condition, the counters are still wrapped. 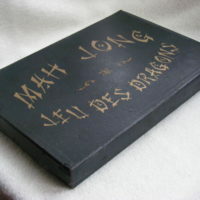 French Bornemann Brown Box Casein Mah Jong Set. 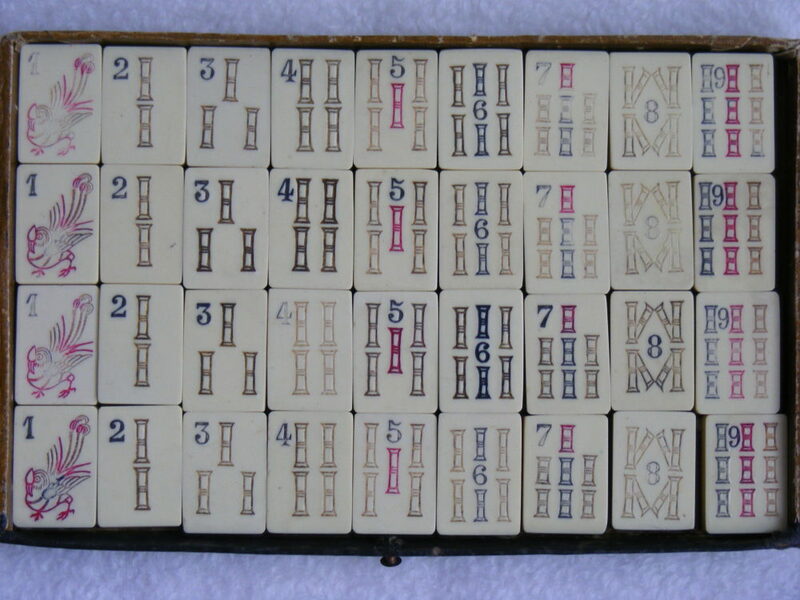 Bought from France for about the right price, I'm calling this a Bornemann set, as it has this distinctive Bambird which I also have in a Bornemann redback casein set in a leather box. 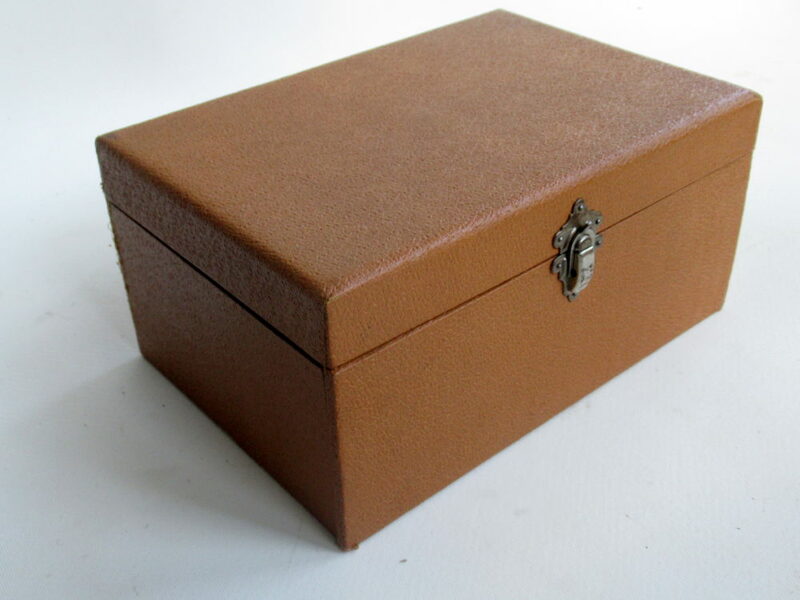 The wooden box has an outer brown faux shagreen covering and walnut burr paper on the inside and trays, no markings ar all, but very nicely made. 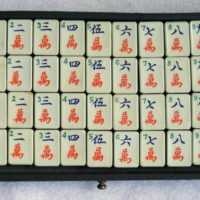 It measures 220x150x105mm with flip top and drop-down front, housing 1 large tray for the casein counters and dice and 4 small trays for the tiles. 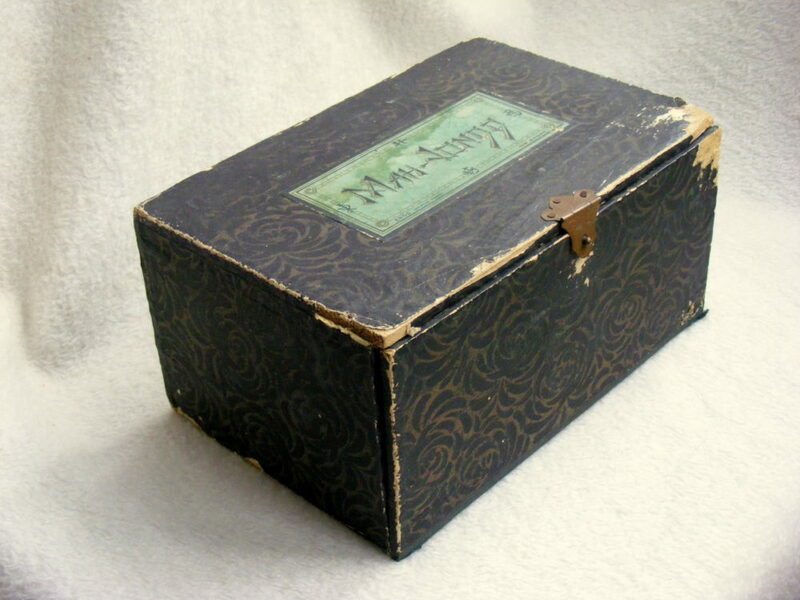 The box needs a little attention, but otherwise it is a brilliant buy! 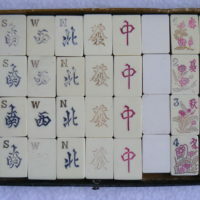 The casein tiles measure 29x21x10mm with the designs impressed into the surface, featuring swooping peacock Bambird, separate serifed Bams, flowery Circles, complex wan Craks, standard Winds and Dragons with Flowers and Gentlemanly Arts. 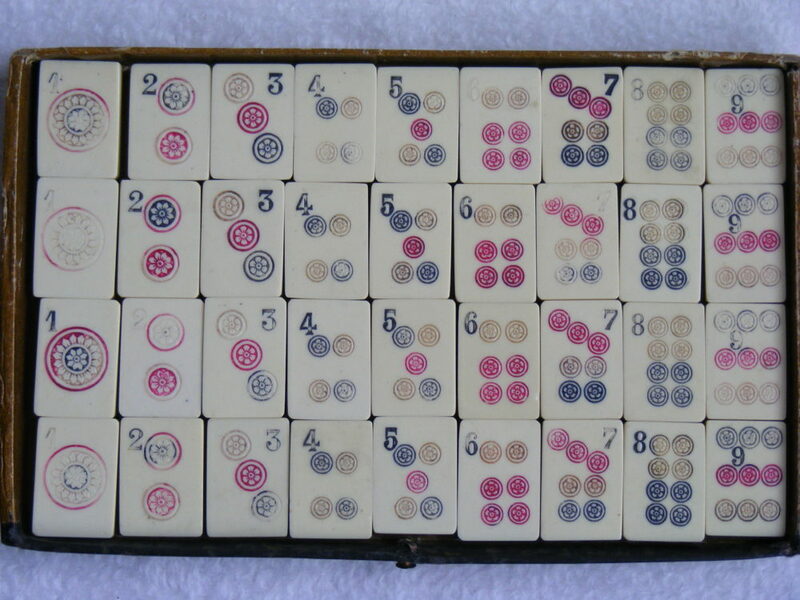 All in very nice condition, with no paint loss or wear. 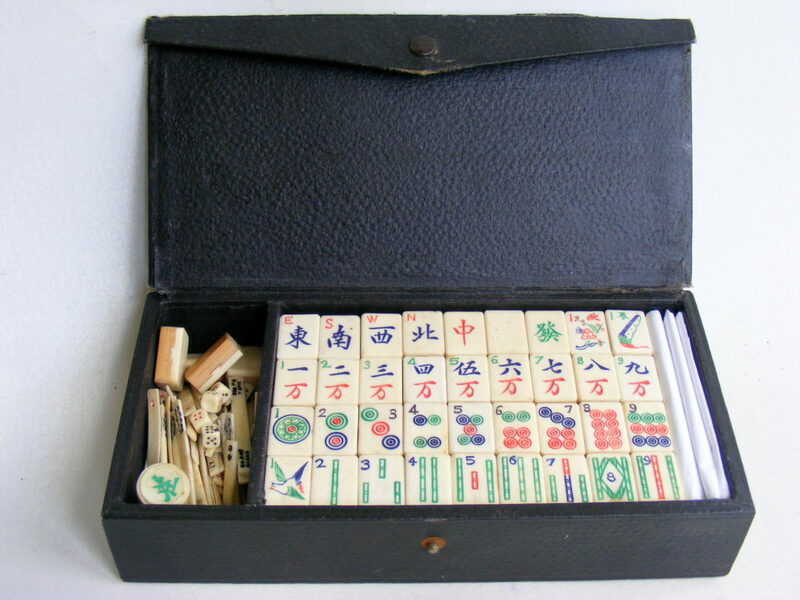 French Bornemann Leather Box Redback Casein Mah Jong Set. 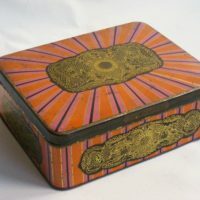 Bought from France for a very reasonable Buy it Now price, the box is a wooden carcass covered in leather and embossed with red and gold borders, but most of the gold is gone. 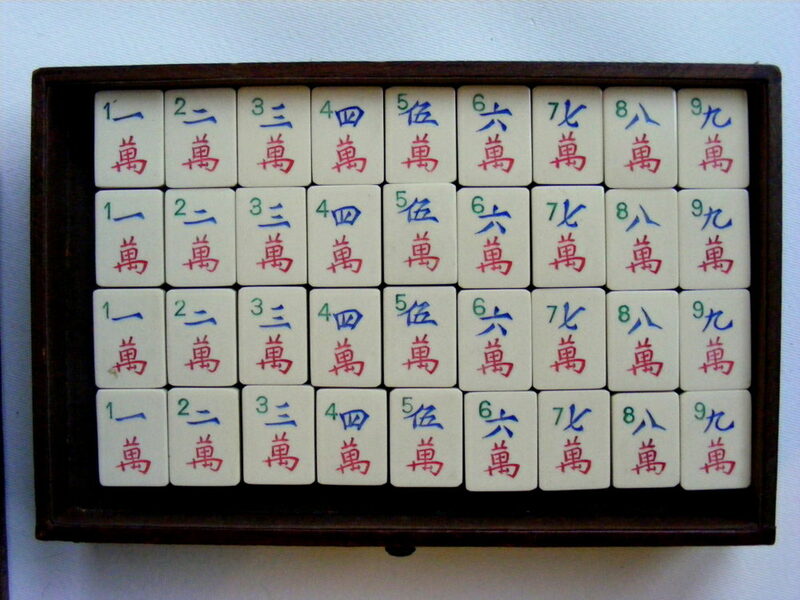 It measures 230x165x150mm - I haven't seen one in this style before. 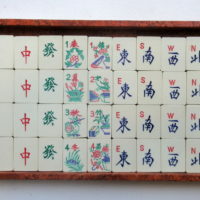 The set has a few problems: missing front panel; broken left slider, but I have the broken piece; the bottom pull is missing; bits of missing leather; many tile backs have become detached. 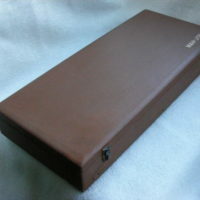 Hopefully I can create a new leather front, and the loose backs can be re-glued with no problem. 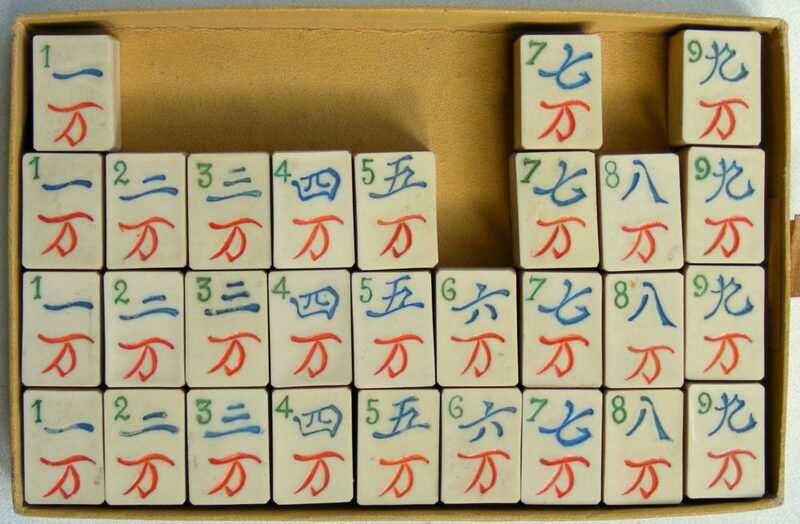 I'm quite pleased to get this unusual example. 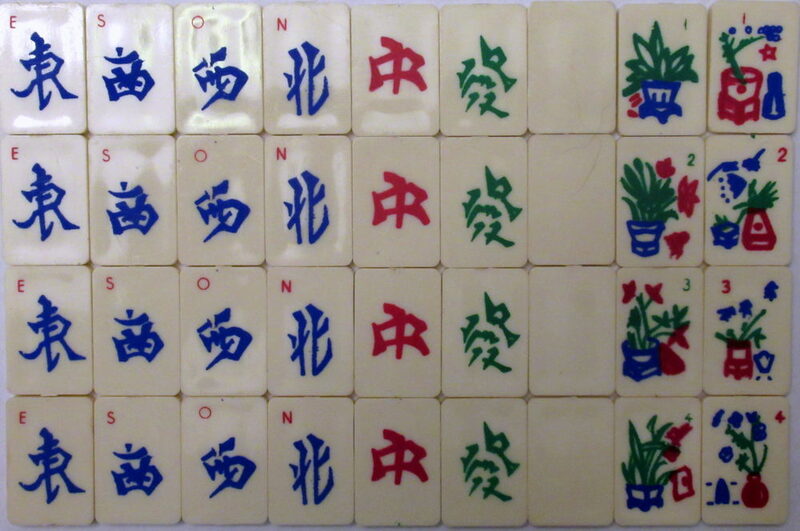 The impressed designs are very finely rendered and have retained the paint very well, unlike a lot of casein tiles. 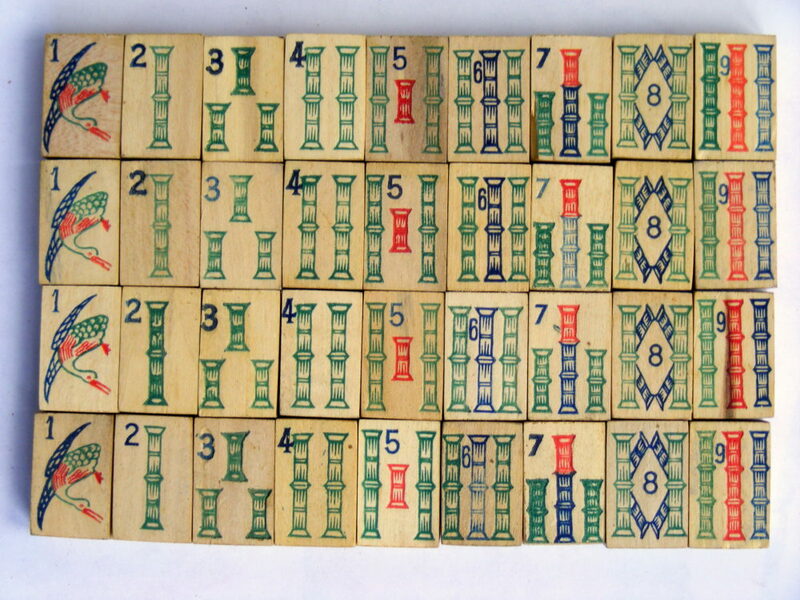 The designs are unique to Bornemann, so I’m confident this is by them. 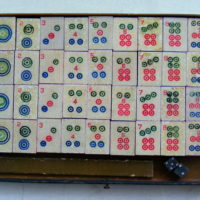 ... the arabics are different colours, and the Seasons are very nice with mixed Gentlemanly Arts and semi-vase plants. 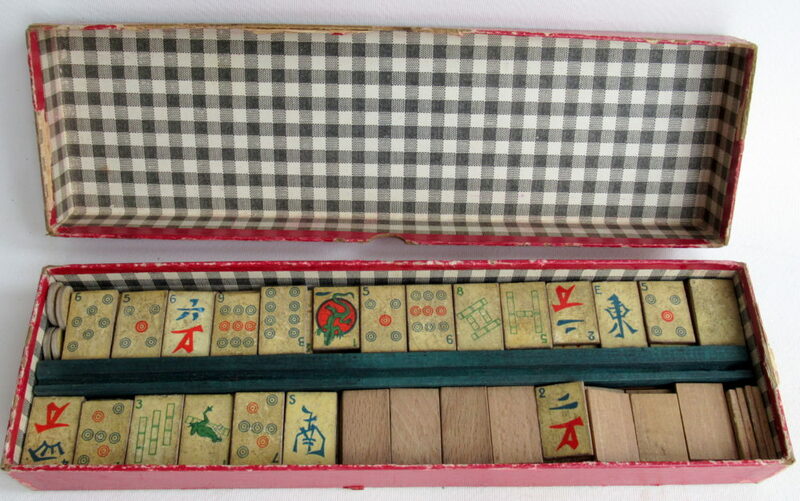 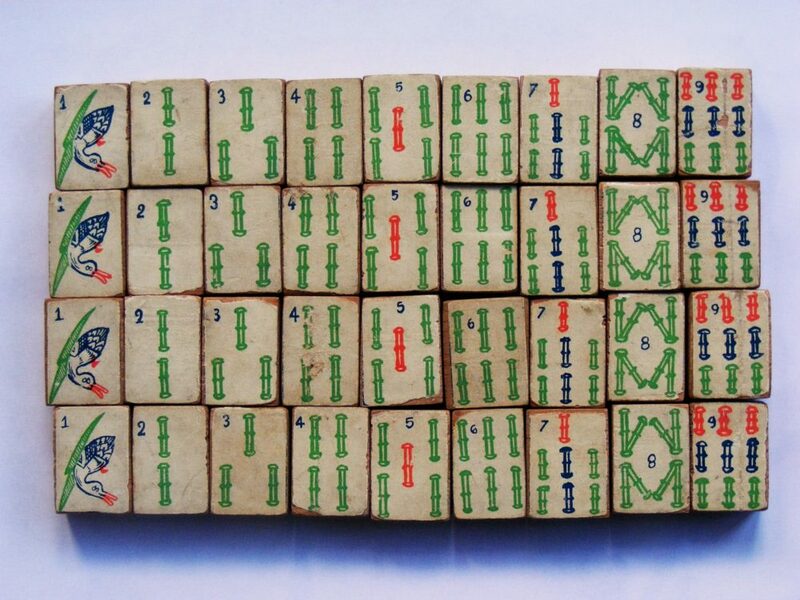 French Bornemann Tin Box Wood Mah Jong Set. 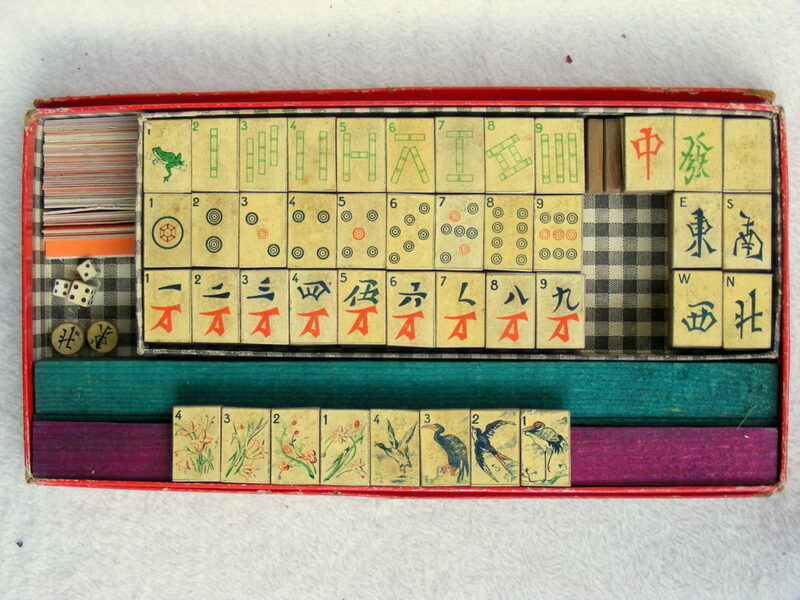 The tin box is spurious, but of the period and of a suitable style for the set, so I’m keeping them together. 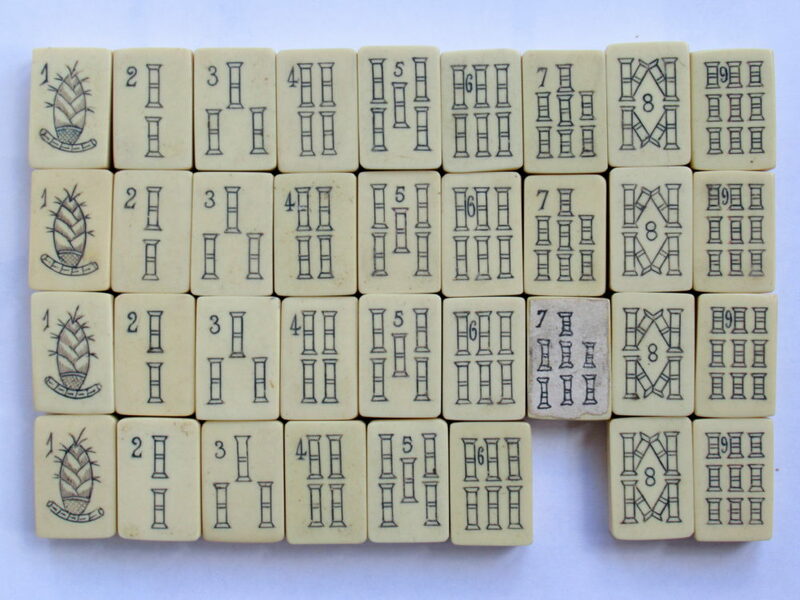 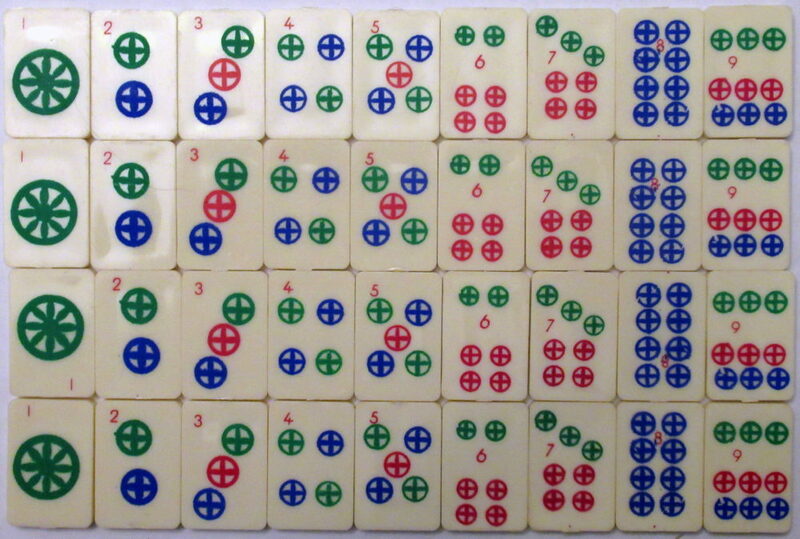 The tiles do not fit well, but the designs match those on the rulebook, which is quite a rare one by Pierre Manaut for Bornemann, so I surmise that the set was made by them and marketed by M. Lefront de Paris. 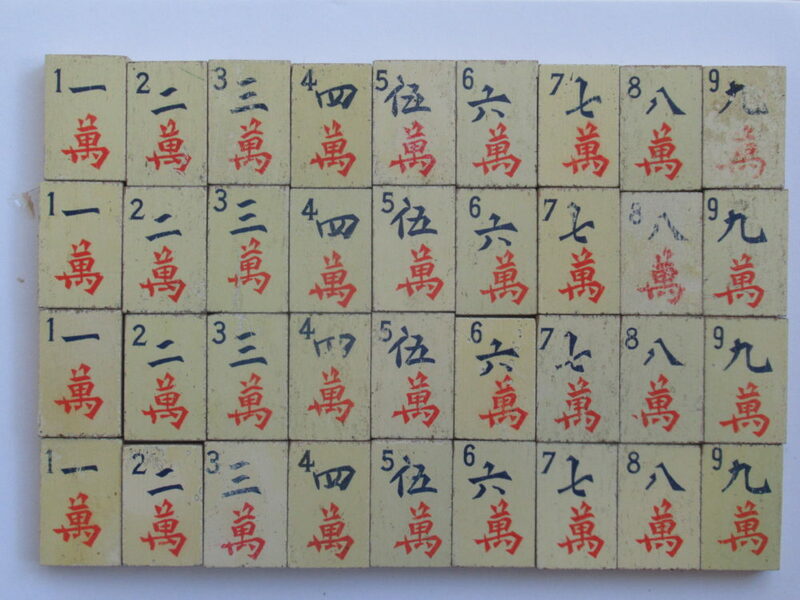 The tiles are made from cross-grained beechwood, with a printed paper slip glued on top, measuring 29x21x14mm. 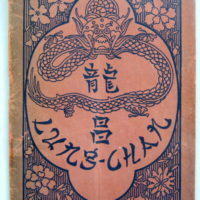 The Flowers especially are unusual. 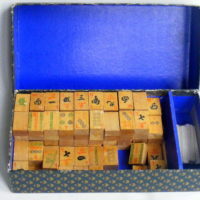 Galeries Lafayette Blue Label Wood Mah Jong Set. 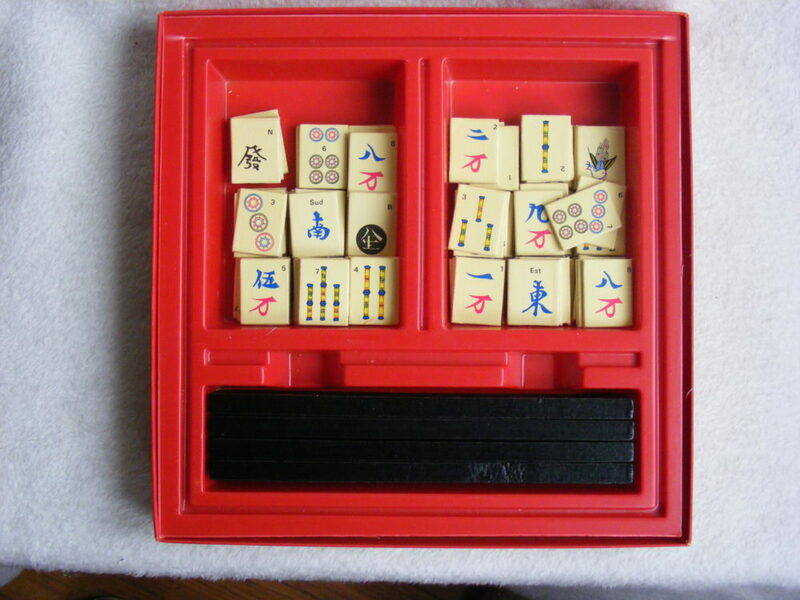 Bought from Germany for a very reasonable price, this French Galeries Lafayette set is a little different to the others I have. 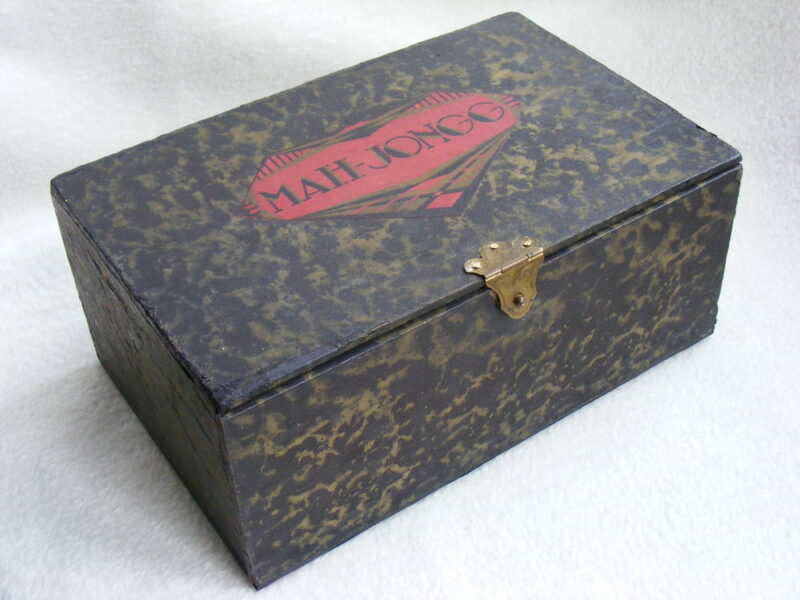 This is a black & gold deco paper covered lift-top box with a blue label, rather than the usual pink & black lozenge. 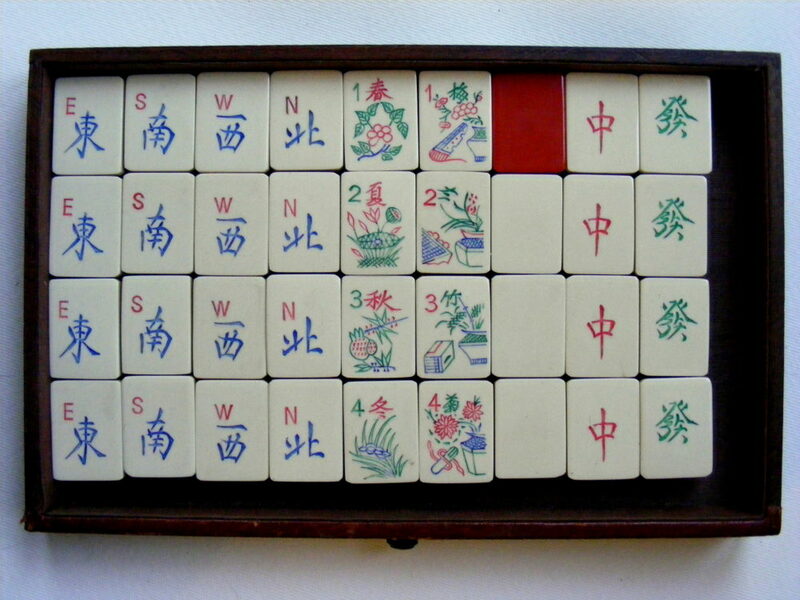 It has 2 compartments - one for the tiles and the other for the counting sticks. 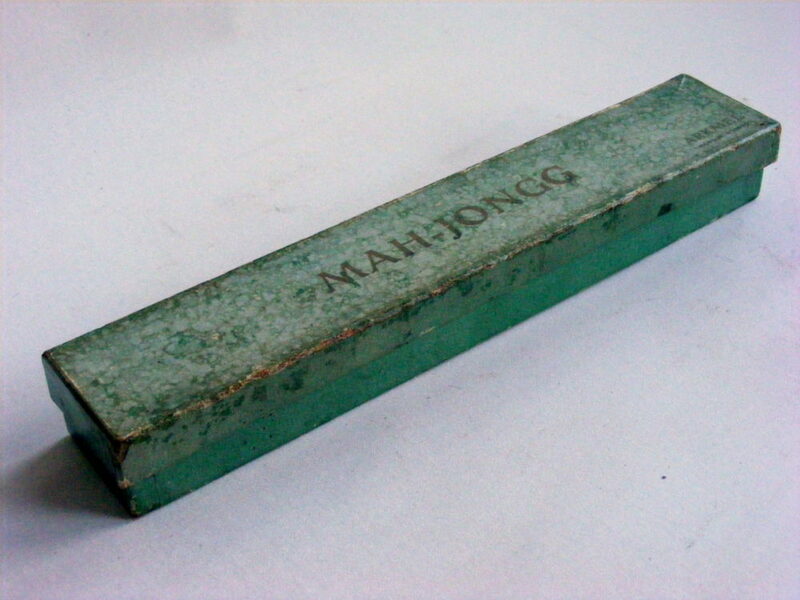 Measuring 270x140x65mm, it is a little bit scuffed (this can be fixed OK), but in very sturdy shape. 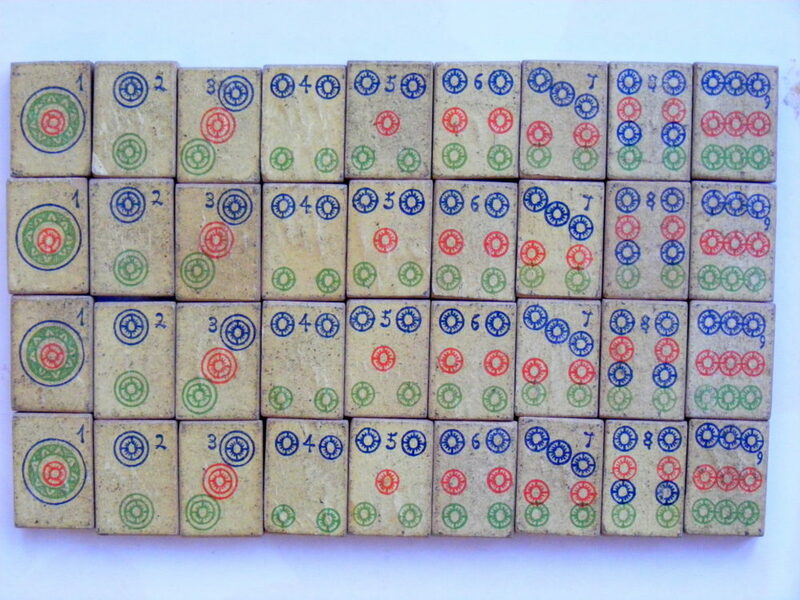 The tiles measure 31x21x14mm, made from light wood - probably maple or sycamore - with the designs well-impressed into the surface and painted in 4 colours, with a final coating of shellac. The tiles feature simple wan Craks, simple separated rod Bams, simple Circles, swooping crane Bambird and unusual Flowers. 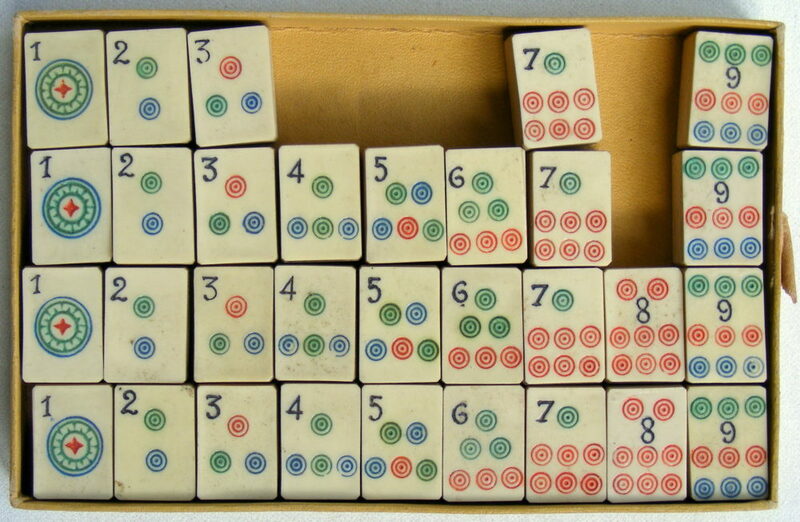 Bought from France - another case of mis-advertising: the box arrived with the advertised incomplete 136 tiles, but hidden under the blue tray (located with pins) were the 8 special tiles, a duplicate 2 circles and 15 blank tiles. 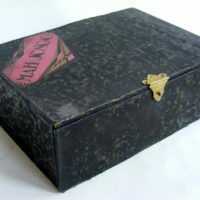 The box is made from card covered in marbled paper with a very Art Deco logo on top. 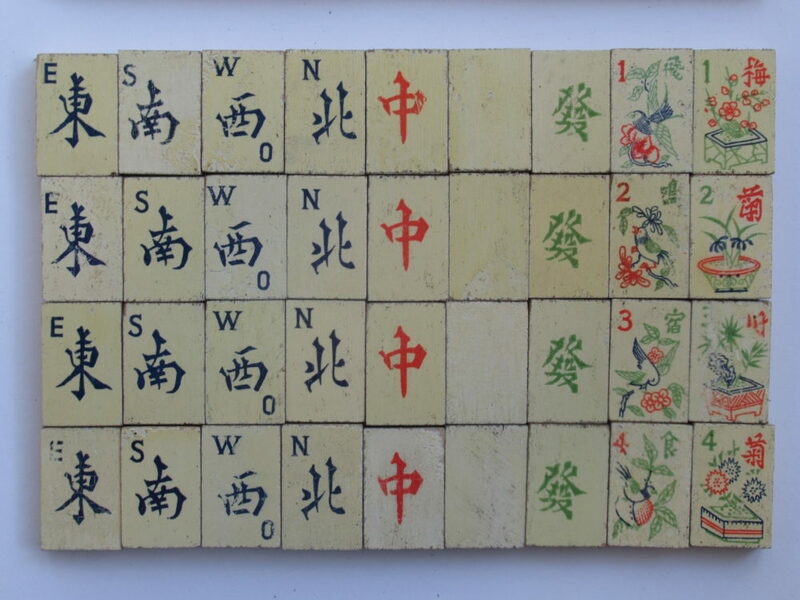 It measures 263x162x60mm and tiles are 30x19x13mm made from hardwood with the design impressed and painted, the other faces are coloured red and the front face lacquered, which has aged to quite a dark shade. 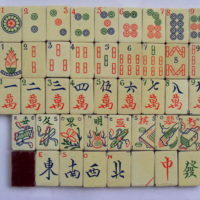 The rulebook shows the same design of tiles except the specials, which are quite different - as the existing specials are slightly wrong (the #4 season is duplicated while the #2 flower is missing - I've noticed this sort of anomaly in other cheaper sets) - I may carve the specials in the rulebook to replace them. 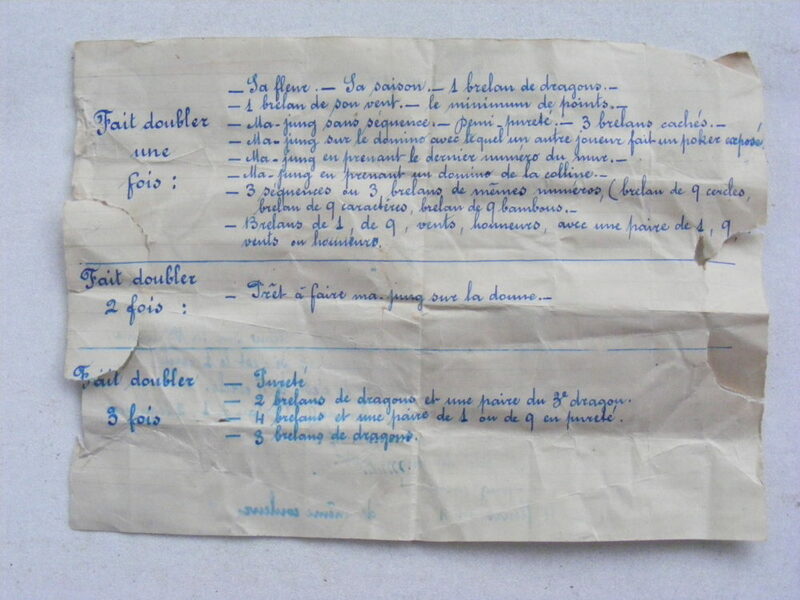 The Galeries Lafayette rule book is by Marise Daunier and there is a doubling table. 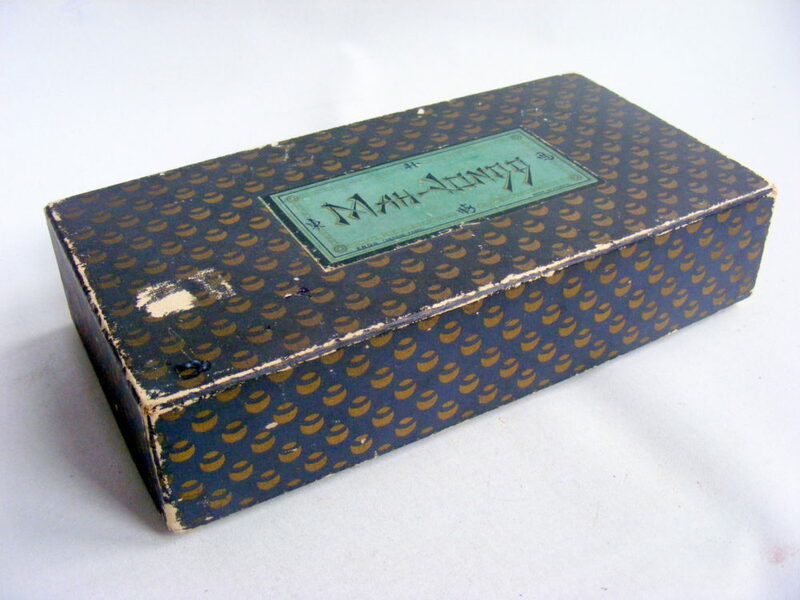 The box was dirty but cleaned up nicely with a rubber, the scuffs were touched up with felt-tip pen and the loose edges glued with PVA. 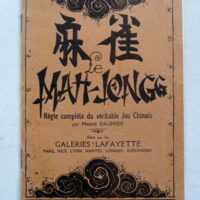 Galeries Lafayette Casein Mah Jong Set. 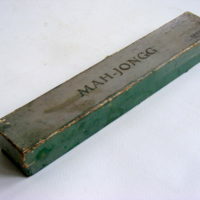 The box measures 225x140x95mm with a clasp holding the fold-down front, made from softwood and card. 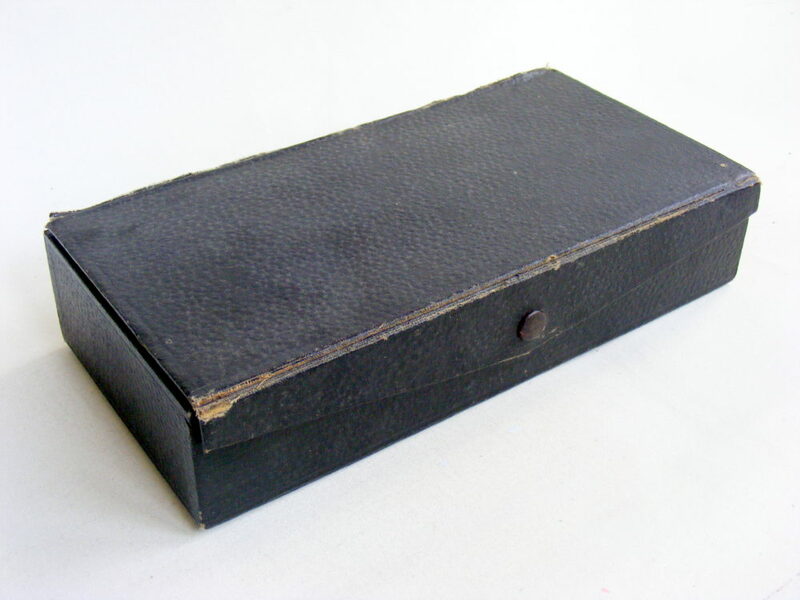 The hinge on the front was rotten, so I replaced it, touched-up the scuffing and replaced the bottom black paper. 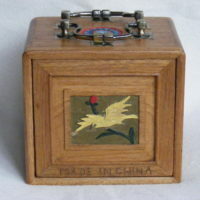 Unusual #1 bam, which looks a bit like a turkey, but more likely a pheasant or phoenix. 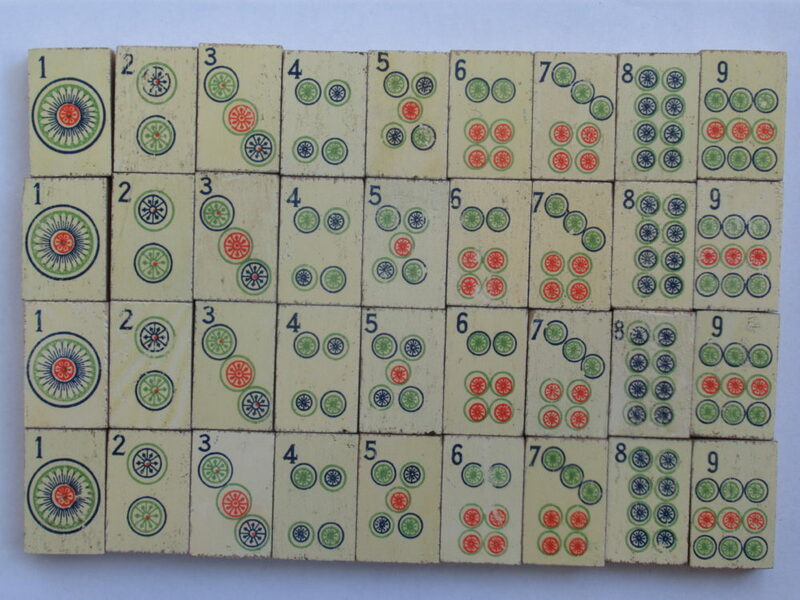 The trays are in good condition, only 2 had a bend at the centre around the pulls, but they glued and clamped straight very nicely. 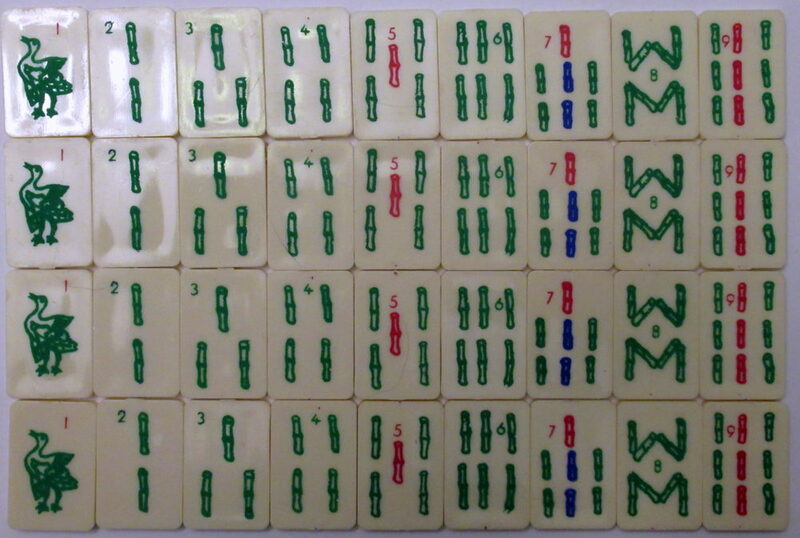 A very nice, unusual set. 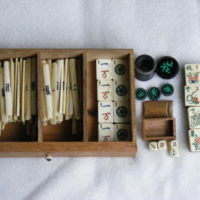 French Galeries Lafayette Casein & Boxwood Mah Jong Set. 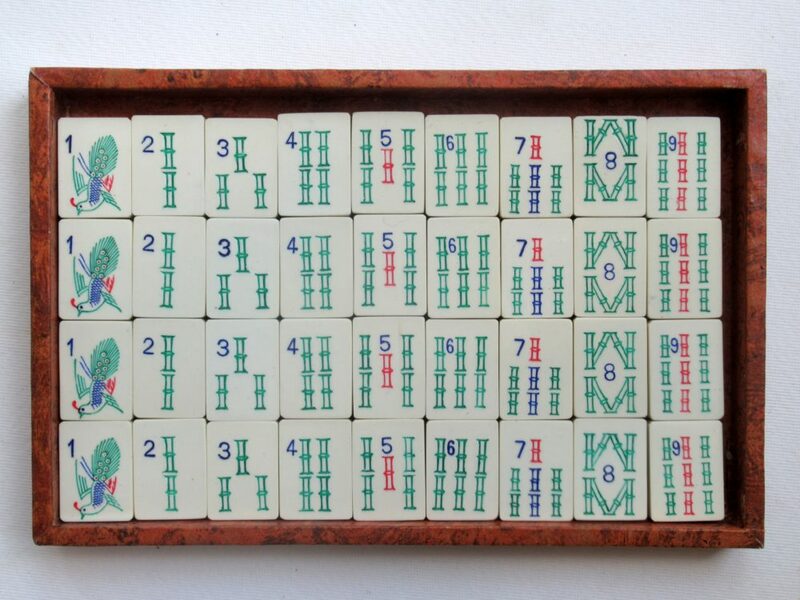 This is a Galeries Lafayette set from France, similar to another one I have, which is solid casein, different bambird and the label / logo is different too. 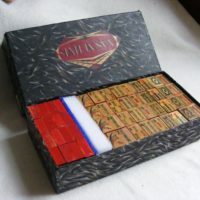 The box is made from thin 5mm softwood, covered in paper which is a stylised Chrysanthemum pattern outlined in gold on a matt black background, with green inner lining - same for the trays which are made from thin card with brass pulls which have twin tails. 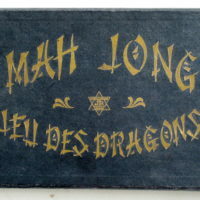 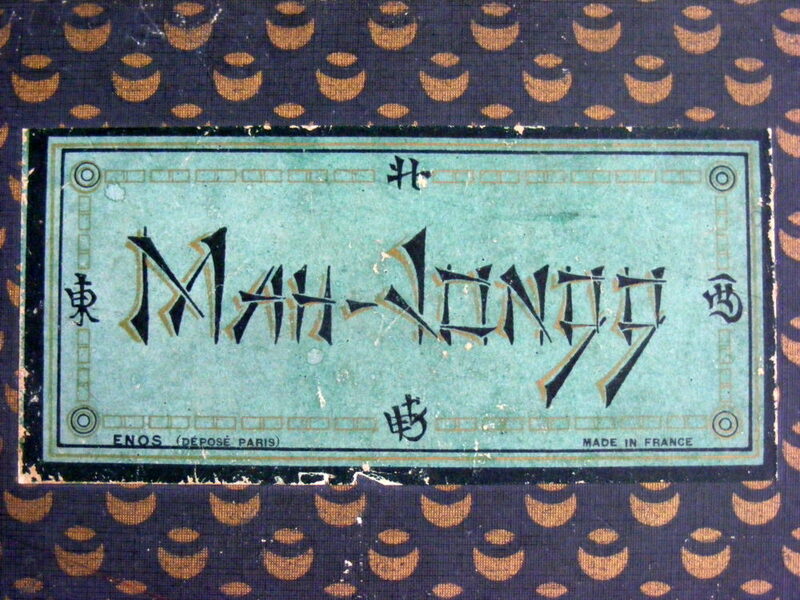 Made by Enos for Galeries Lafayette, the label has stylised Mah-Jongg in black and gold on a turquoise ground surrounded by the ESWN sinograms (but the E & W are on the wrong sides!). 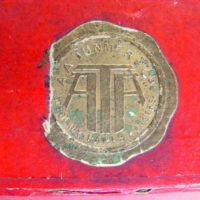 On the base there is the remnant of a sticker and the red circle with the initials GL . 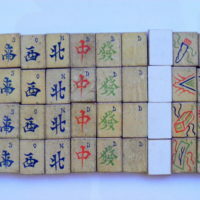 The tiles originally measured 28x20x10mm with 3mm Casein on 7mm Boxwood, but the Casein has shrunk by 1mm so the wood protrudes around the edge of the tile, the glue has deteriorated and many of the tiles are separated, but easily glued back. 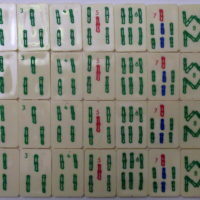 The separated tiles are white on the inner surface, but the outer surfaces have mellowed to a nice cream colour over the years. 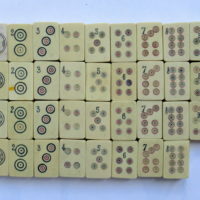 The counters are white flat Casein sticks, measuring 70x7x2mm, with fully perforated holes. 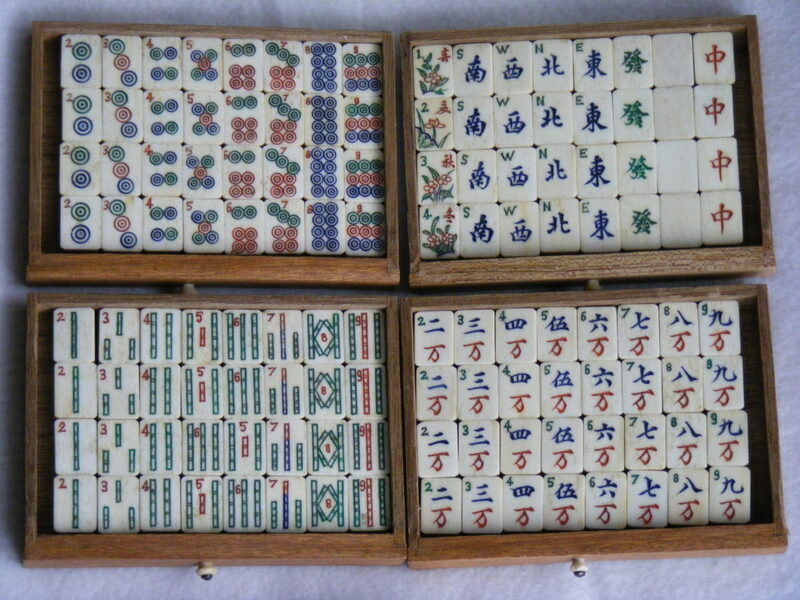 French Galeries Lafayette Impressed Painted Wood Mah Jong Set. 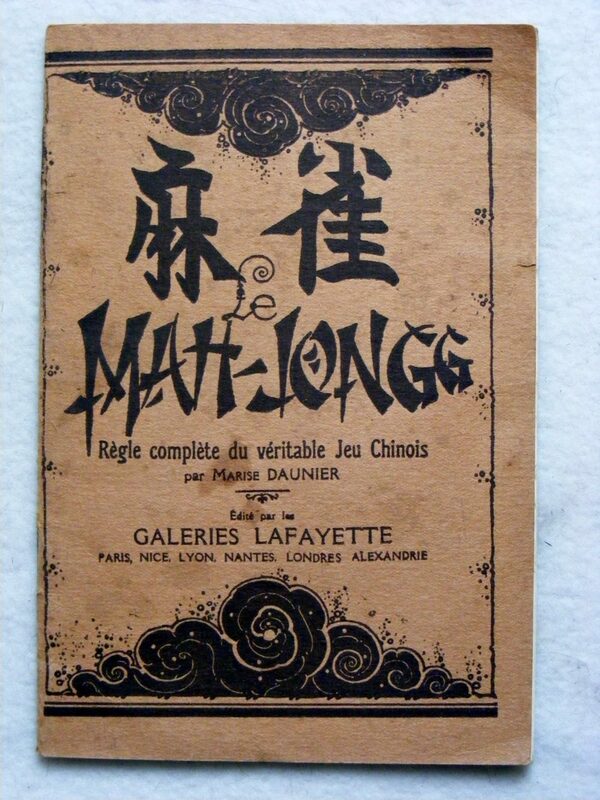 Again, I was the only bidder: I have a few of the Galeries Lafayette editions, but not this one, with red wood and a painted impressed face. 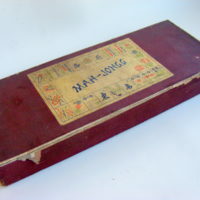 The box is different too, as is the rulebook by Marise Daunier. 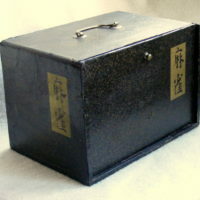 The box measures 230x165x80mm with drop front revealing 4 drawers with tiny brass pulls (one is slightly deeper to accommodate the rulebook); it is covered in black paper with scumbled gold decoration and a standard GL label on the top LH corner. 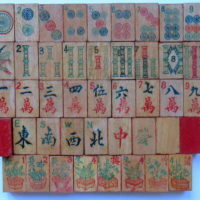 The tiles measure 30x22x11mm, made from wood panted white on the face, red on the 4 sides and rear, with added dots of gold on the rear - the tiles were covered in shellac, which has largely degraded and darkened, but I think this can be re-done. 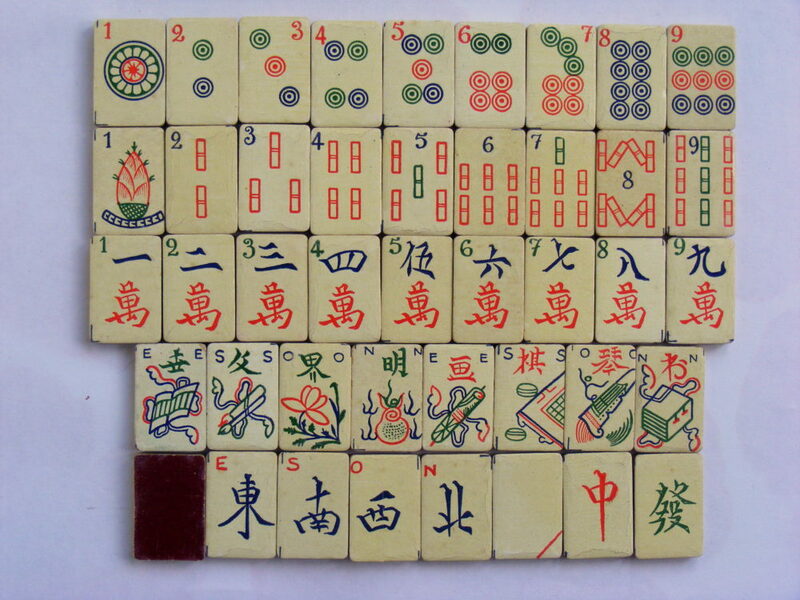 The tile pattern is a modified American Pung Chow design, but not a direct copy - not as well executed and there are Arabics on all the tiles. 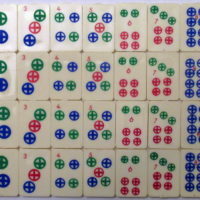 2 of the Flowers are missing:- the #1 red and #2 green. 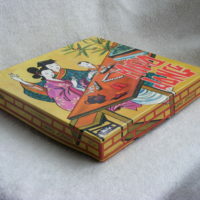 Galeries Lafayette Lac Box Wood Mah Jong Set. 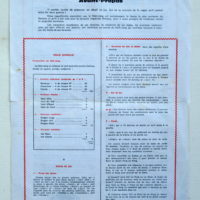 Poor pics and description meant that this went unnoticed, so I got it at the start price, but I was prepared to pay a lot more. 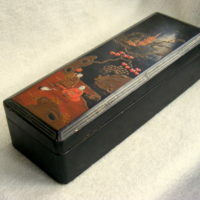 The box is Japanese, (probably a glove box), black lacquer with an embossed scene of 2 ladies, a crane, maple, pagoda and mountains. 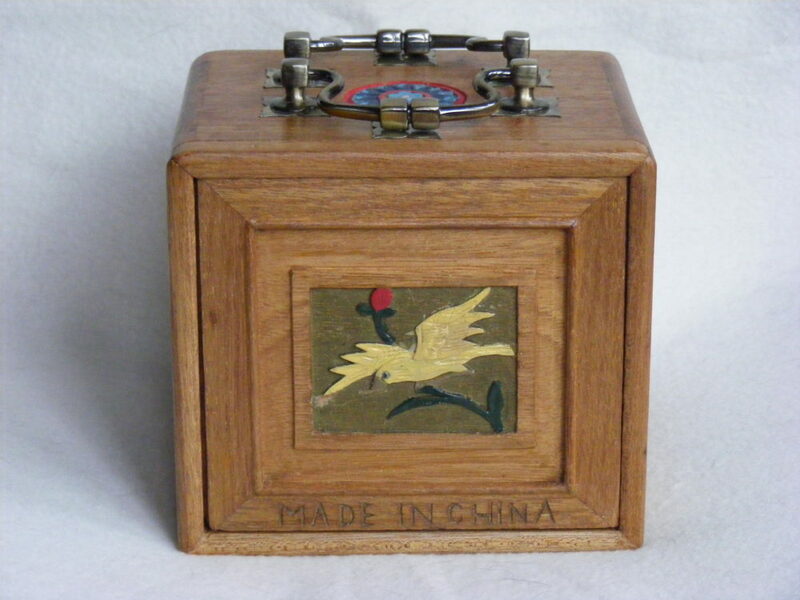 Hinged top with broken lock (which may be repairable, it's missing a few bits of lacquer, which I will fill in. 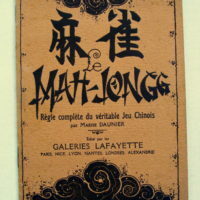 It measures 305x105x75mm - not sure if it belongs to the set, but it's the sort of thing I would expect from Galeries Lafayette... 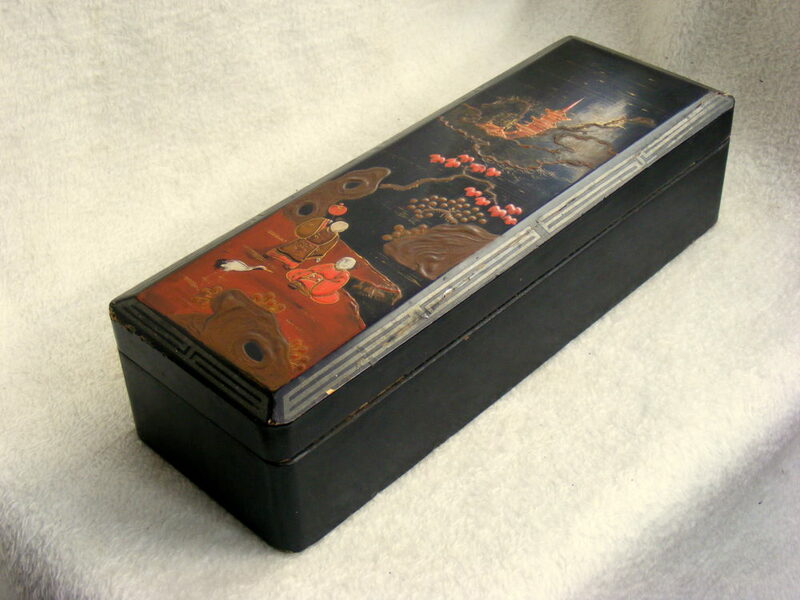 It comes with 4 hand-painted lacquer trays featuring dragons chasing a flaming pearl - again a few missing bits of lacquer, but fixable; all the hinges work. 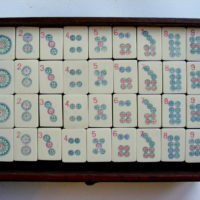 The tiles are wood with nicely impressed and painted designs in the Lafayette style and they fit neatly in the box with room for the counters, dice and 4 spare tiles, the counters are made from flat sawn bone with drilled holes for the denominations, quite unusual. 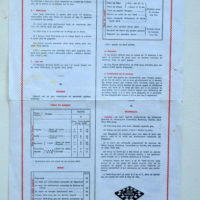 It comes with the Galeries Lafayette rulebook and scorecard. 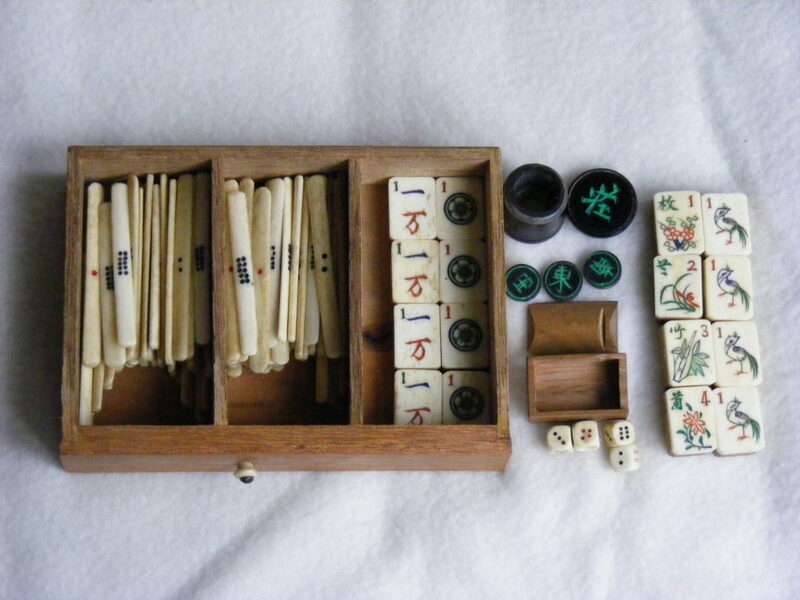 I'm very pleased with this unusual set. 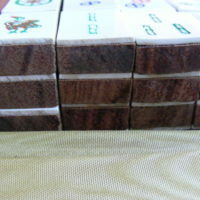 Peruvian Trad Burl Box Sprout Casein Mah Jong Set. 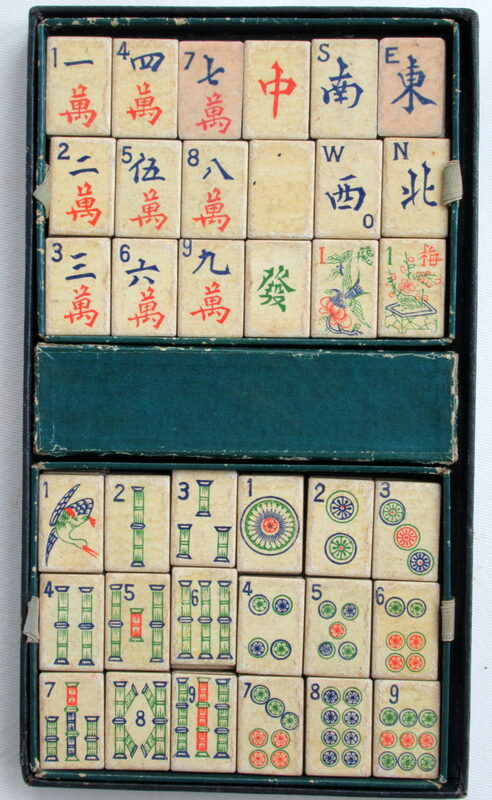 But, it had a hold on me and I kept coming back to it, although it was missing a few tiles, it was interesting enough for me to buy it. 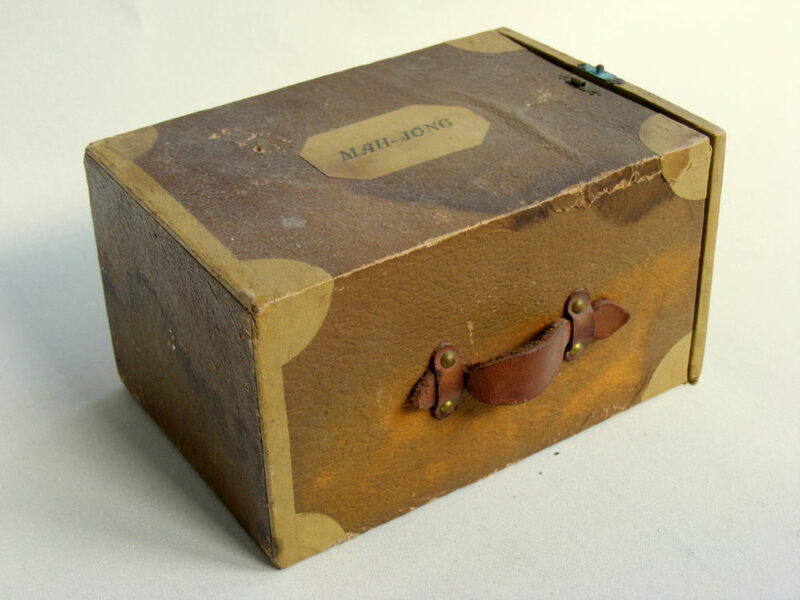 It arrived 18 days later, very well packed, but full of woodworm droppings! 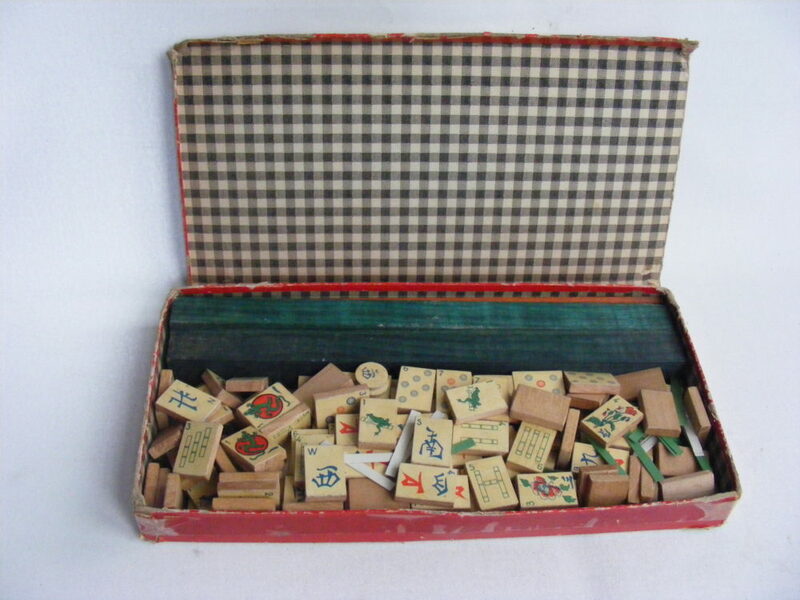 I'm pretty sure these are all old, but the result is that the bottom of the box will need to be replaced and quite a few other holes filled - but I've had worse! 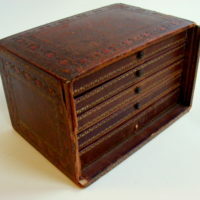 The box measures 240x180x150mm with a lift top and drop front revealing 5 drawers with random pulls running in slides. 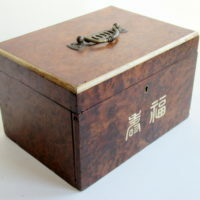 It is made from mahogany with a burl Amboyna? 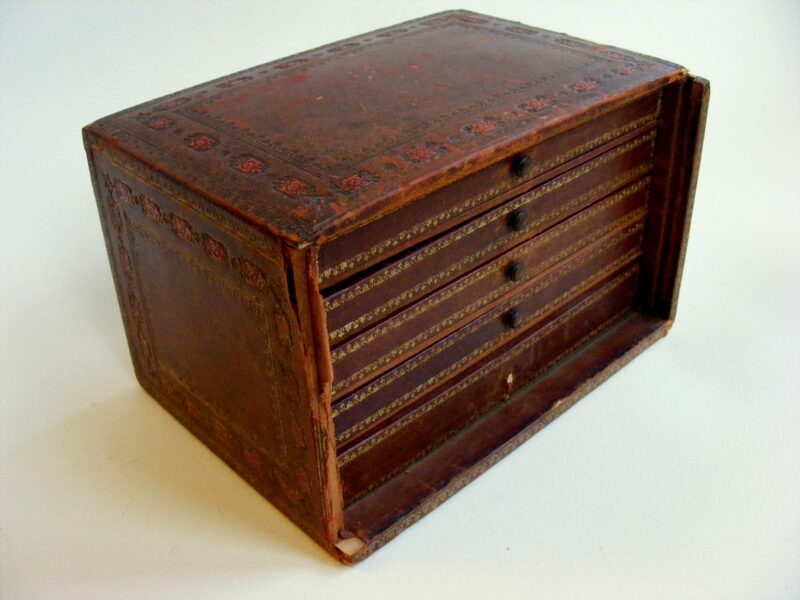 2mm thick veneer and bone corner decoration, brass handle and inlaid sinograms on the front panel. 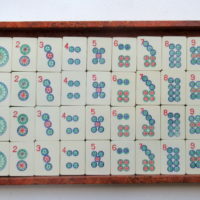 The rounded Casein tiles measure 33x22x11-13mm and are hand-carved in a slightly quirky style, which leads me to think 'not Chinese', but they remind me of Galeries Lafayette, so here it is. 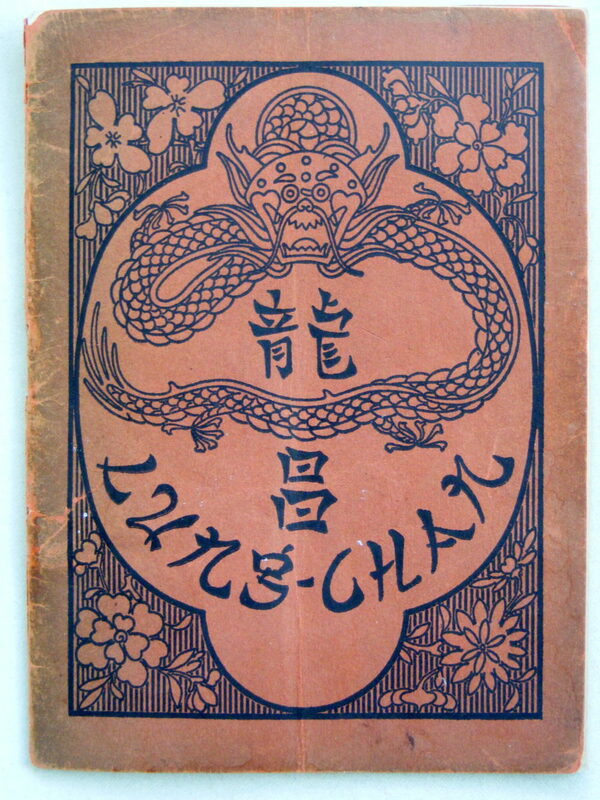 The style is not one I know, especially not in casein, as that usually has impressed designs. 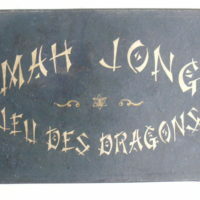 The colours have degraded to a more or less uniform charcoal, so red and green Dragons are much the same colour. 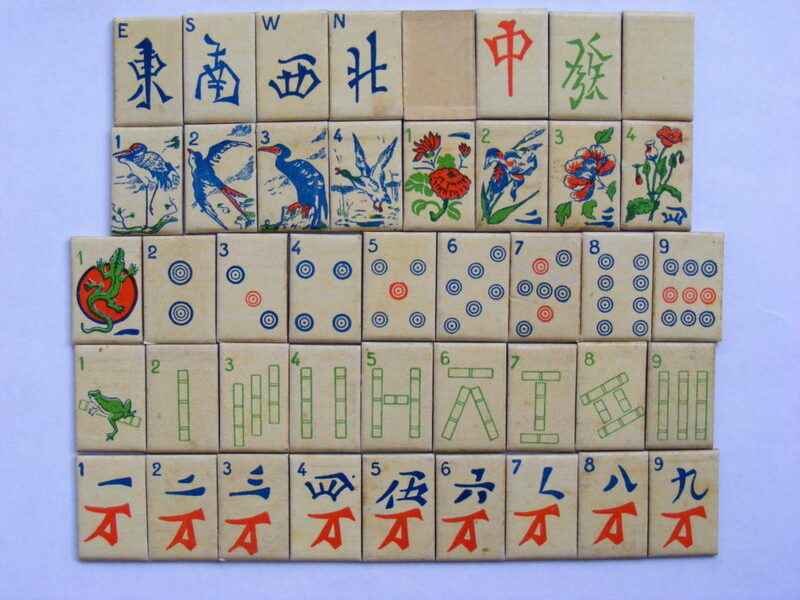 It is missing 8 tiles, 2 have been stickered, and only 2 of the Flowers remain, but they are 1 of each run, so I have an idea of what the missing ones should look like. 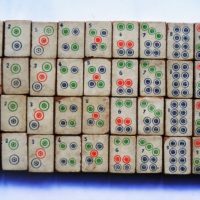 So, I will fumigate (to be sure), try to source a veneer for the replaced side, replace the bottom, fill the holes and create replacement tiles. 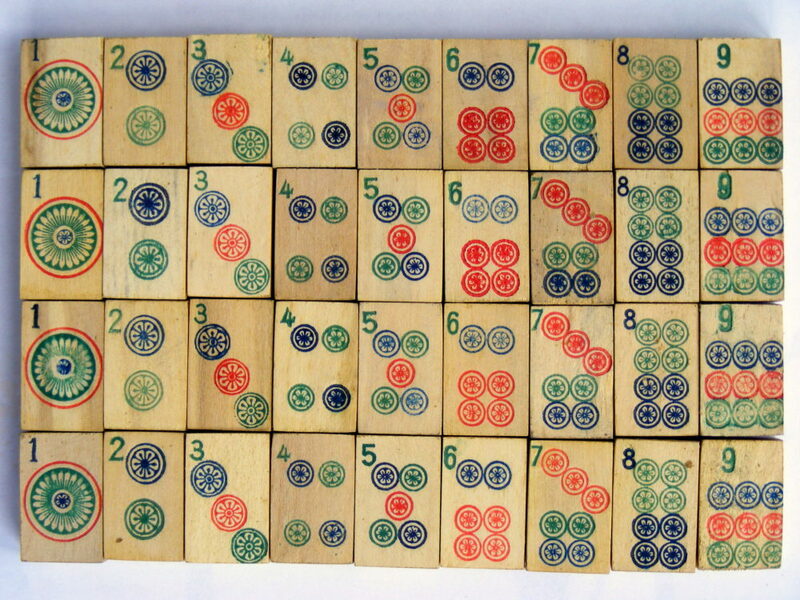 Simple Circles with an old-school #1. 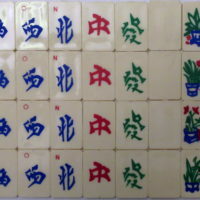 Sprout #1 Bam and serifed Bamboos. 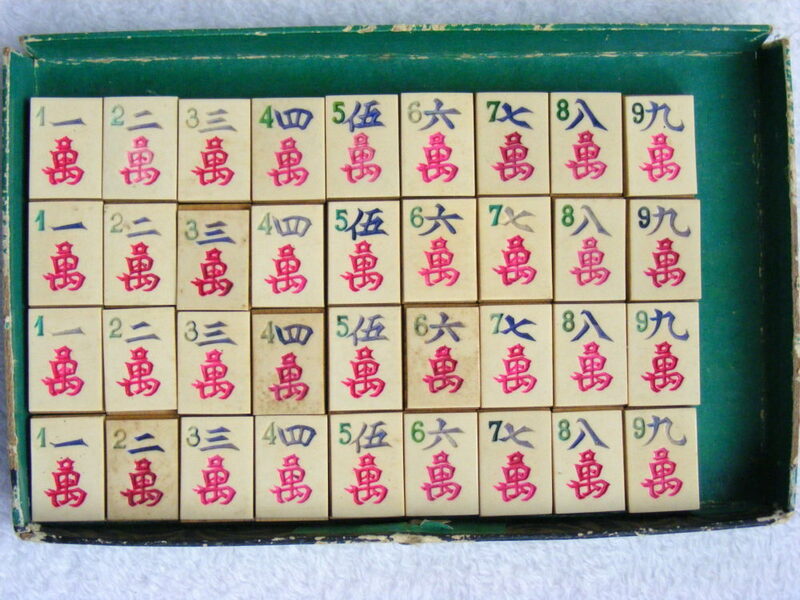 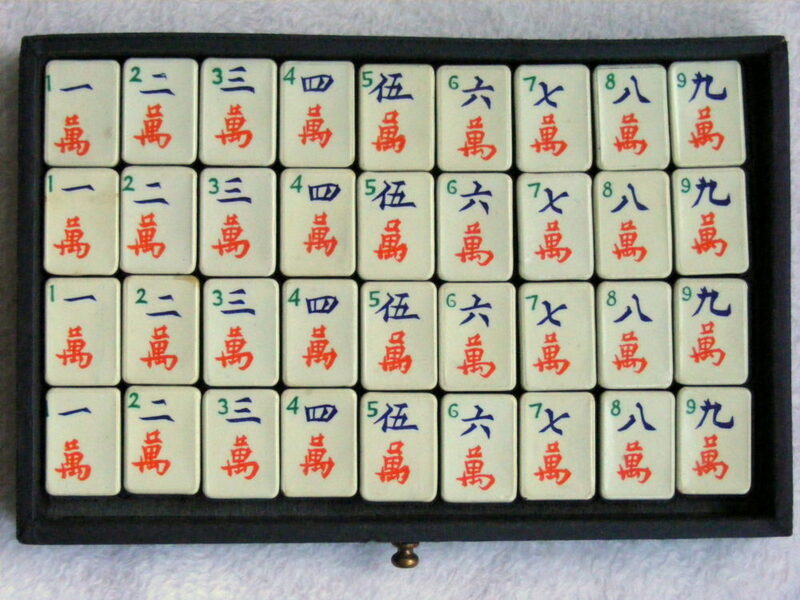 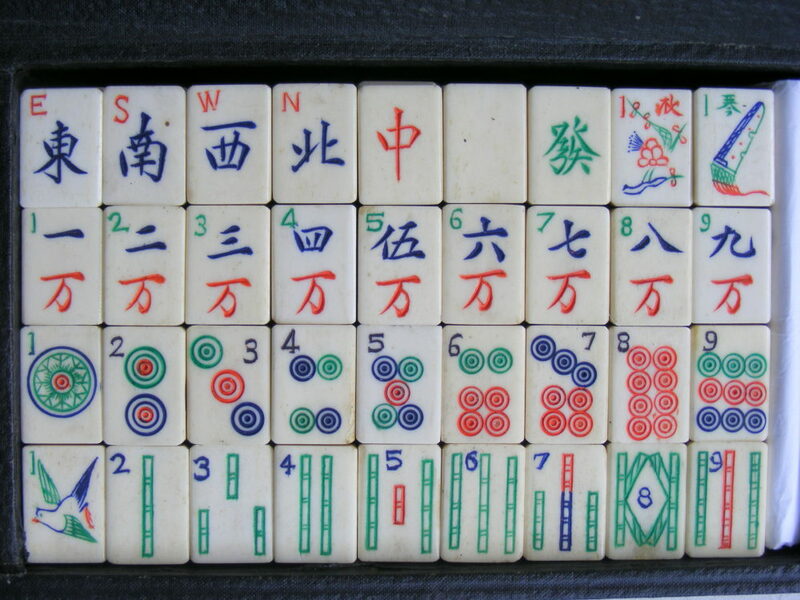 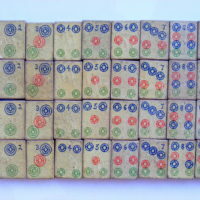 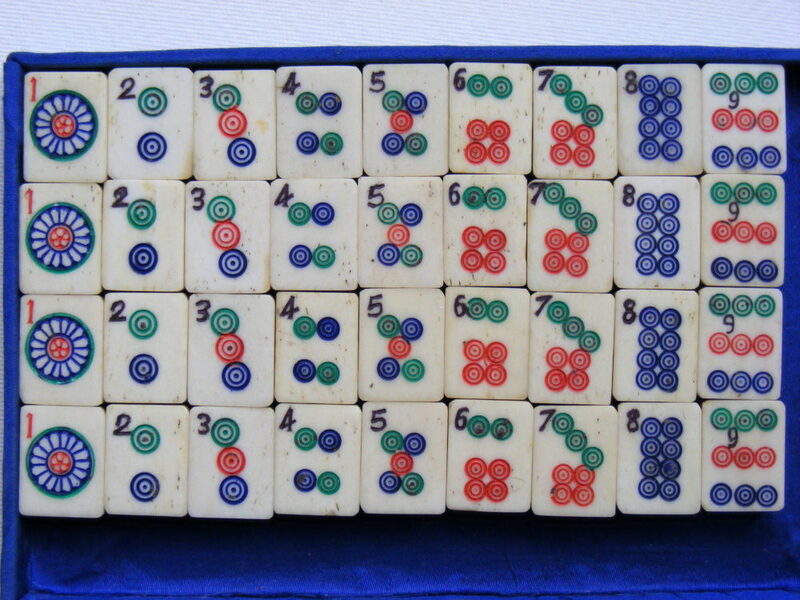 Imperial Baby Ebonite Mah Jong Set. 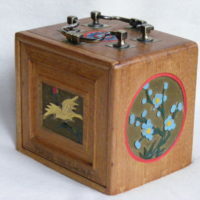 Made in France by Imperial, this is a cheaper version of the traditional box marketed by them. 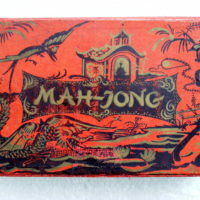 The card flip-top, drop-front box has the Imperial logo of Mah Jong sinograms on a gold lozenge, but this was originally covered in flowery Fablon (sticky-back plastic). 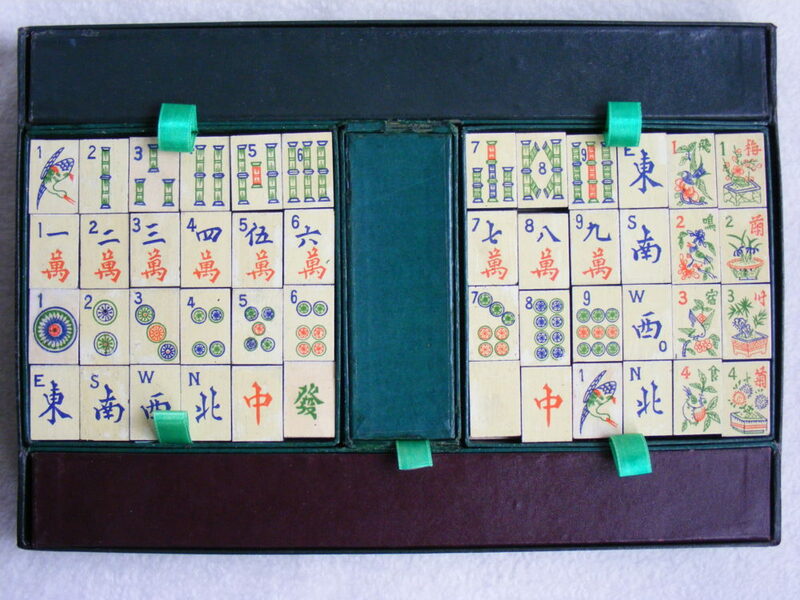 The gold-flecked black box measures 265x105x45mm and houses the tiles, small accessory box and 1 green & 3 red racks. 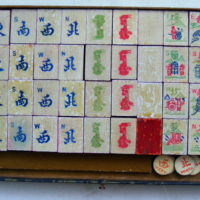 The tiles are made from ebonite (hard rubber with 40+% sulphur) with an interesting pattern on the rear, a recess on top to accommodate a slip of acetate + printed paper. 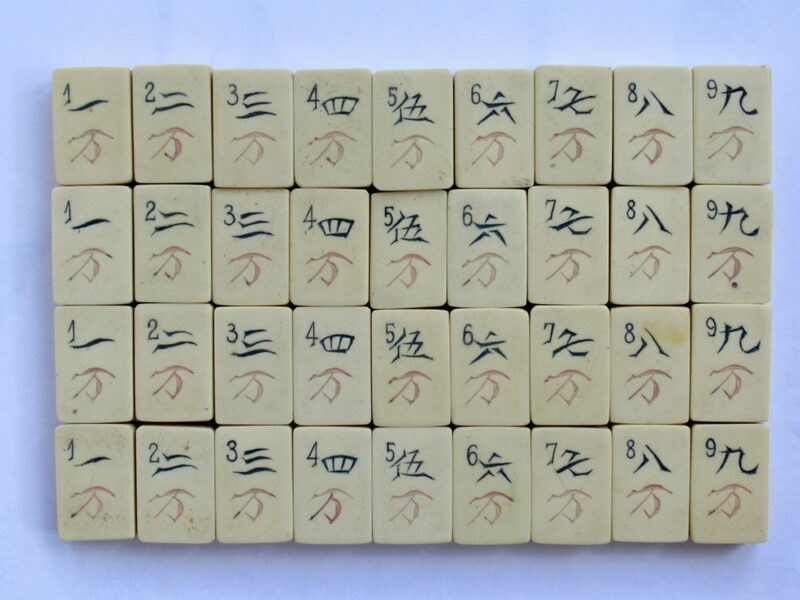 They measure 31x22x4mm, are surprisingly heavy and make a nice 'chink' when shuffled, but they are prone to warping, and some sets are very curved. 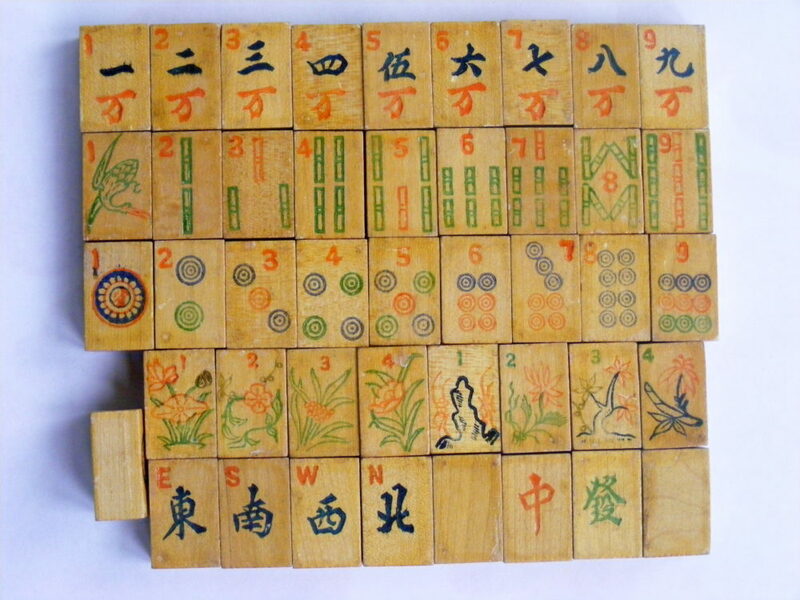 The designs are standard for Imperial (and other French firms) of swooping crane bambird, serifed Bamboos, flowery Circles, complex wan Craks and nice vase Flowers. 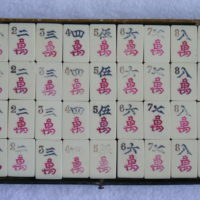 Imperial Trad Box Ebonite/Acetate Mah Jong Set. 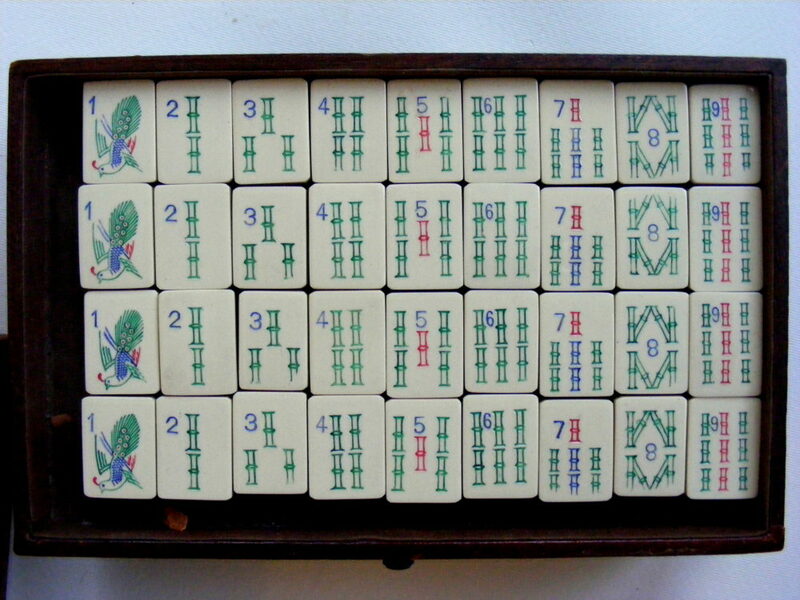 A very nice French set made by Imperial and sold by Kirby Beard & Co, Paris. 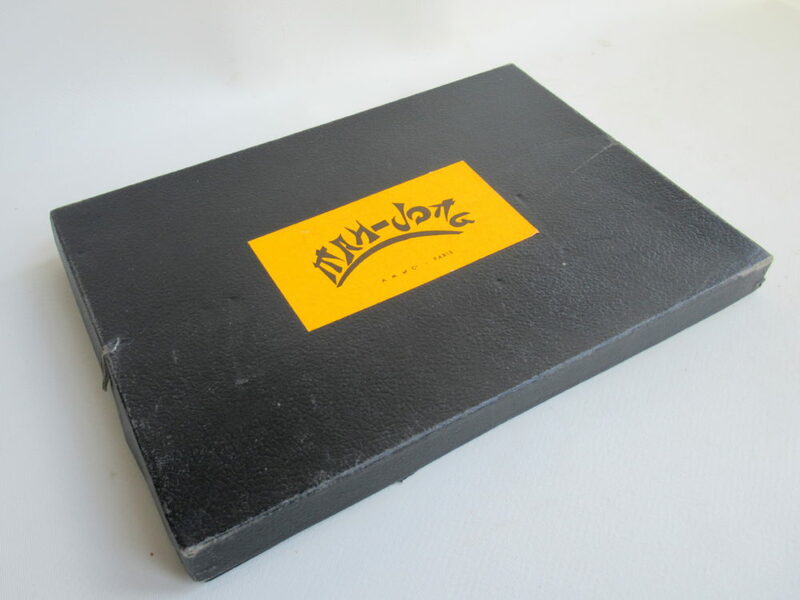 The box is made from Pine & heavy Card, covered in gold-flecked black paper and black tissue inside, with the Imperial sinogram logo in gold panels on all 4 sides. 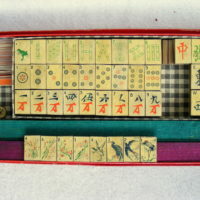 Measures 230x160x160mm with 4 shelves supporting 4 small drawers with brass pulls and a large 4-section drawer for the counters, dice and 4 spare tiles. 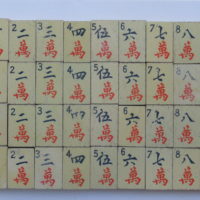 The tiles are black ebonite (hard rubber with 40-60% sulphur) with a white acetate wafer melted on top, convex back with gold flecks, measuring 31x22x13mm. 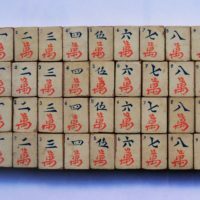 The designs are the standard Imperial pattern, but the top surface is bi-concave which protects the design on the relatively soft acetate. 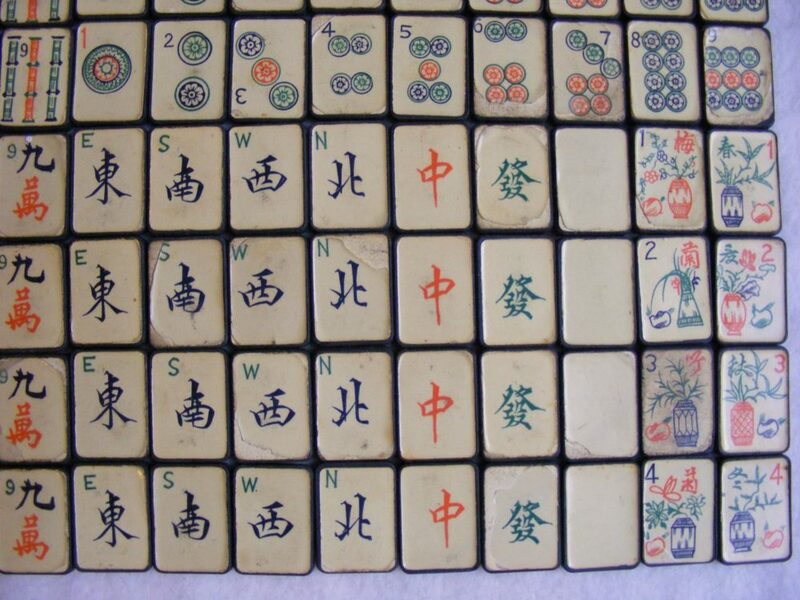 However, I doubt if these tiles have had much play, they are in such good condition, with absolutely no paint loss! 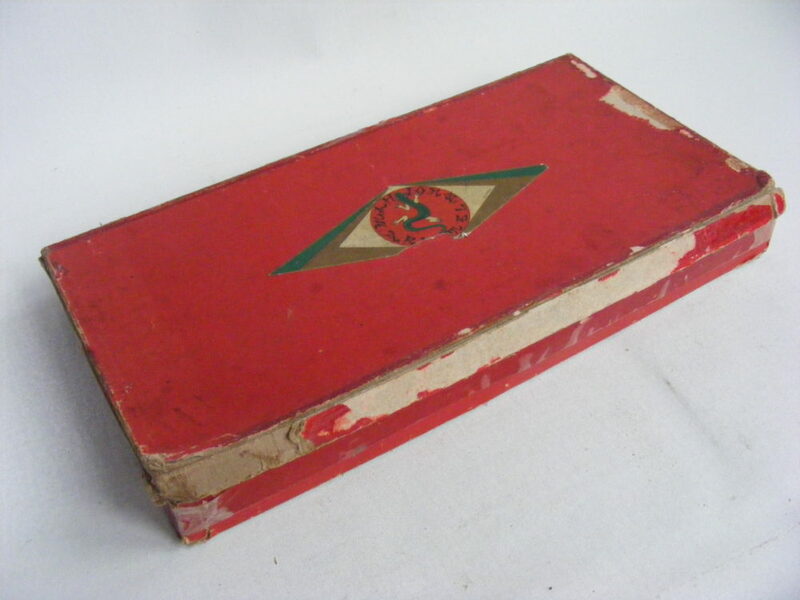 Comes with a French Chad Valley card Score Calculator (unusual, as these are normally acetate), Imperial rules booklet and larger rulebook by Bobby dated 1924, both in French. 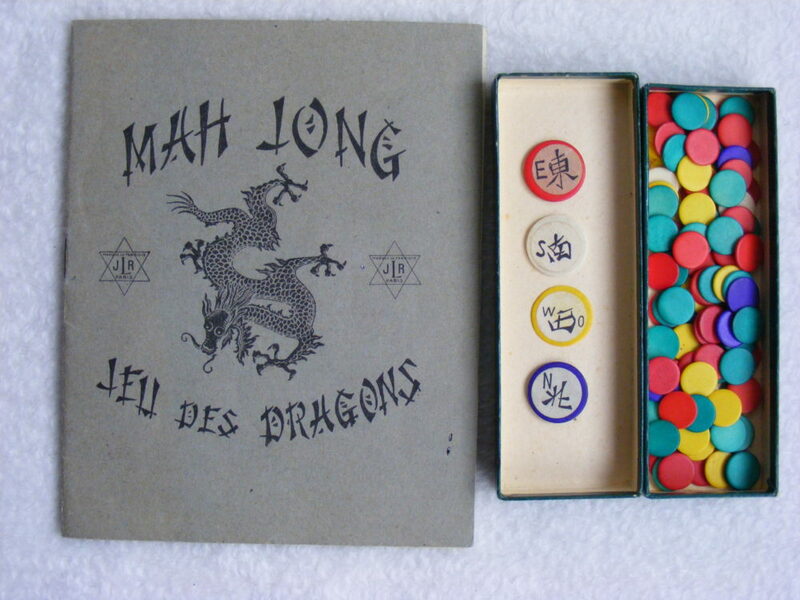 Jeu des Dragons Acetate&Wood Mah Jong Set. 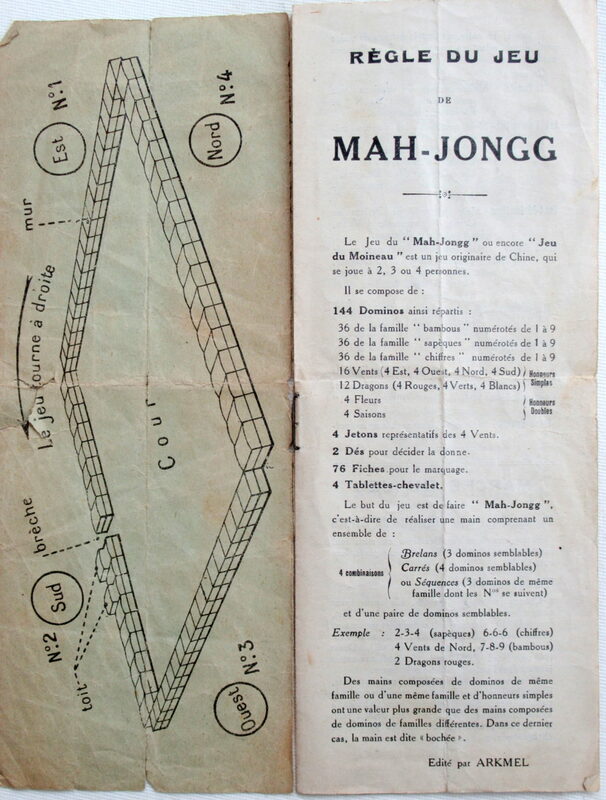 A cheap French pre-WW2 flat cardboard set measuring 315x215x40mm, with black-painted softwood tiles, printed acetate faces varnished with shellac, measuring 30x20x8mm, with casein counters & wind indicators and 4 paper-covered wood & card tile racks. 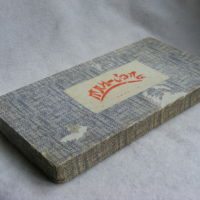 Bought from a dealer who hadn't realised how bad a state it was in:- the tiles had been packed while the shellac was still sticky, (a common problem, especially with Richter 'stone' sets) so there was a lot of transfer of acetate onto the back of other tiles, black paint onto the faces, and also paper lifted from the trays. 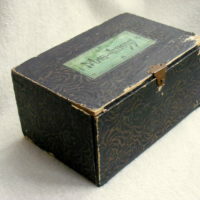 The box had broken corners, missing card, paint splashes and bad water damage on the top, much scuffing and decaying lift tabs. 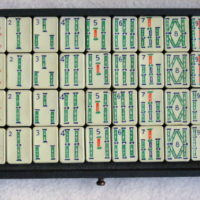 I repaired the broken corners, replaced missing card, cleaned off the paint spots, ironed out the bobbly water damage and touched-up the scuffing; new green satin lift tabs complete the interior. 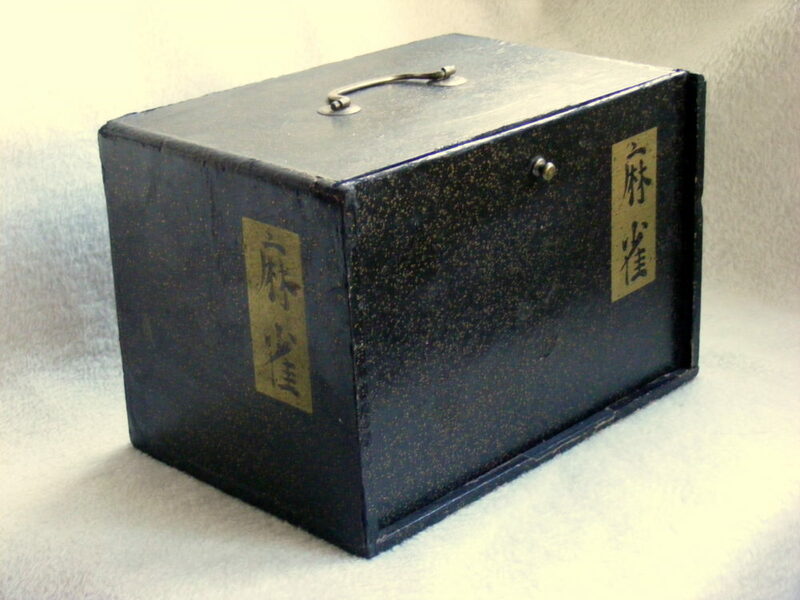 The gold paint was in a bad state, so I re-painted with diluted gold paint softened with black to simulate the ageing, using a 0000 brush. 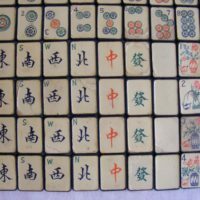 The tiles were cleaned as much as possible - most of the black paint came off easily - but some tiles were beyond redemption, so I photocopied good tiles, sprayed with semi-gloss fixative and glued the new face onto the bad tiles - your challenge, find them! 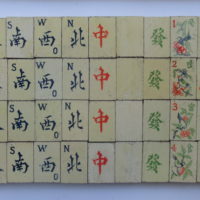 There is still a bit of work to be done to correct the missing shellac, which shows up as pale areas on the tiles, but a vast improvement on the original condition. 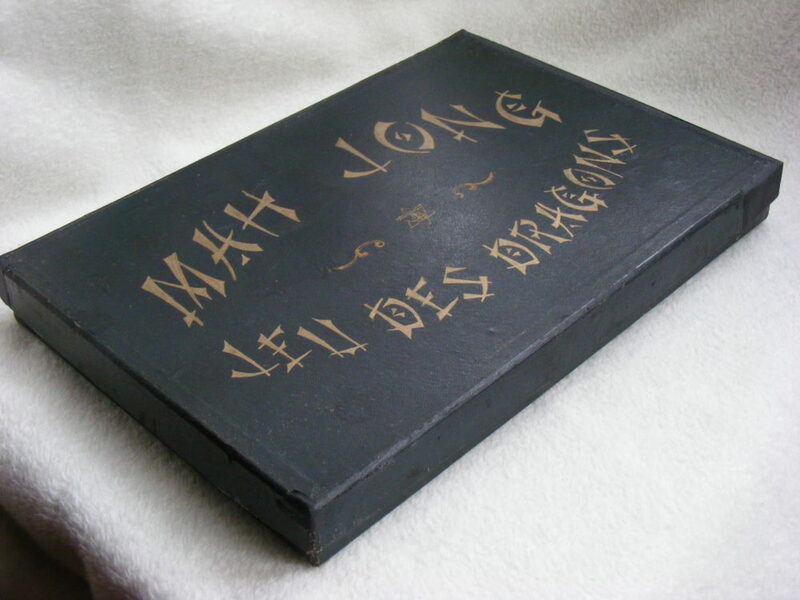 Jeu des Dragons Card Mah Jong Set. 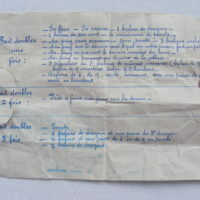 Bought on impulse - a silly offer on eBay France, which was accepted immediately! 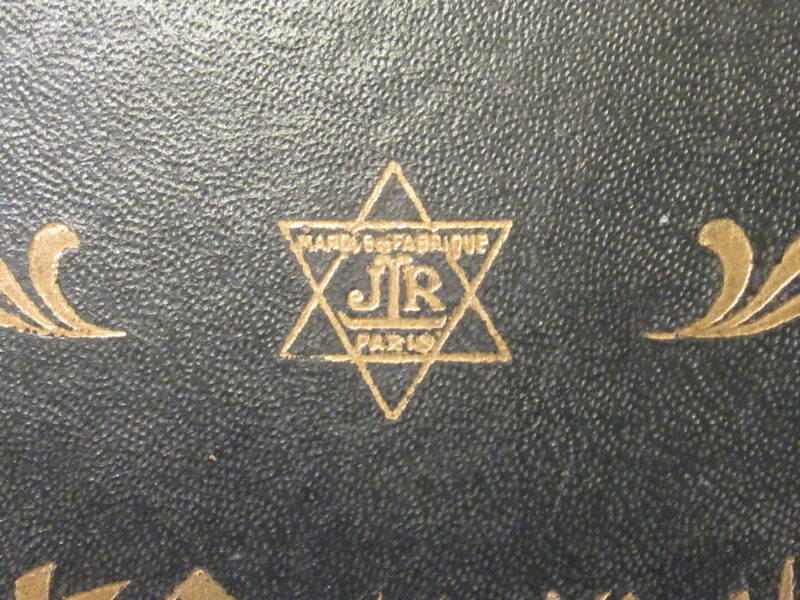 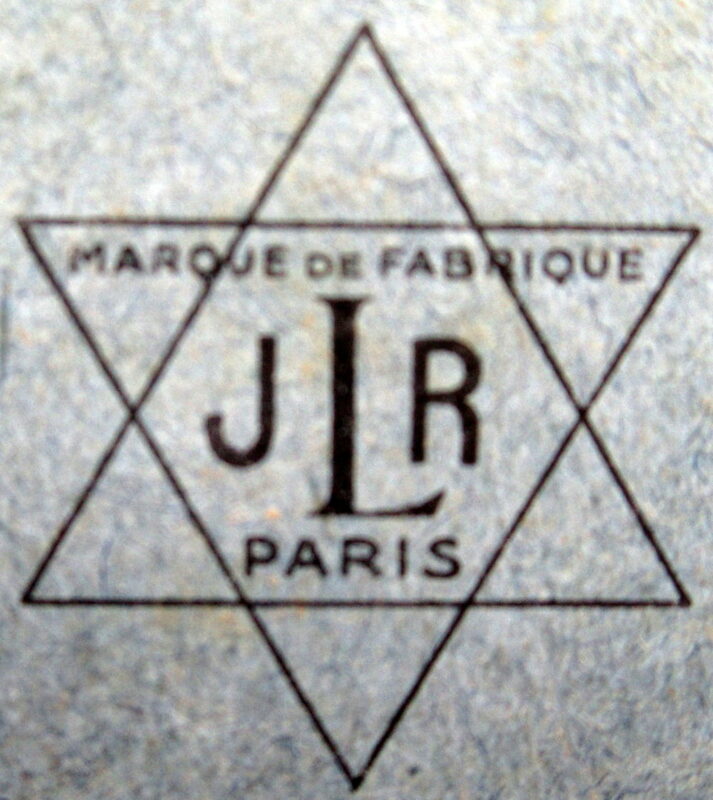 Made by LJR - Les Jeux Reunis - (logo is star of david with MARQUE de FABRIQUE PARIS surrounding JLR) and top end of the cheap market, sold at Louvre for 26F and has tiles very like the cheaper Chad Valley sets. 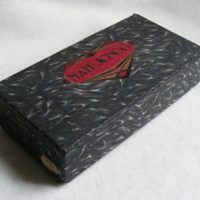 Box is card covered in black embossed paper and gold impressed logo, measures 243x140x21mm, housing 2 large trays each holding half the set and 1 small holding the dice and wind indicator buttons. 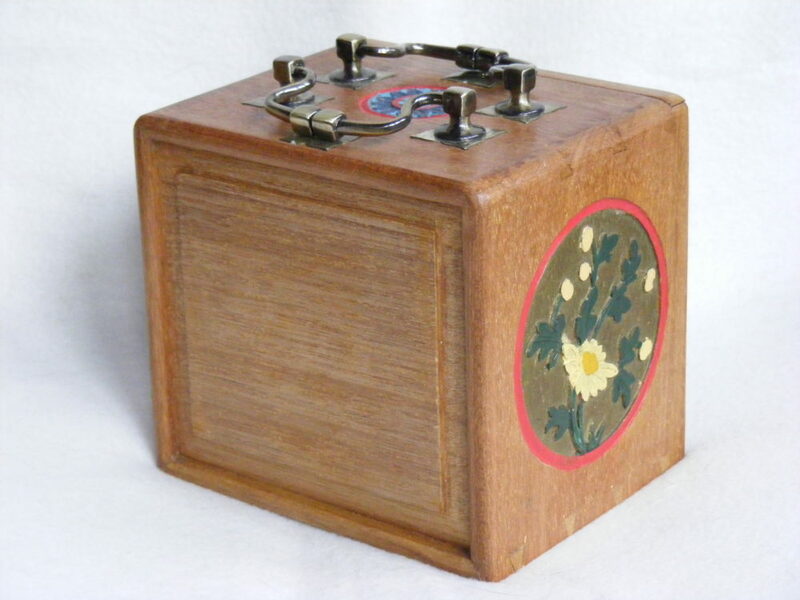 The box has been through the wars, most corners split, which I glued. 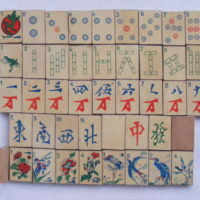 The tiles are made from stiff brown card with paper print glued on top, measure 30x20x3mm featuring swooping crane 1 bamboo, elaborate bams and unusual specials. 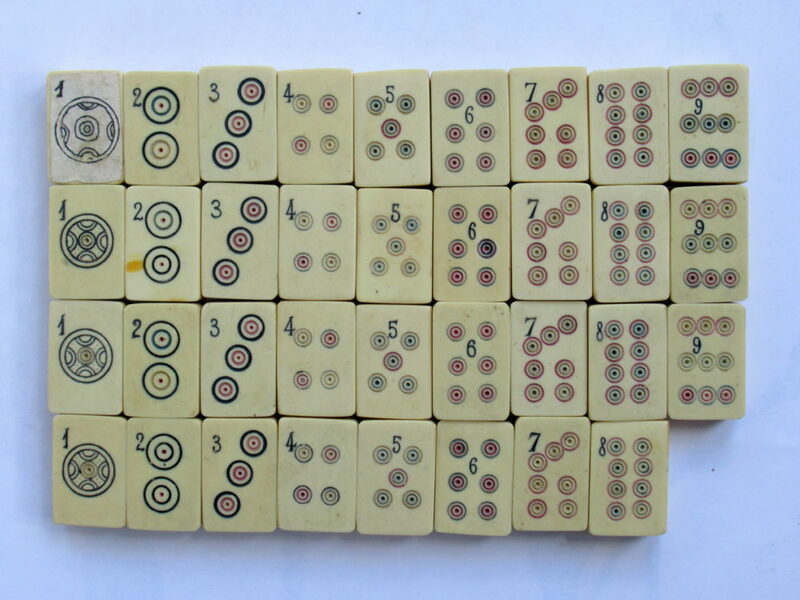 The set was missing 2 tiles (7 craks & E wind) which I recreated (photocopy & mahogany). 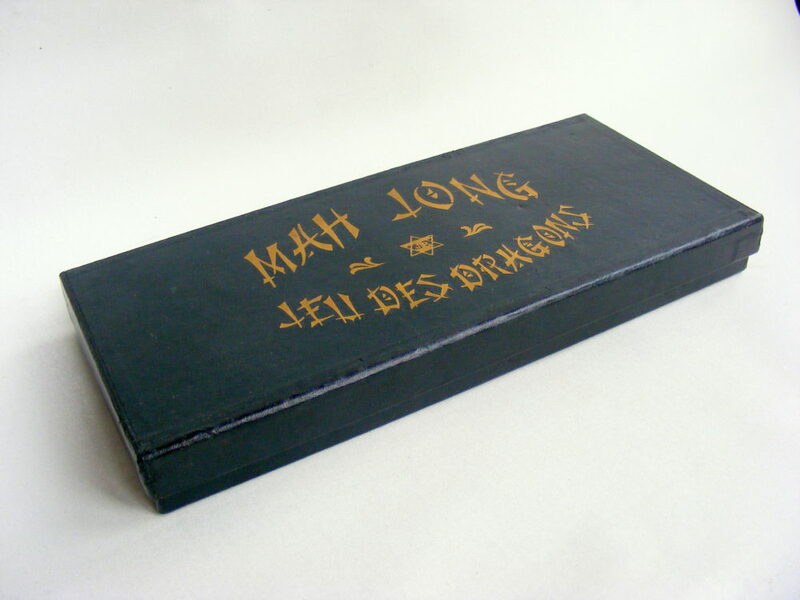 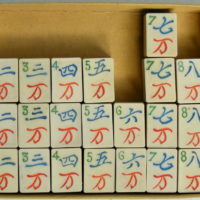 French Jeu Des Dragons Wood Mah Jong Set. 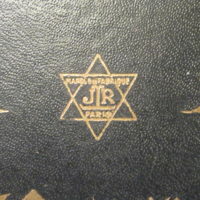 A cheapish set by LJR (Les Jeux Reunis = United Games) of Paris (their logo in a Star of David), I have a cheaper set by them made from compressed carton. 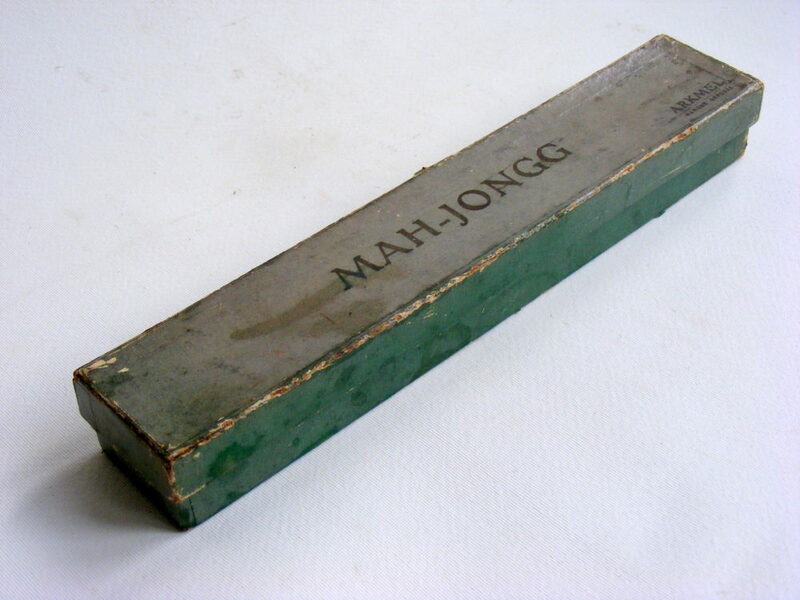 The lift-top box is single-layer card measuring 310x140x35mm covered in dark green faux shagreen paper, housing 2 large trays with 3 layers of 24 tiles and a central small tray holding 2 small bone dice, coloured casein counters and wind indicators. 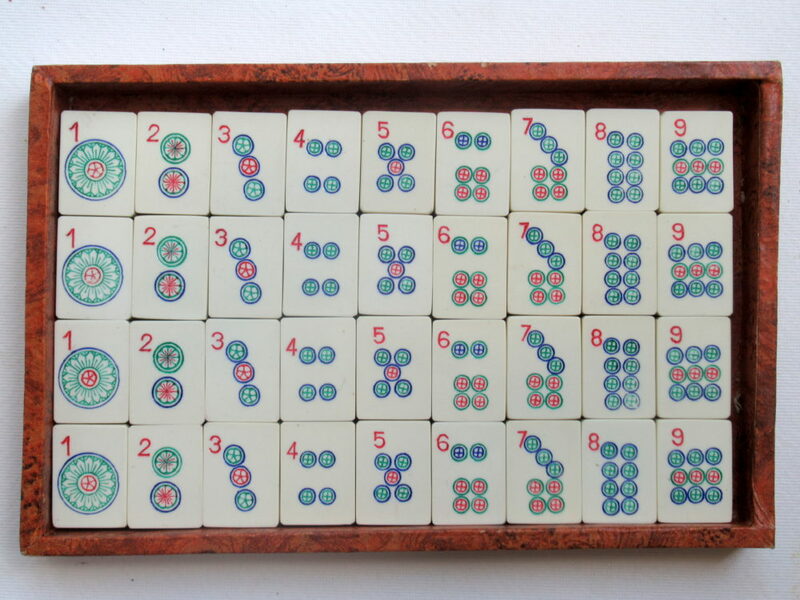 The set was a little scuffed, but a touch-up with matching satin paint disguised that - it now looks pristine. 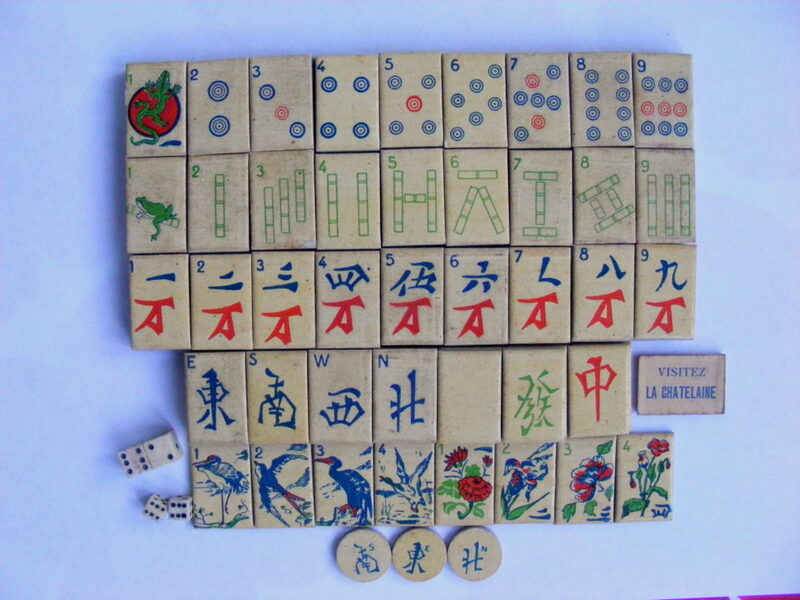 The tiles are made from beech with the top face painted white and the designs printed; they feature the standard Jeu Des Dragons format of Swooping Crane bambird, elaborate serifed Bamboos, complex Circles, complex wan Craks, extra O for West wind, birds for Seasons and vased Flowers. 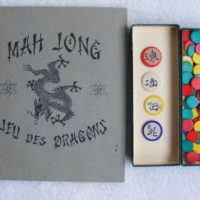 The set comes with a Galeries Lafayette rulebook, instead of the more normal Jeu des Dragons booklet, it does however show the same style of design on the tiles apart from the Flowers which are different. 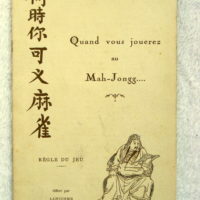 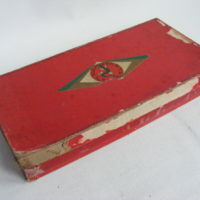 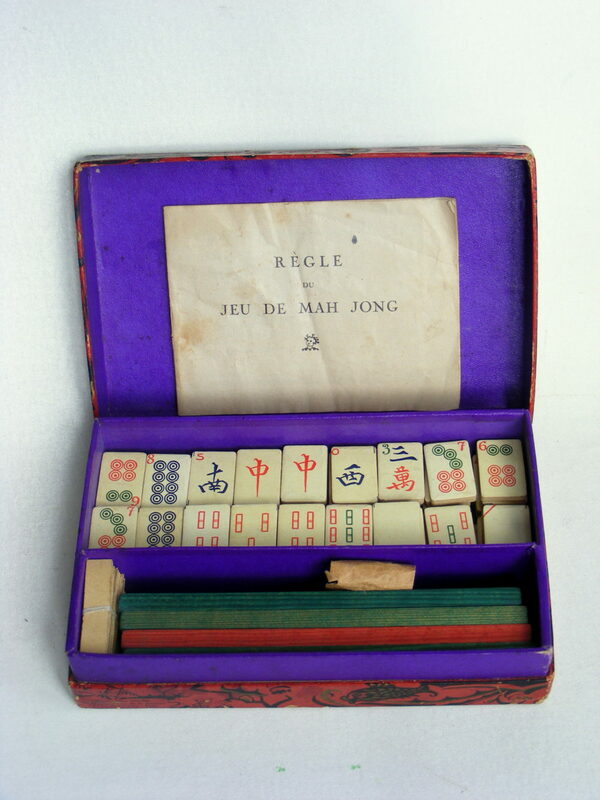 French Jeunesse Red Box Carton Mah Jong Set. 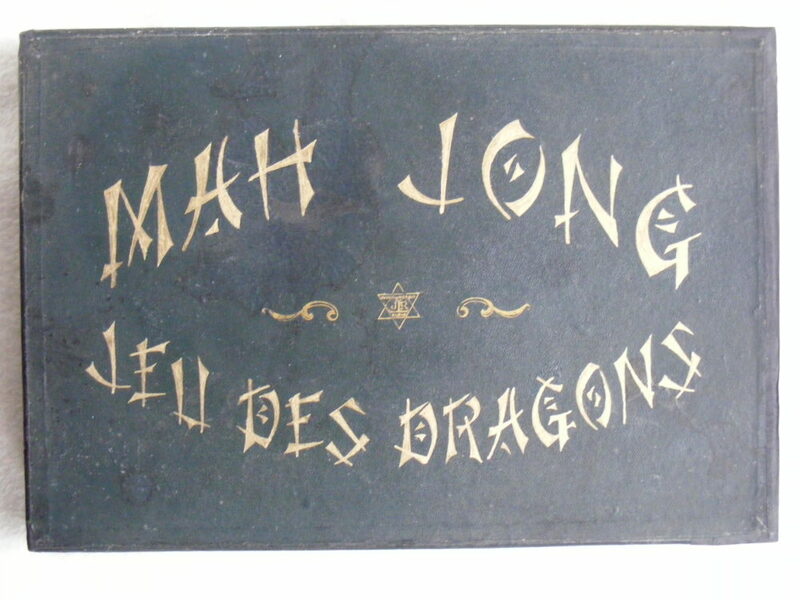 A very unusual set from Maison de la Jeunesse, Paris (Youth House), the flip-top box has a printed paper design in red, black & gold of pseudo-Chinese symbols:- a dragon, pagodas, bridge, phoenix, Chinaman playing a flute, carp, lanterns, kites, pine & plum trees... basically trying to convey the idea of the Orient. 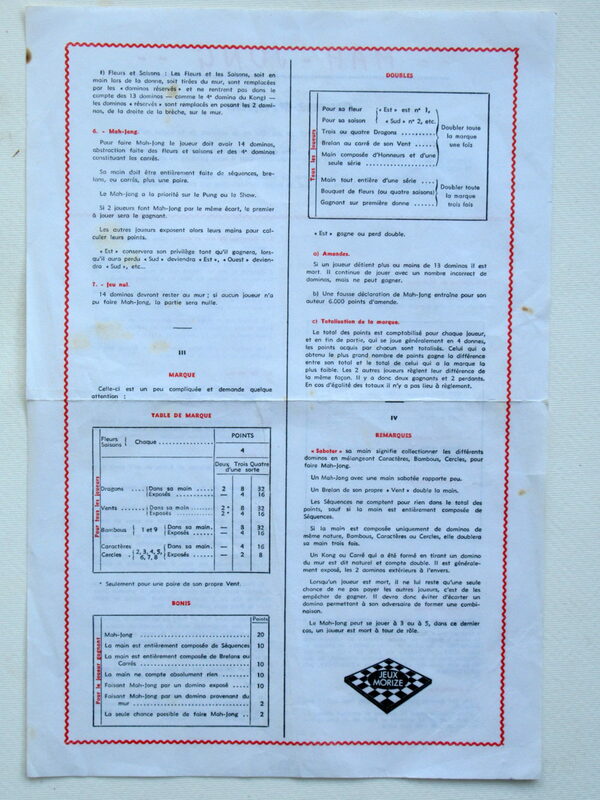 I'm very pleased to get this unusually complete example of the quirky French style. 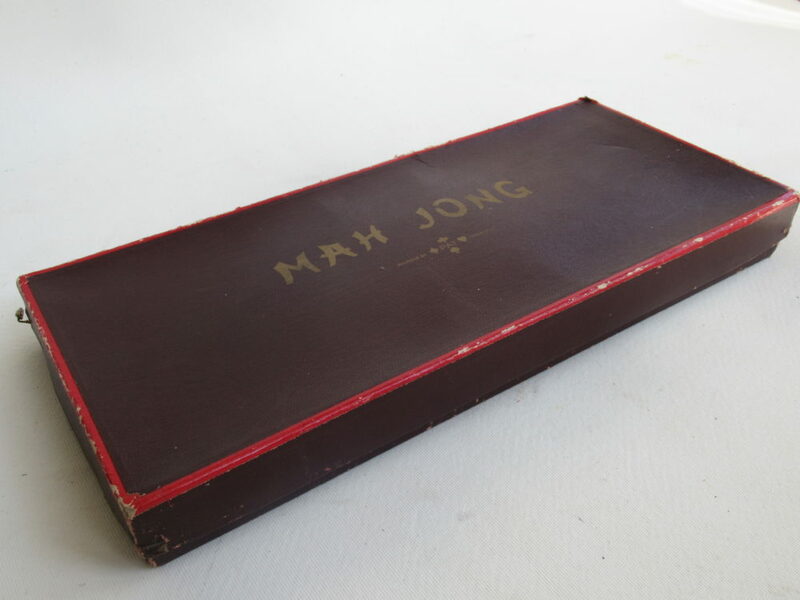 The box measures 200x125x45mm and is quite scuffed and dirty, although structurally sound and hinge in good order; I touched up the scuffs with felt pen and it looks pretty good, I think. 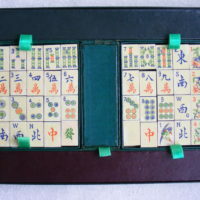 The inside is lined in purple faux leather with 2 compartments, one for the tiles and the other for counters, racks, dice etc. 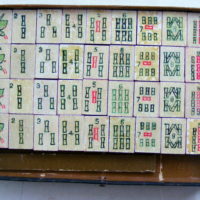 The tiles are made from layers of compressed paper, not cardboard, with a maroon painted backing - some had separated, but were easily glued together; the image is printed on shiny paper, applied to the sheet then cut out. 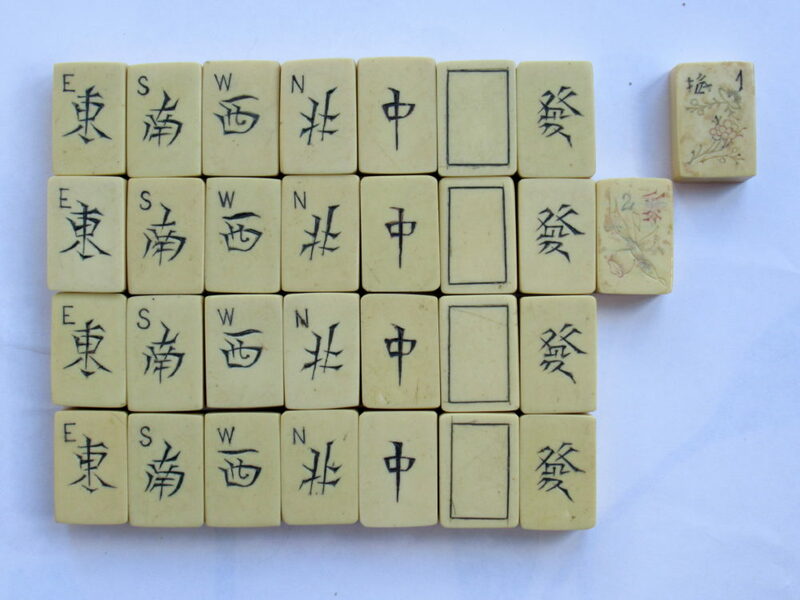 They measure 30x20x5mm, slightly convex on top and concave below (due to the cutting process). 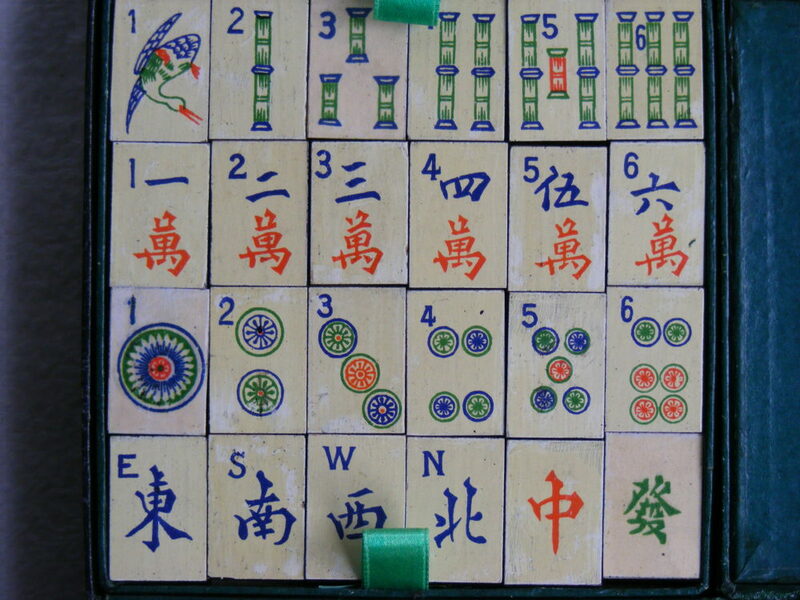 They feature an unusual 'sprout' #1 Bamboo, separated rod Bamboos, simple Circles, complex 'wan' Craks and the French O for West (Oest). 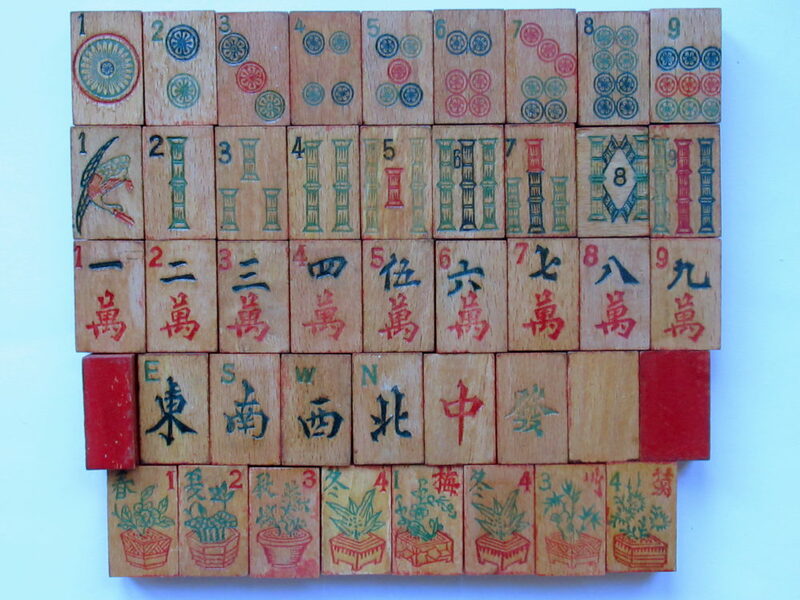 It seems like the Flowers are jumbled, as the Arts have red & green sinograms, evidence that the maker did not understand the significance of the copied designs. 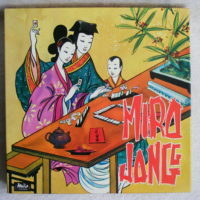 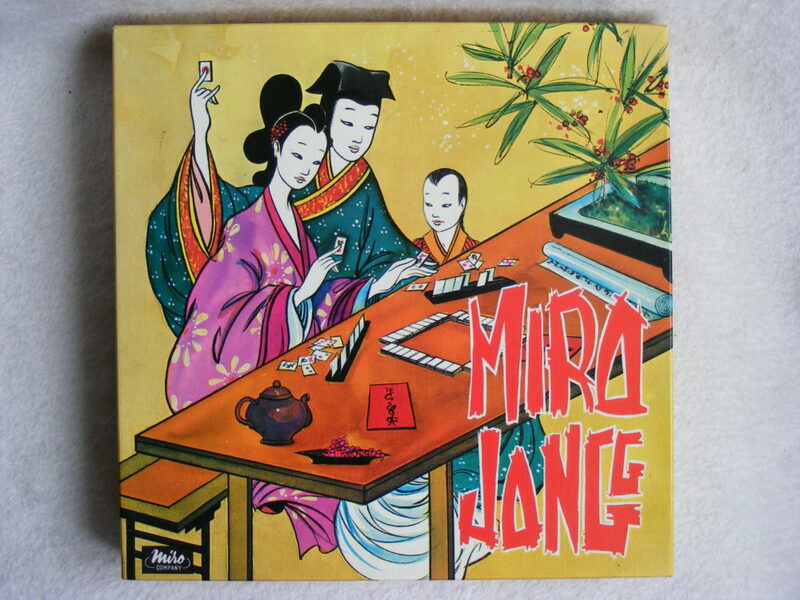 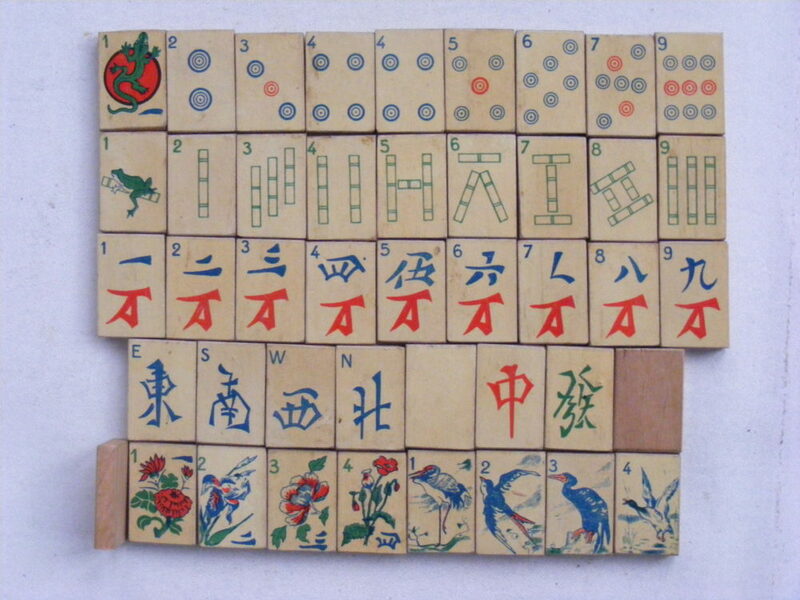 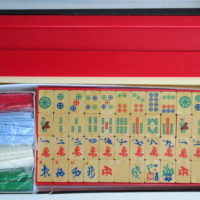 French Miro Cardboard Mah Jong Set. 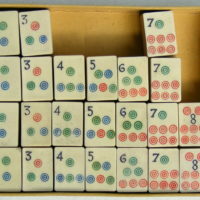 A French simplified version of Mah Jong, cheaply but nicely-made from printed card with racks and rules in French. 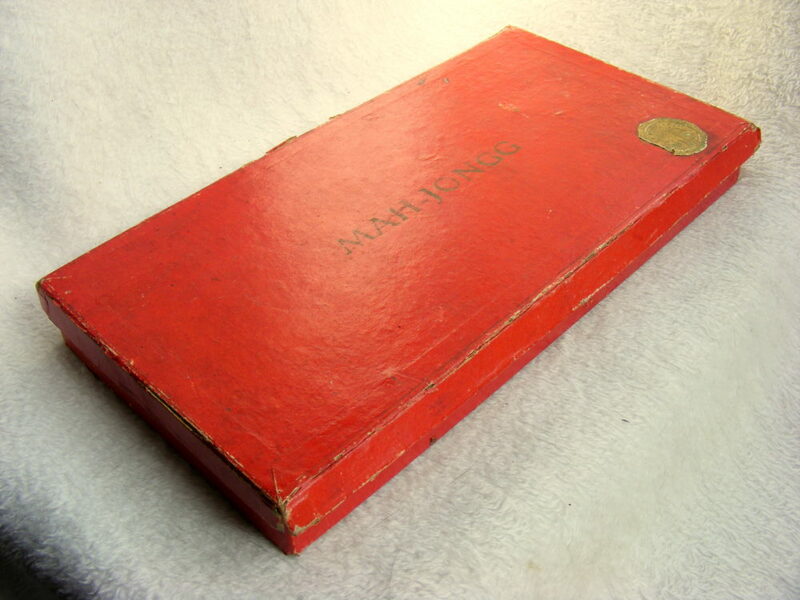 I've been wanting one of these for some time, but most were on eBay France, well used in poor condition and over-priced, so I was very pleased to get this pristine specimen in the UK. 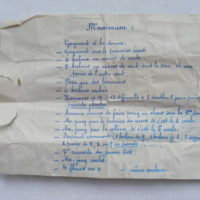 The winds are in French; Est, Sud, Ouest & Nord. 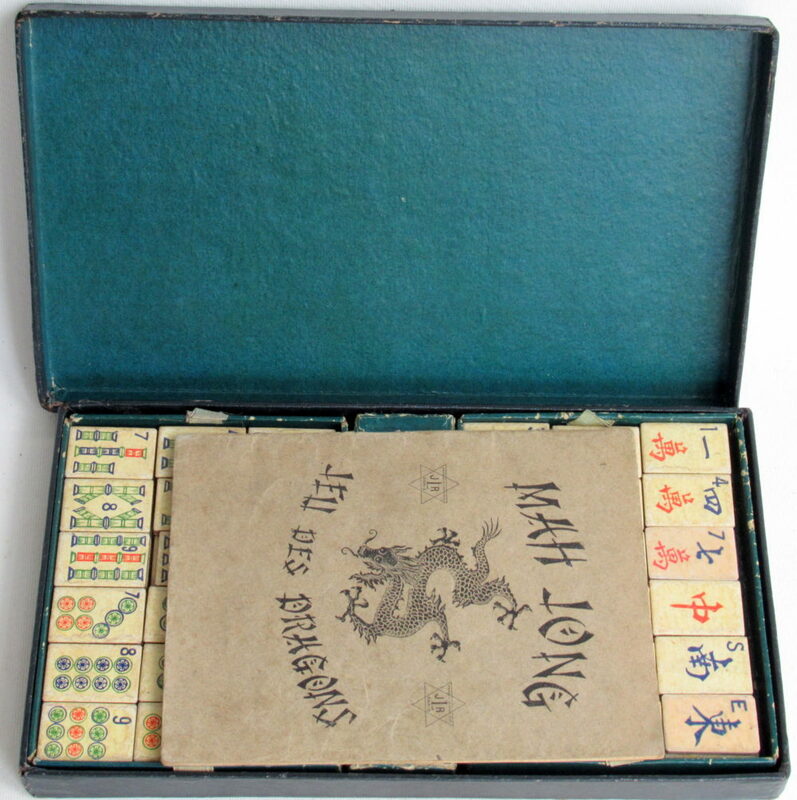 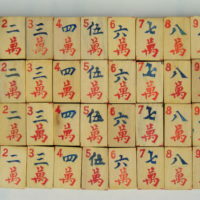 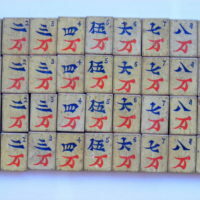 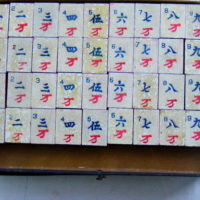 French Red Box MLJ Wood Mah Jong Set. 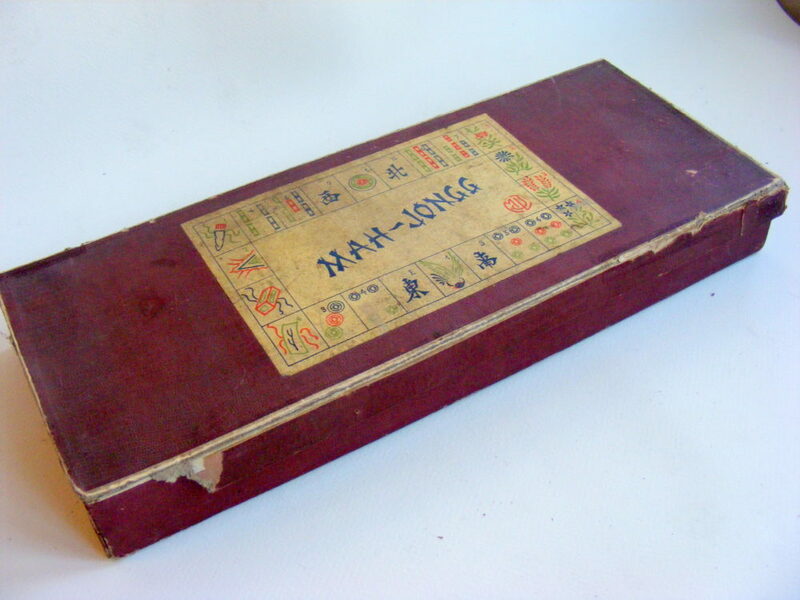 Bought for a song, as I was the only bidder, made by MLJ (Manufacture Lyonnaise de Jouets - nothing to do with Maison de la Jeunesse). 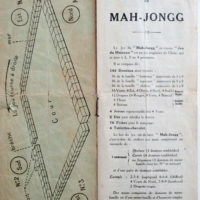 I was intrigued by the designs and I'd not heard of the maker before. 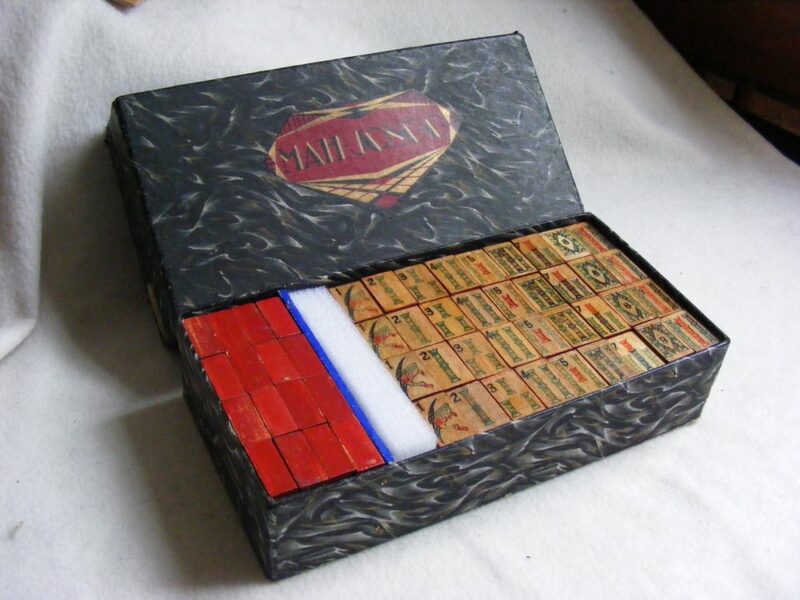 The box is card covered in red paper with an applied label showing most of the tileset, just as well because the pic of the tiles showed hardly any! 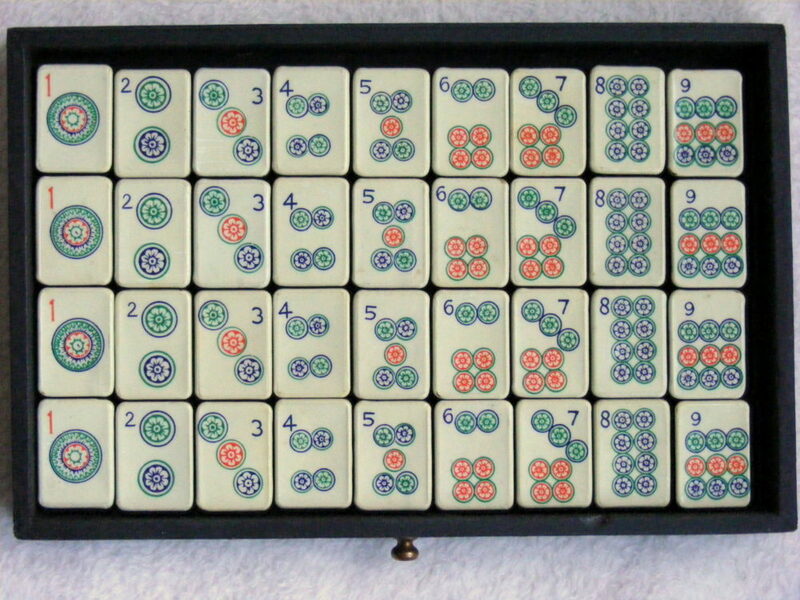 The top is missing half of its sides, but I can fix that. 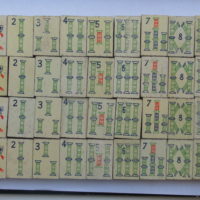 It measures 420x170x40mm, housing 4 racks, the wooden counters and the tiles (advertised as 146, but there are 148) and there is a false bottom to give the impression you are getting more for your money. 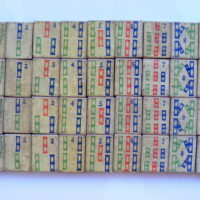 The tiles measure 30x20x8mm, made from wood with an applied printed paper slip, which borrows heavily from Chad Valley. 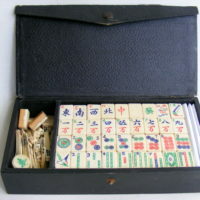 French Faux Leather Box Mini Casein & Wood Mah Jong Set. 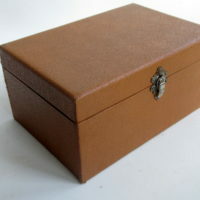 The box measures only 160x110x90mm made from wood covered in faux leather with appliquéd edges and corners to simulate brass. 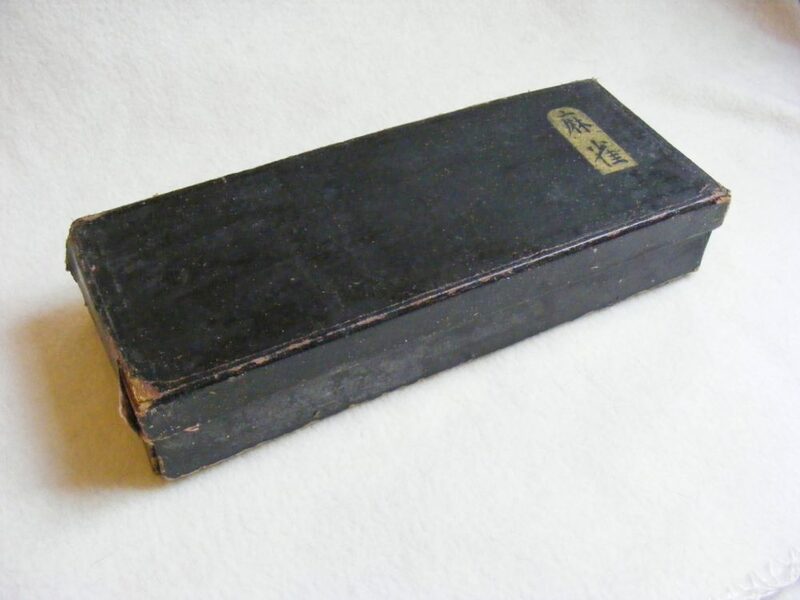 Strangely the handle is is apparently on the wrong side for the opening flap? 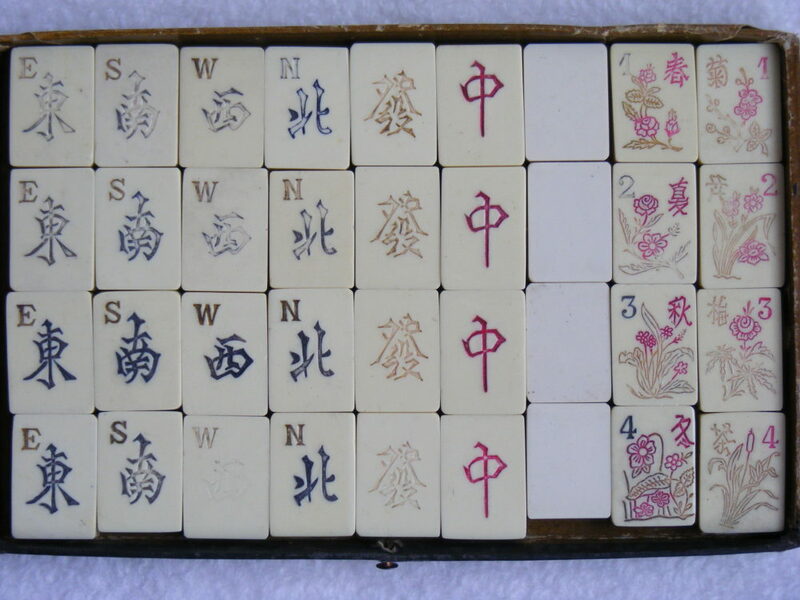 The missing clasp & tiles can be easily recreated - I will pinch the design for the red #2 Flower from elsewhere. 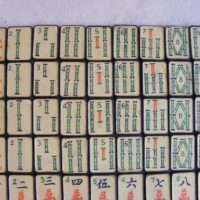 I am so pleased with this! 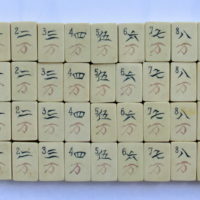 The tiles are small, measuring 22x15x11mm, made from beechwood (?) 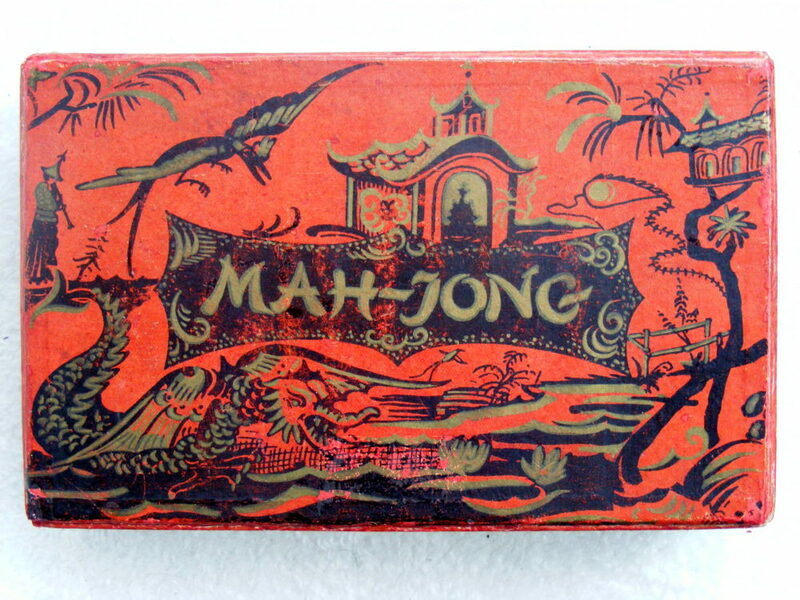 with a 2mm thick wafer of impressed celluloid. 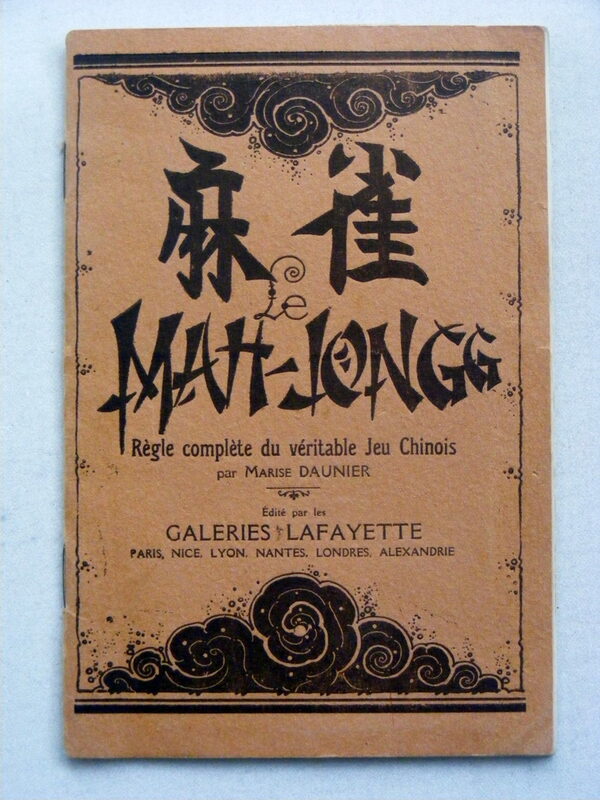 The designs are very unusual, reminiscent of Galeries Lafayette in some undefinable way - love the Bamboos and their arrangement, similarly the Circles, while the Flowers are particularly nice. 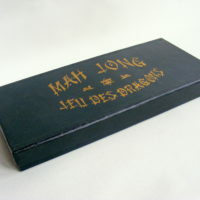 French Leather Box Mini B&B Mah Jong Set. 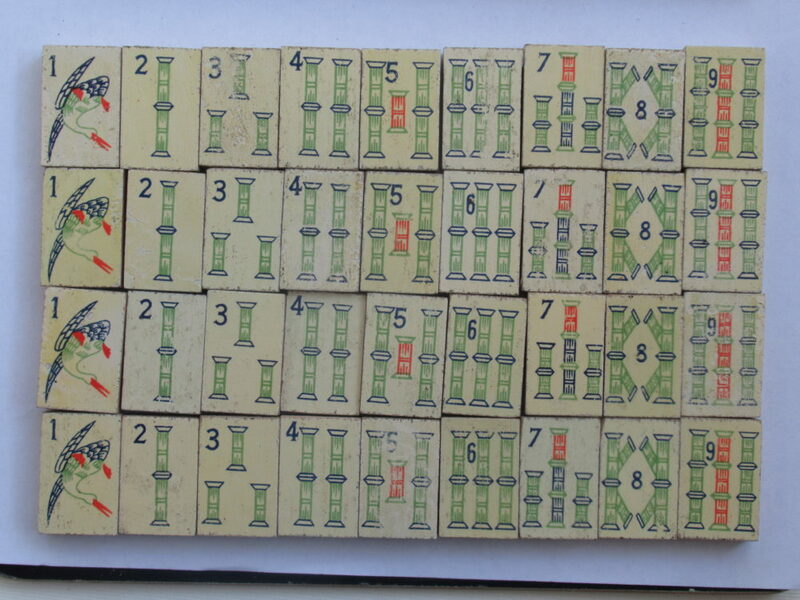 I have a few of these mini sets (mostly from France, so I assume this was the hub of this kind of mini set), but this one was in excellent condition, apart from the very dirty tiles, and missing 2. 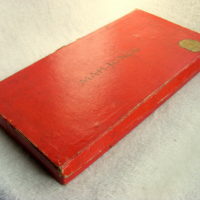 But I got it quite cheaply, the only bidder! 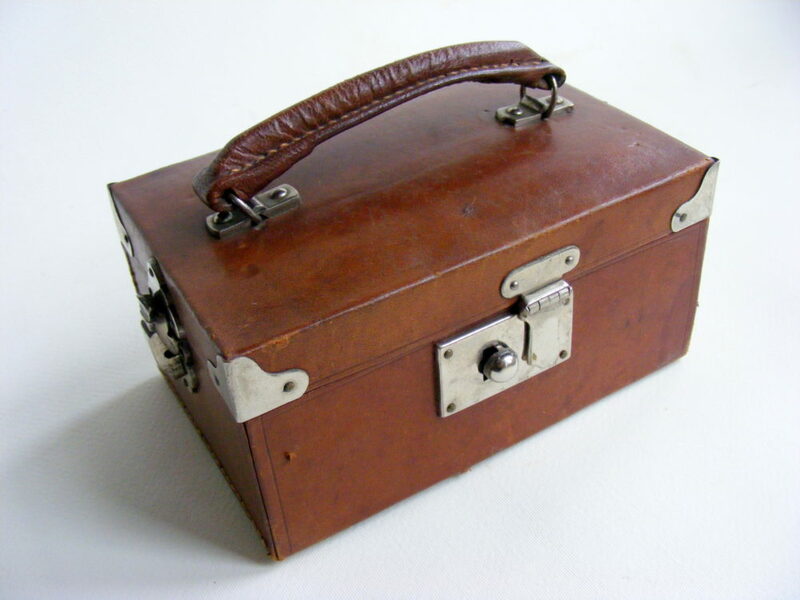 It is in fantastic order, virtually no dings or scratches in the leather, the hinges are all intact as is the catch - a miracle considering it's 95 years old!. 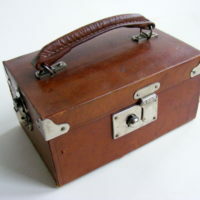 It measures 190x130x95mm, with flip-top, drop-front flap, 1 large and 4 small trays in blue material and leather pulls. 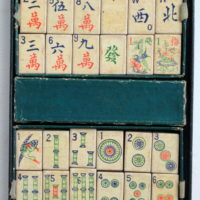 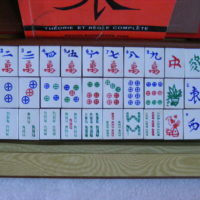 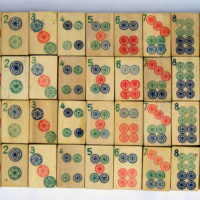 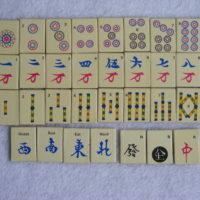 The tiles measure 21x16x9mm with 3mm bone to nice dovetails, featuring simple Circles, displaying Peacock Bambird, joined rod Bams, simple wan Craks and standard Winds, Flowers and Dragons. 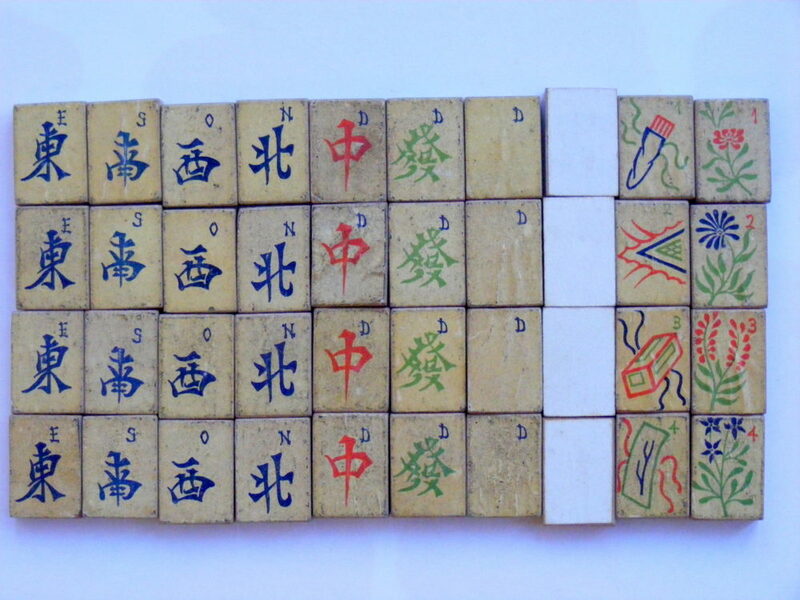 The tiles will clean up nicely and I will carve 2 of the spares to make the missing tiles. 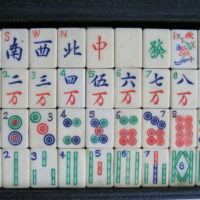 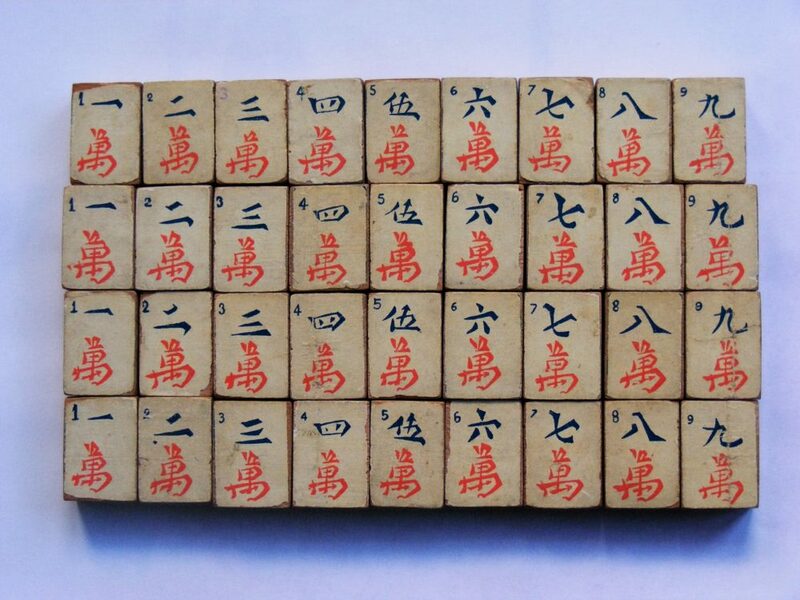 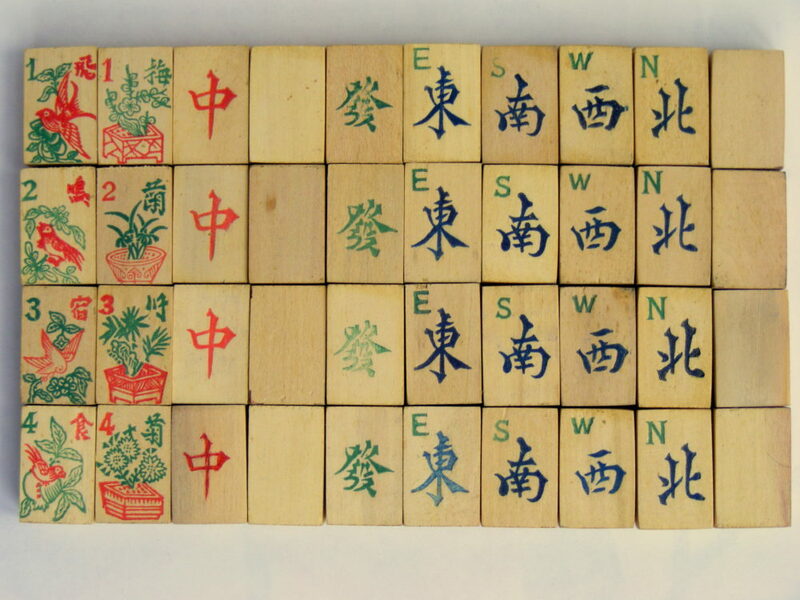 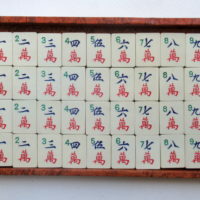 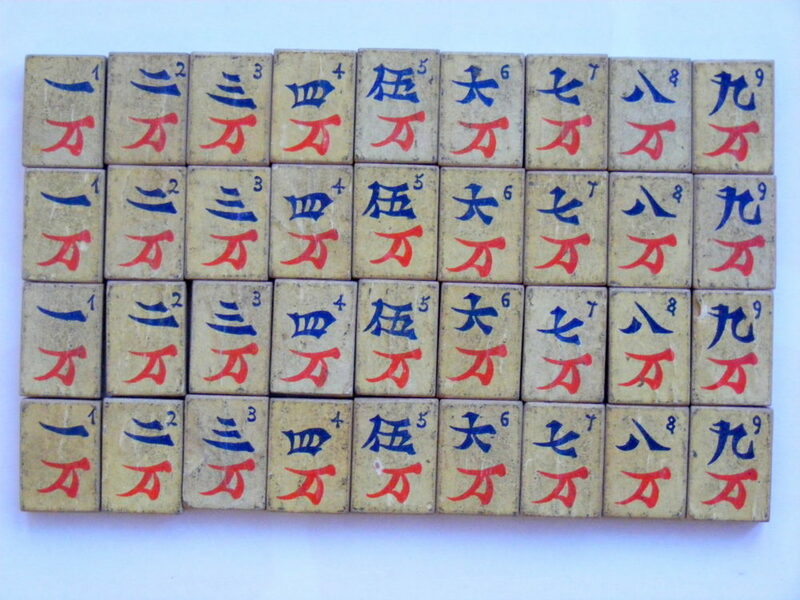 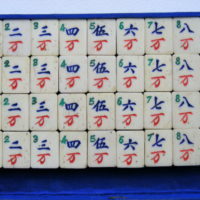 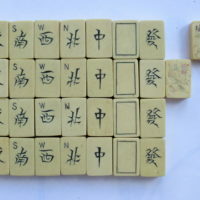 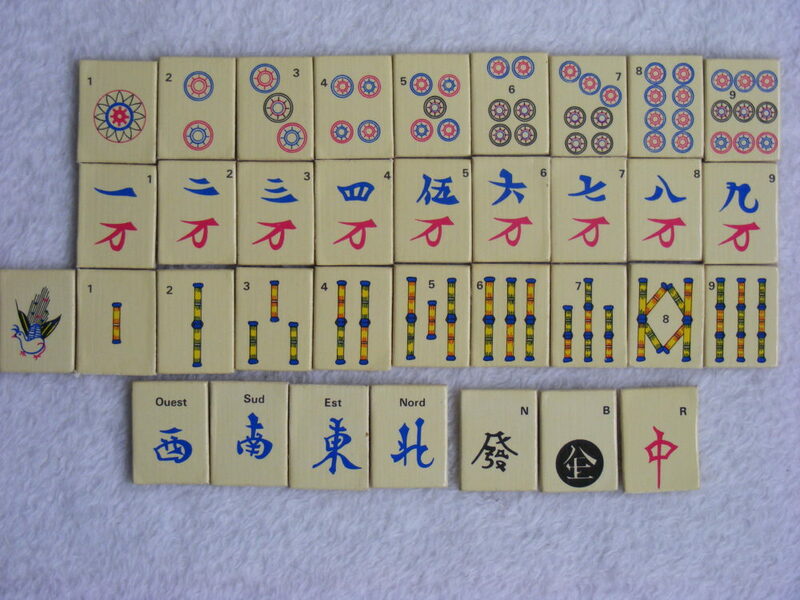 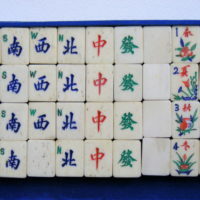 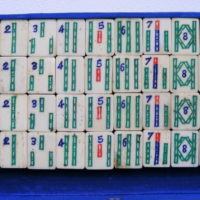 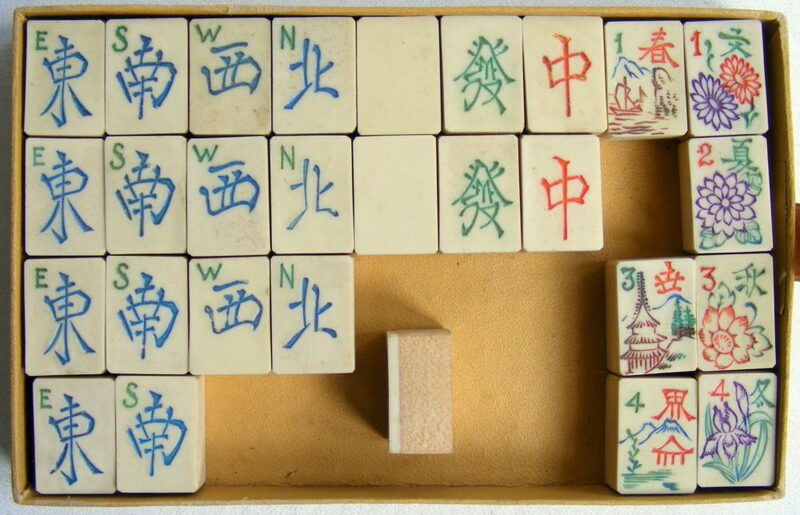 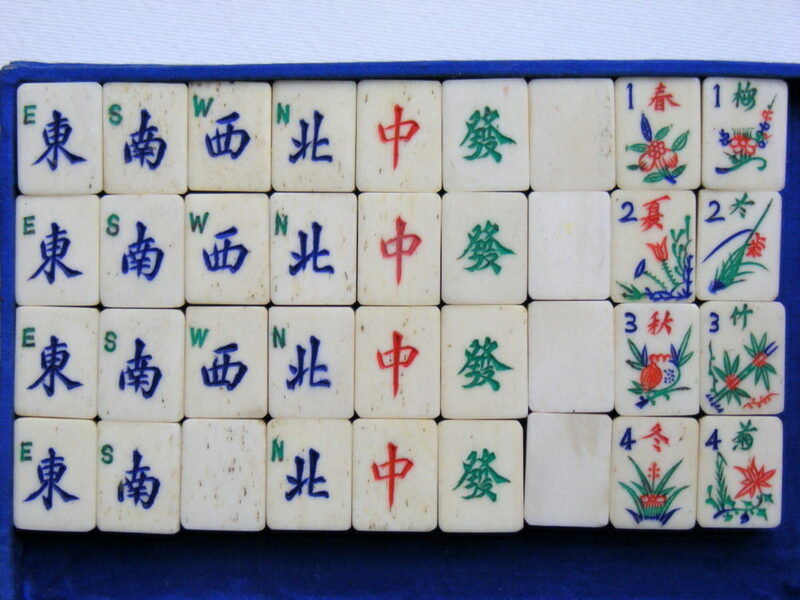 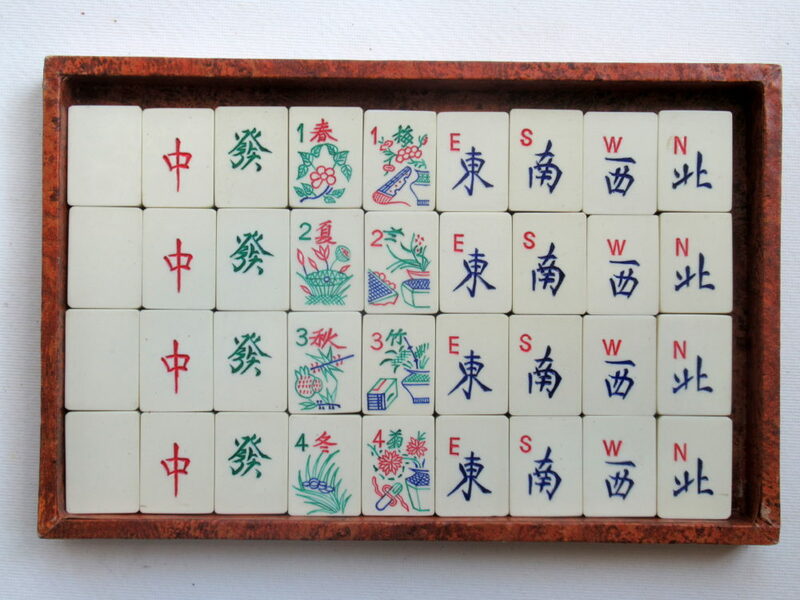 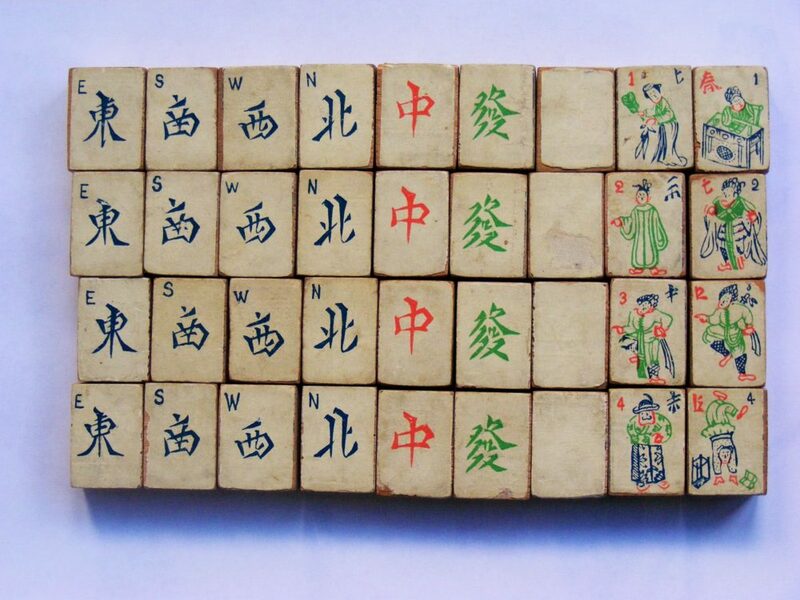 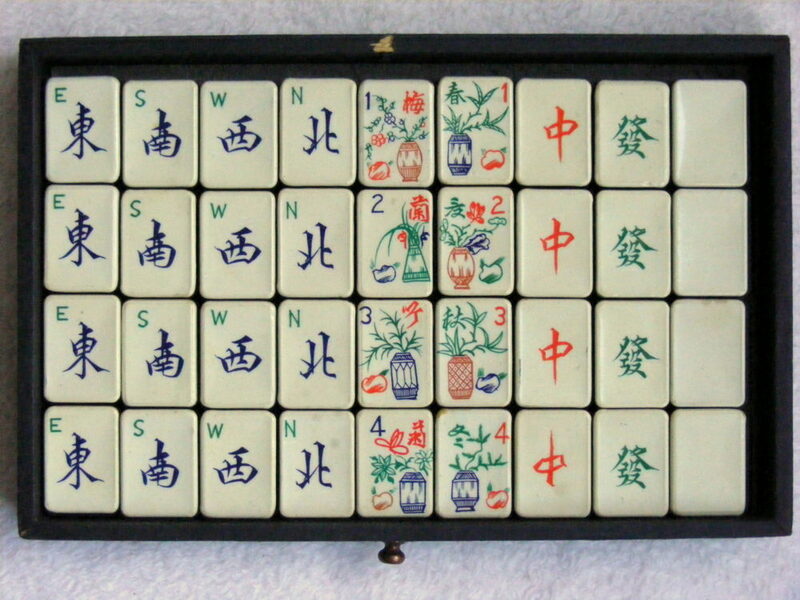 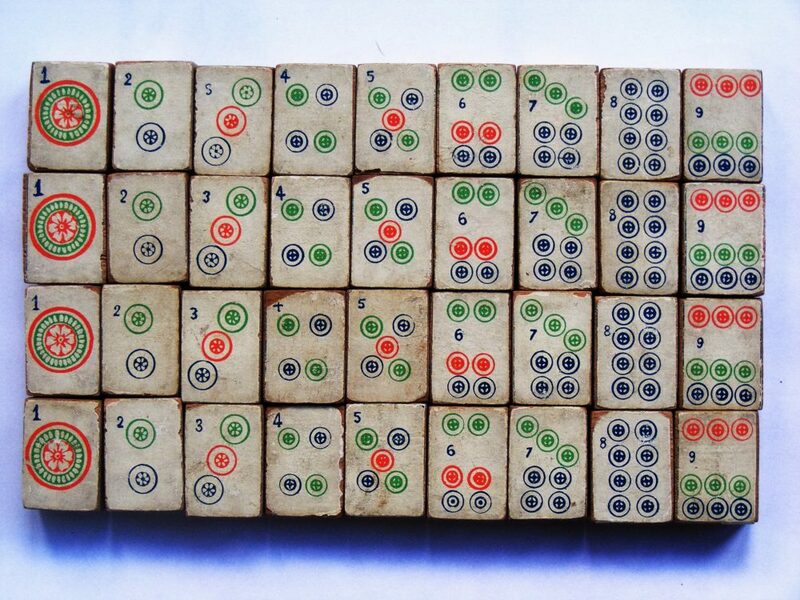 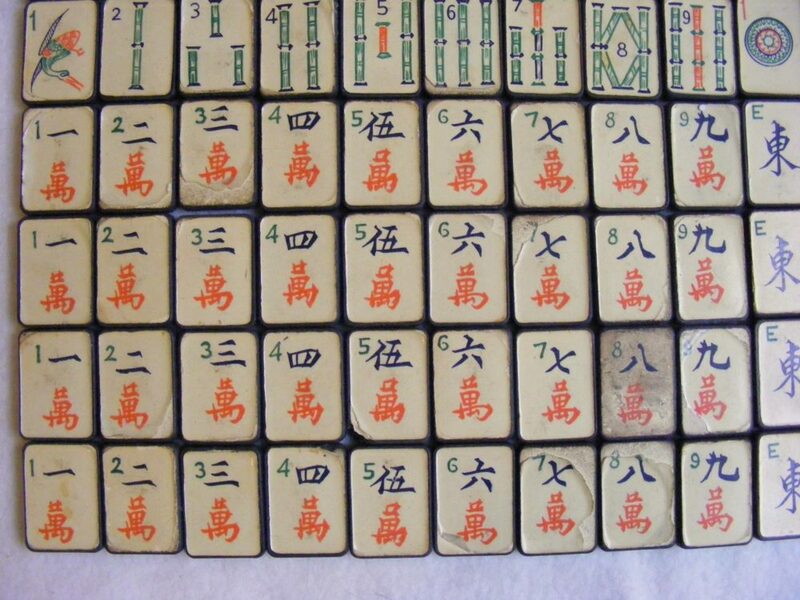 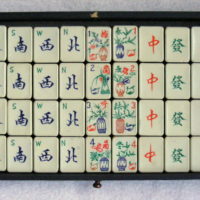 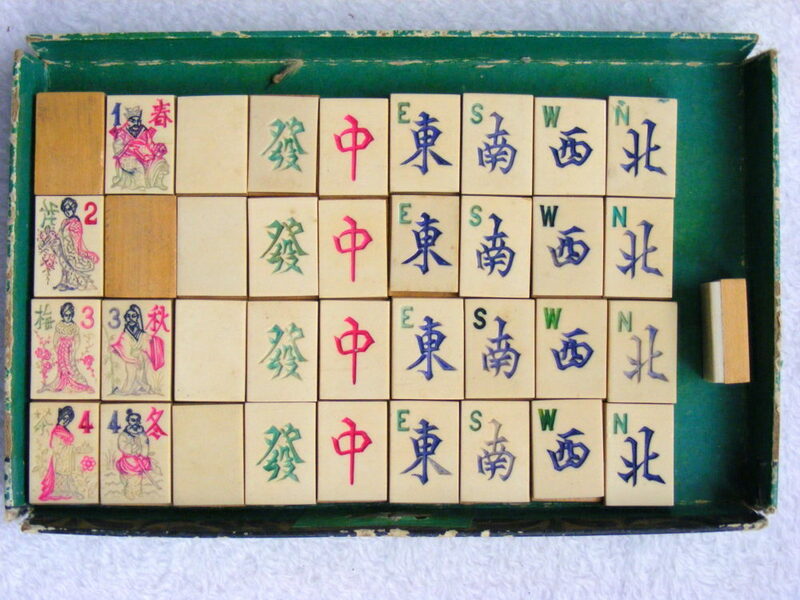 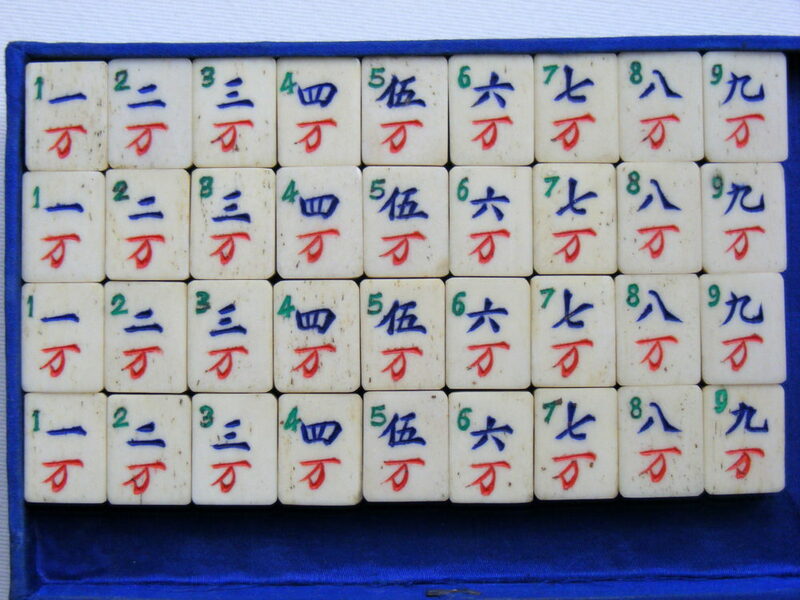 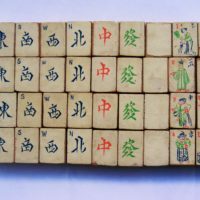 French Chinese Small Bone&Bamboo Mah Jong Set. 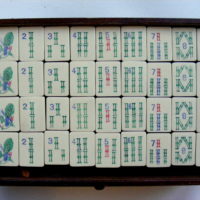 This set was bought from a French lady - it belonged to her aunt who could no longer play with the tiny tiles because of arthritis. 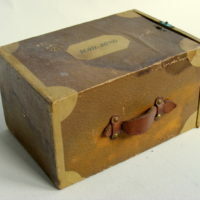 It was in a bad cosmetic condition; it was originally covered in yellow gesso, which was crazing, flaking and generally nasty, so I scraped it all down to the wood. 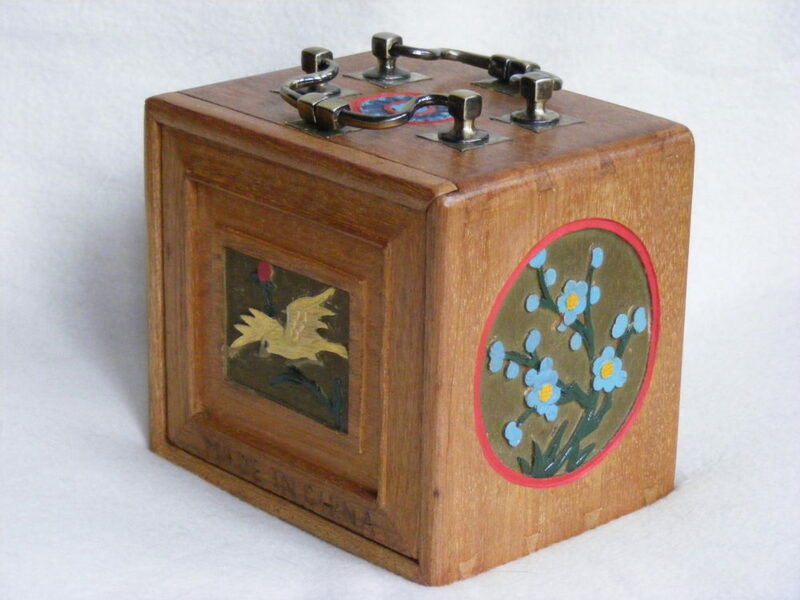 One of the original handles was missing, so I took the decision to replace them with new antiqued brass ones; there was a crack down the side, dints and holes which were glued and filled, then the paint re-done, finally 3 coats of Danish oil followed by wax and buffing. 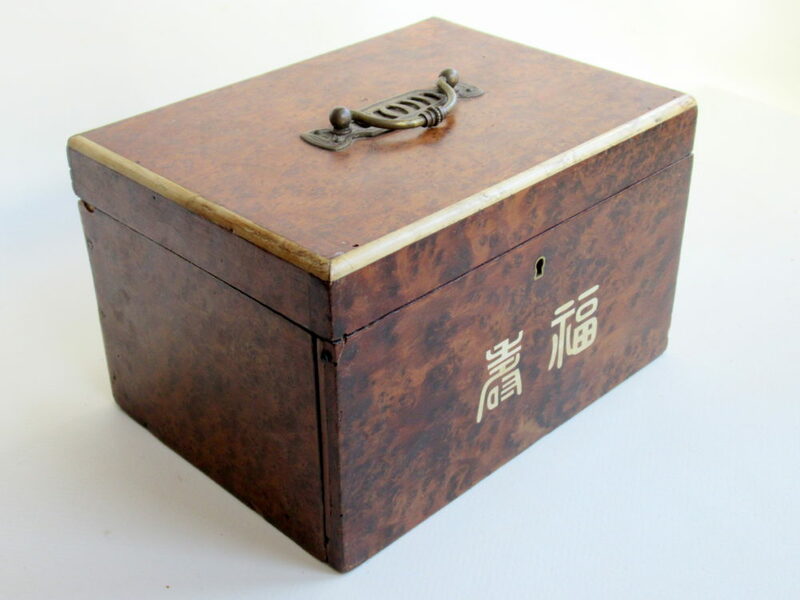 The box is made from teak, I think, measuring 160x150x130mm with lift door revealing 5 drawers with bone knobs. 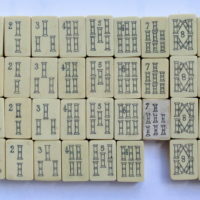 The small tiles measure 21x16x10mm with 5mm bone to small dovetail, featuring quirky strutting Bambird, joined rod Bams, simple Circles, simple wan Craks, standard Winds, Dragons and Flowers; the Arabics have been added afterwards. 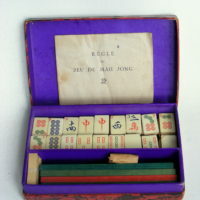 French Maroon Box Printed Wood Mah Jong Set. 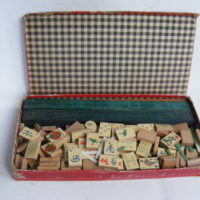 The box measures 305x135x35mm made from card covered in maroon paper with lift-top lid revealing 3 compartments; 2 for the tiles in 3 layers of 6x4 and a central lidded section for the polystyrene counters, indicators and painted wood dice, polystyrene indicates 1950s at the earliest. 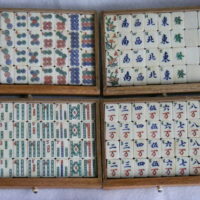 Normally these sets are wood with a paper slip glued on, but these tiles are painted white and the designs printed on top then sealed with shellac. 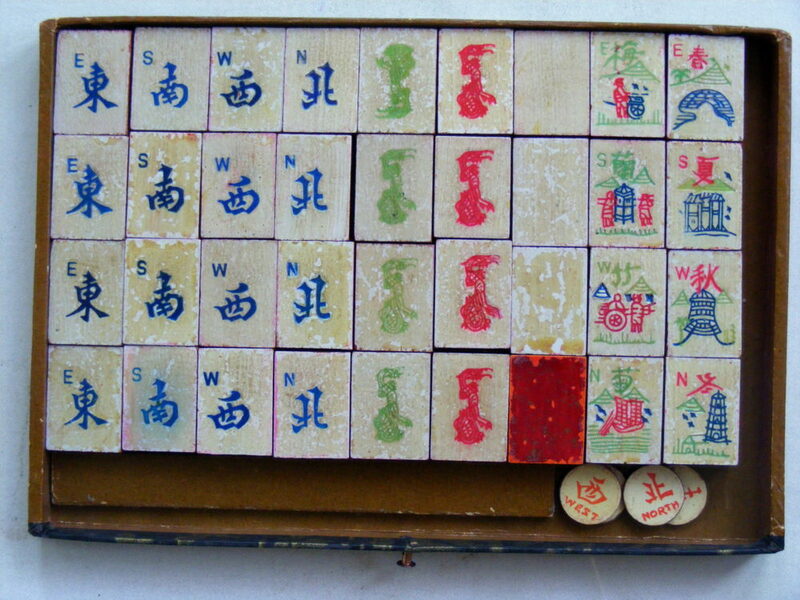 No makers mark, but the logo is MAH JONG with Marque de Fabrique and PAT in the centre of 4 card suits. 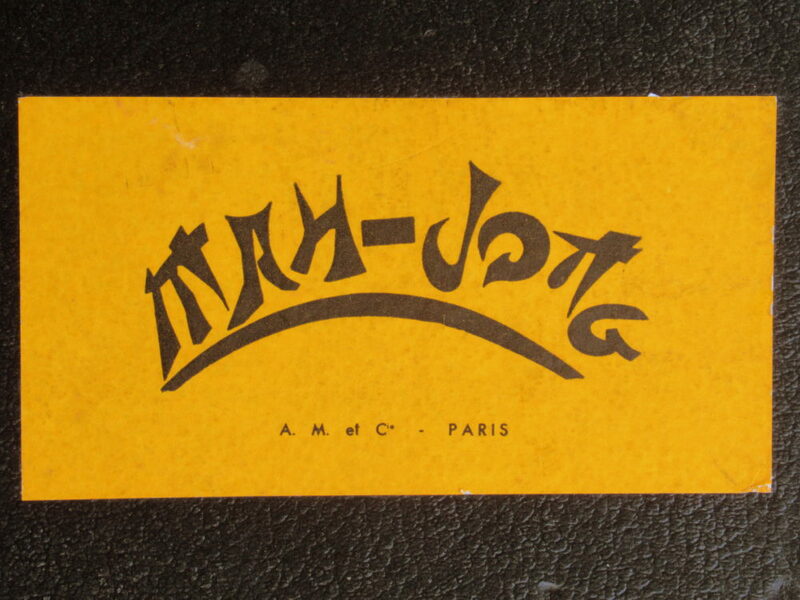 There is a sticker for Au Nain Bleu in Le Havre, which I guess is the retailer. 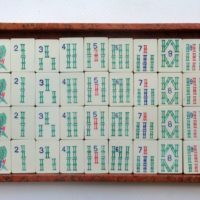 The beechwood tiles measure 30x20x8mm with very similar designs to Chad Valley and Imperial, but different Flowers and subtle variations on the other suits. 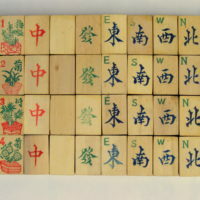 Notice that the flowers are identical in design to GL6e. 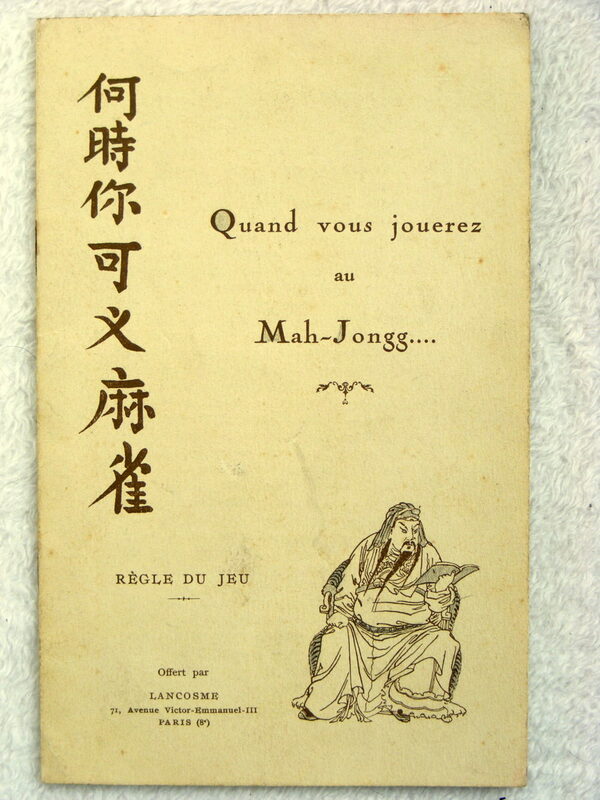 French Lung-Chan? 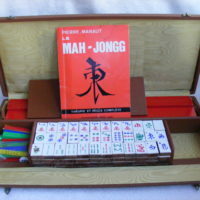 Faux Leather Case B&B Mah Jong Set. 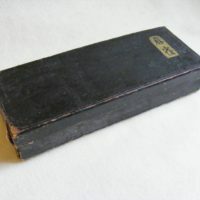 The case, measuring 260x130x55mm is made from wood & heavy card covered in black faux shagreen with flip-top popper cover revealing 2 compartments for the tiles and the counting sticks. 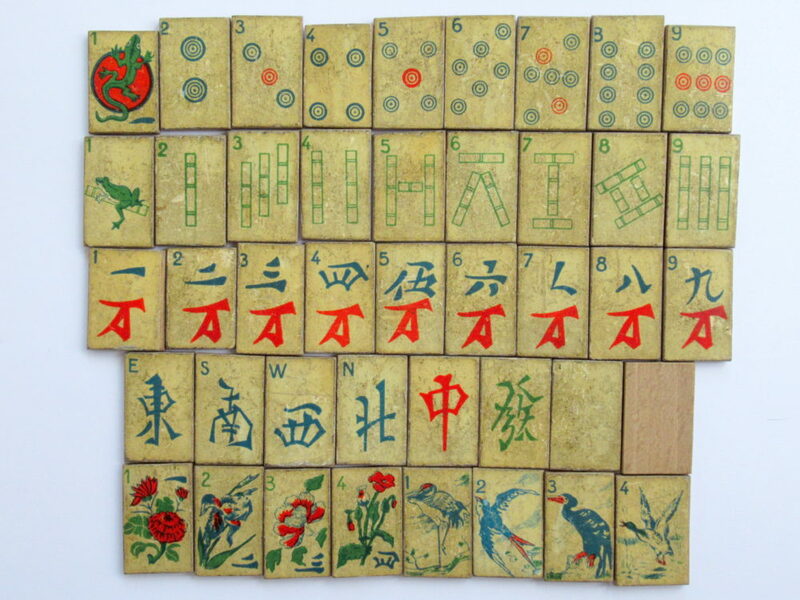 The tiles are early B&B measuring 27x19x12mm with 4mm bone to dovetail, featuring fat swooping sparrow bambird, joined rod bamboos, simple circles, simple craks and standard plants and scholarly arts for flowers. 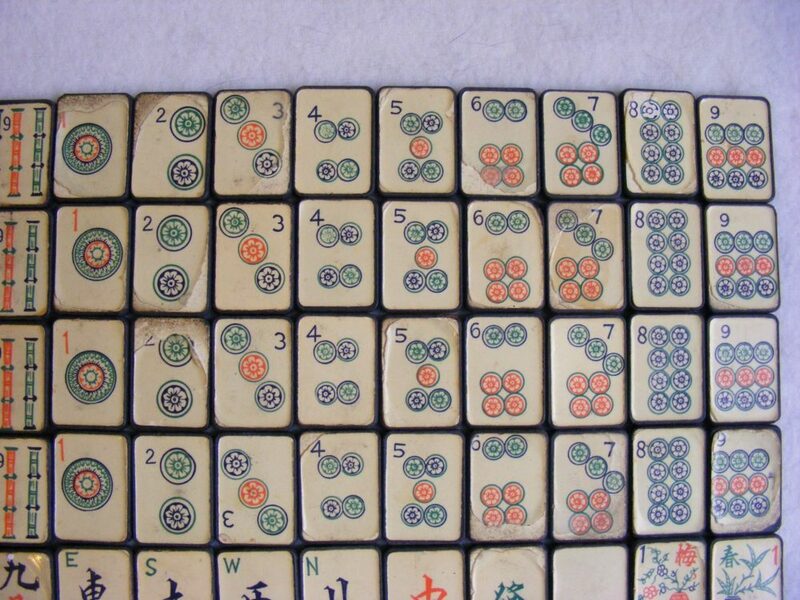 The counters are bone and it has a complete bone ming, 4 bone dice and 4 spare tiles. 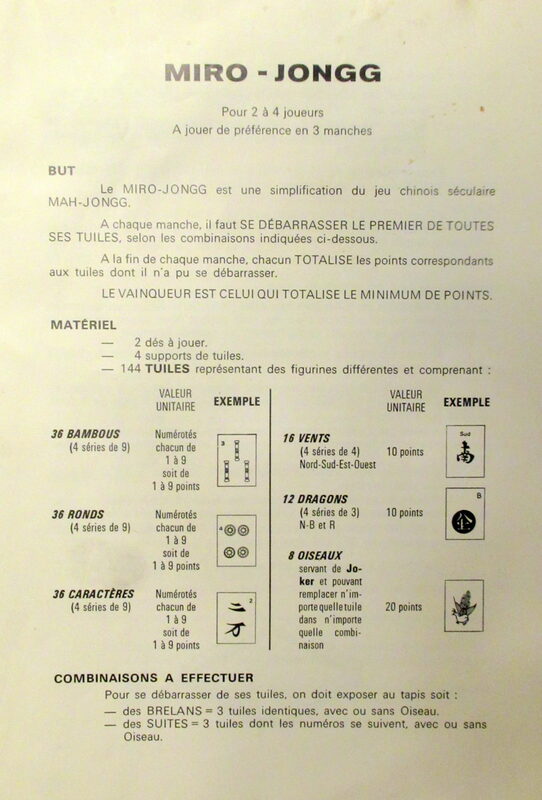 It came with Chad Valley 8th Edition and French Lung-Chan rulebooks, but I suspect the Chad Valley is spurious.